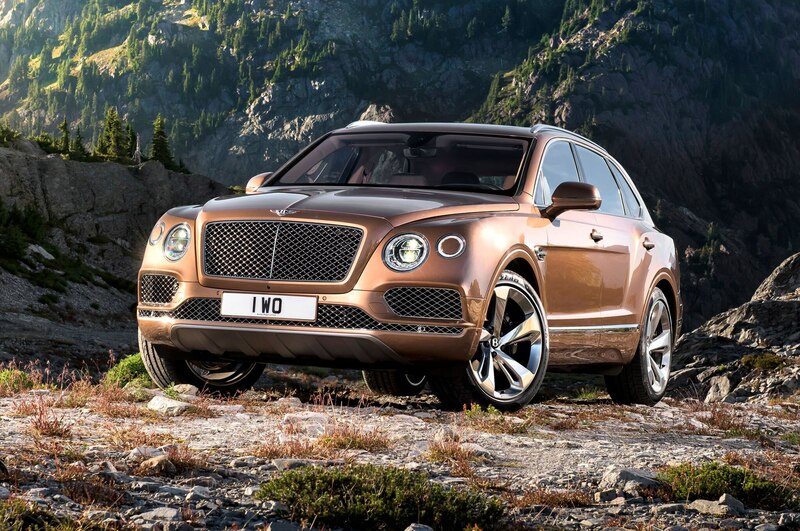 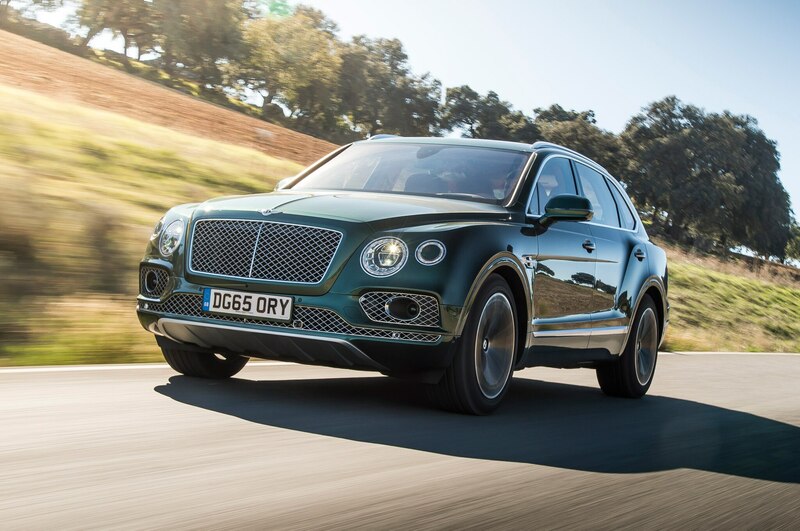 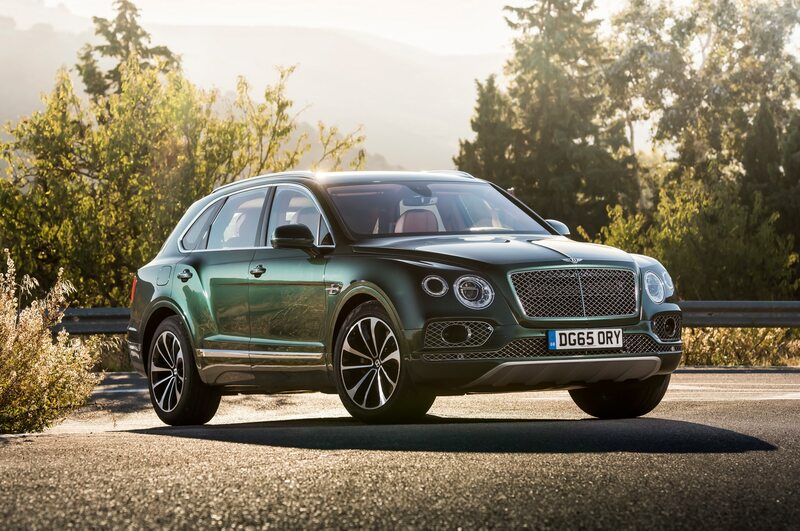 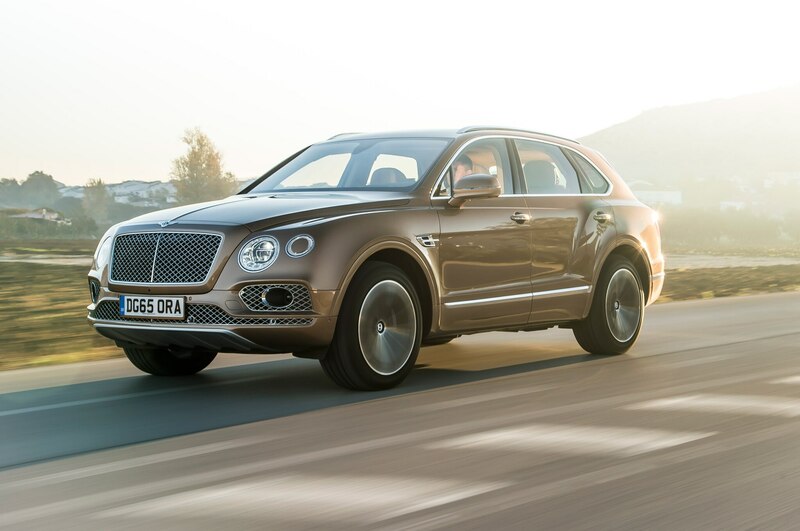 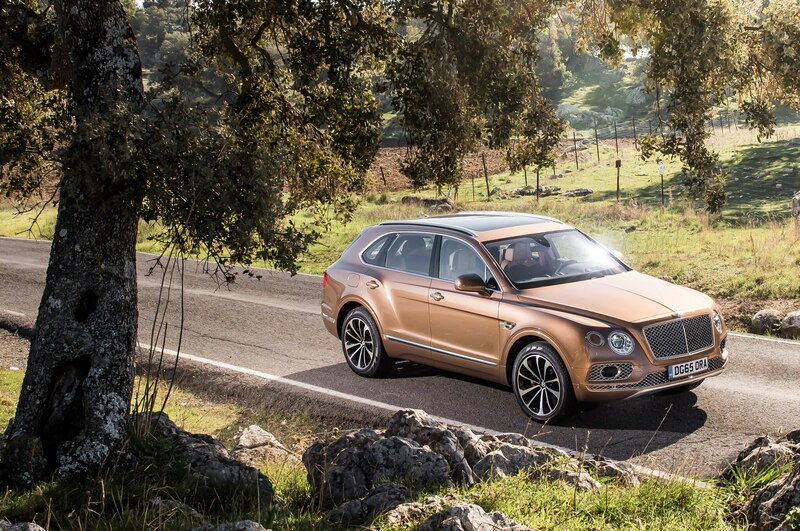 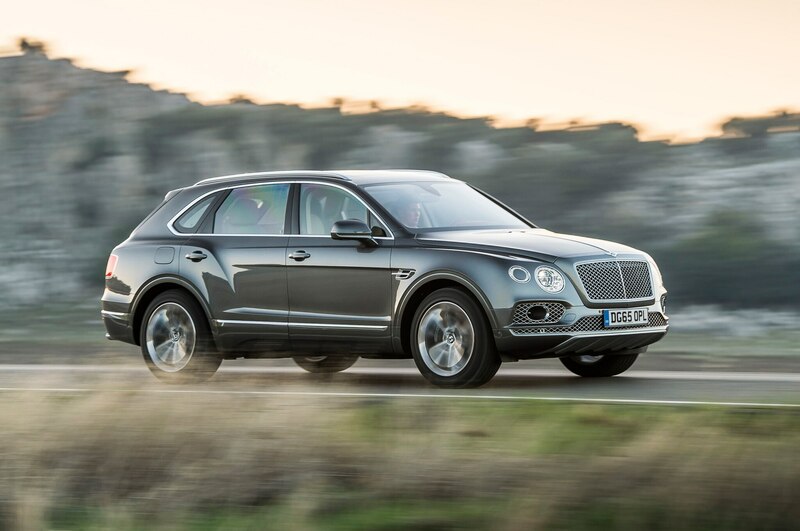 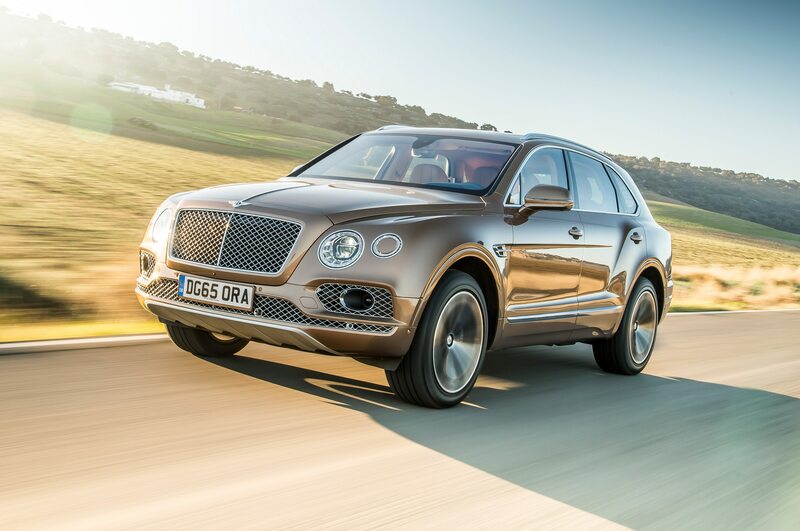 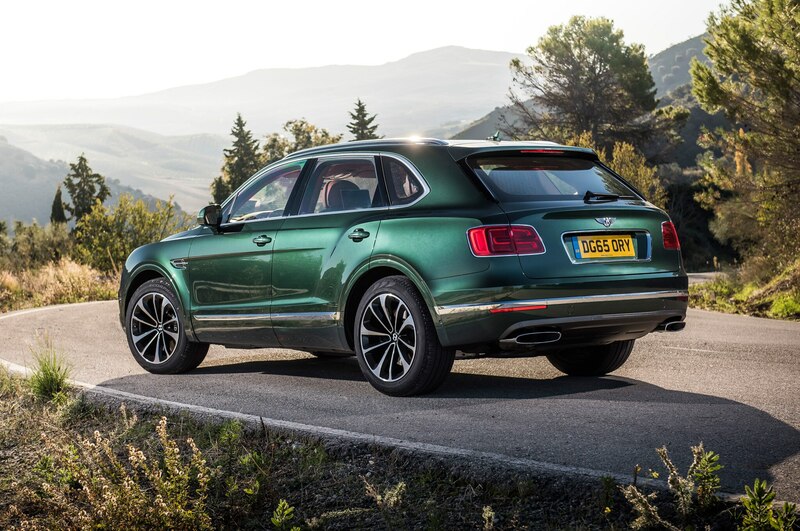 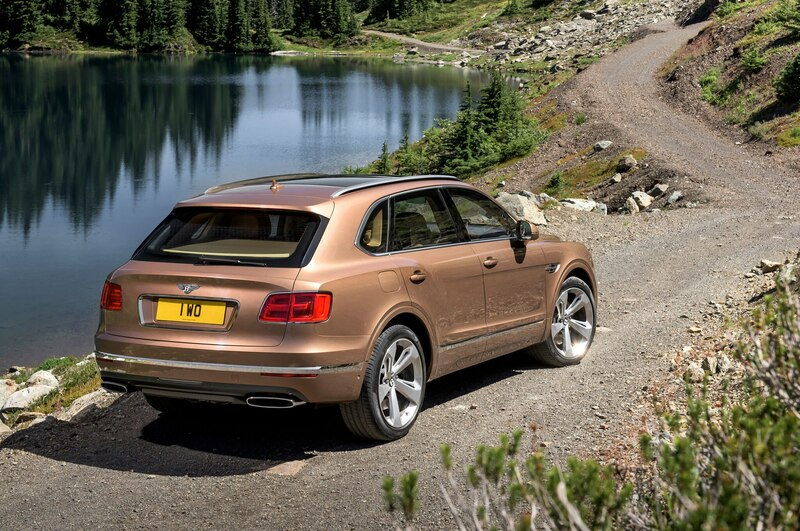 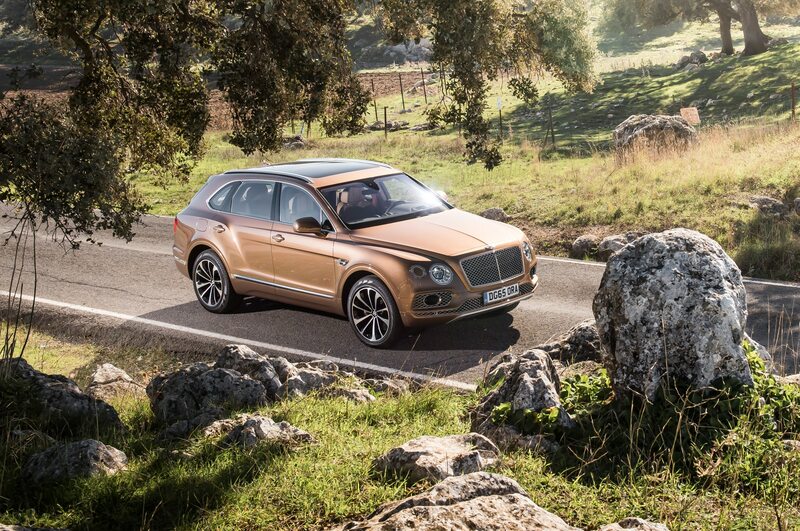 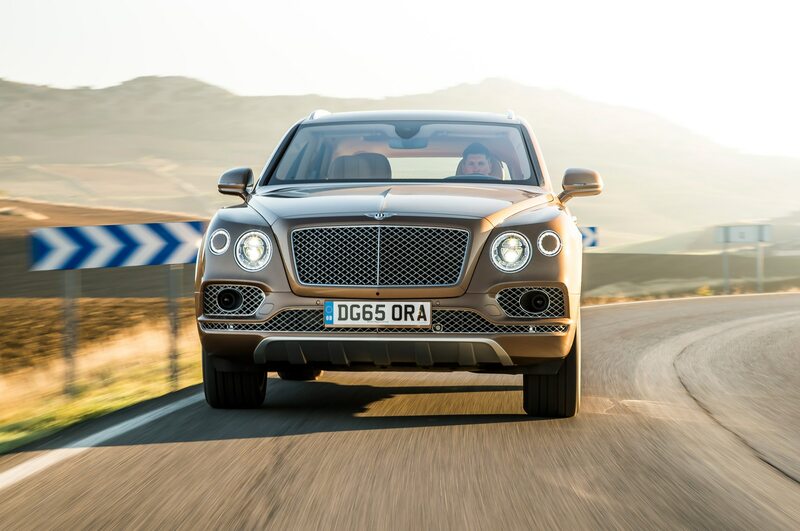 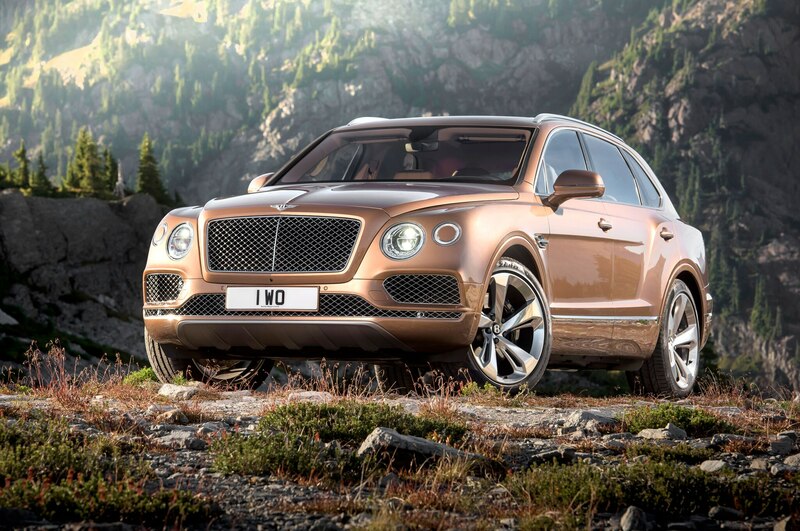 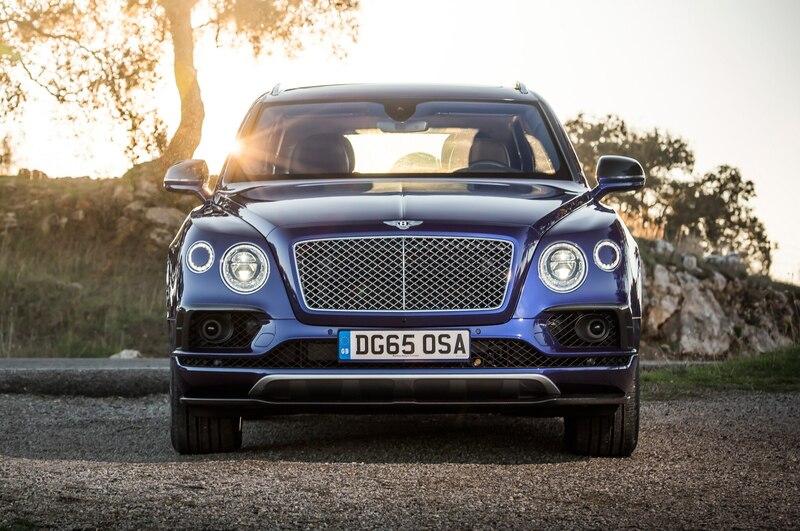 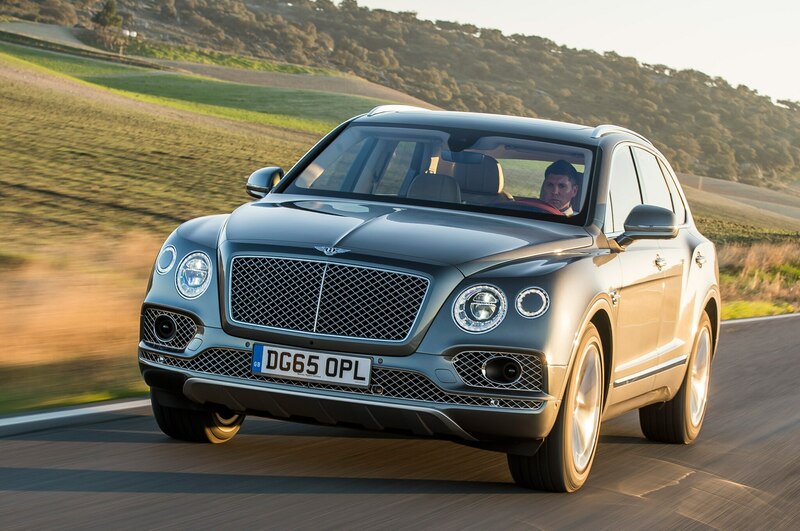 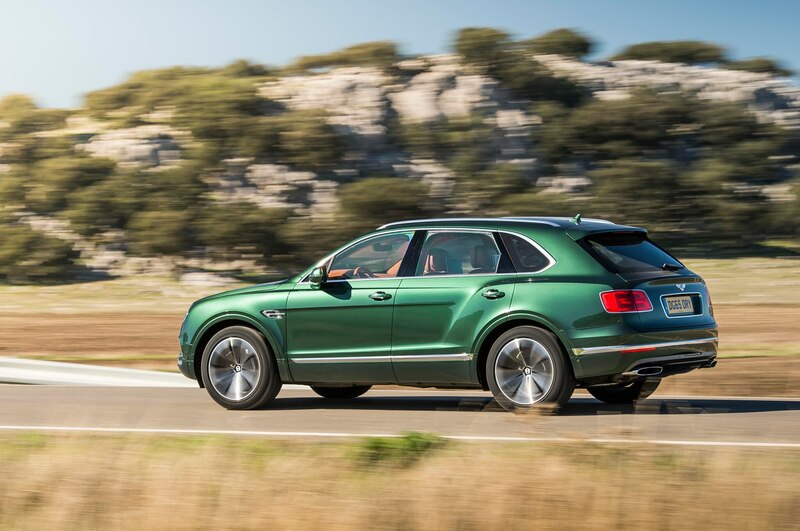 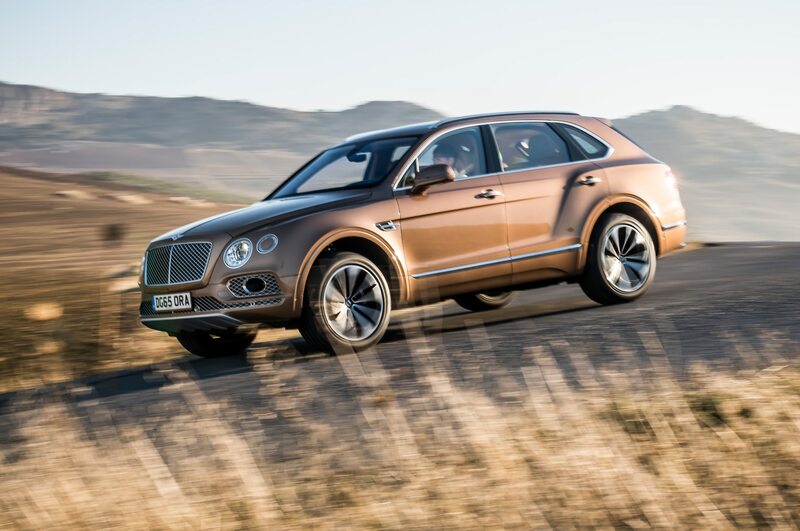 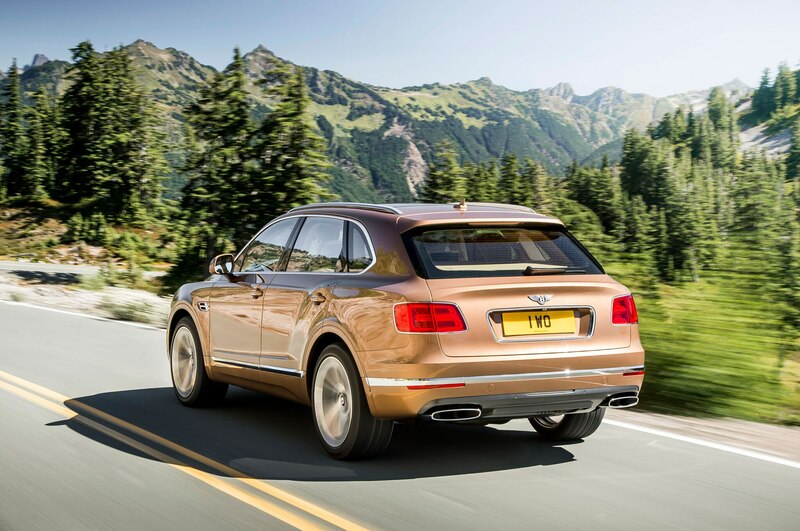 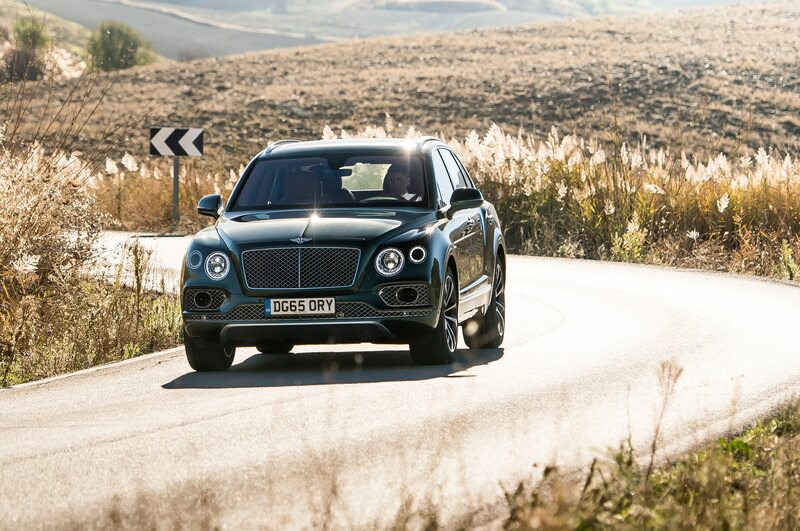 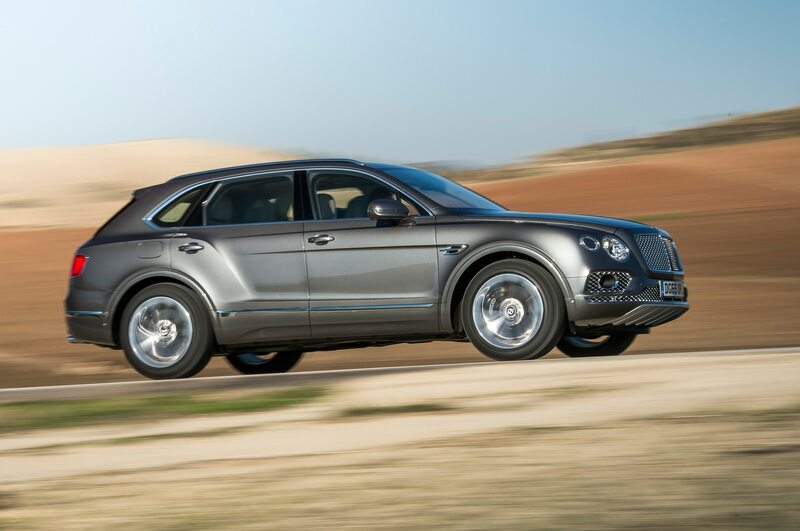 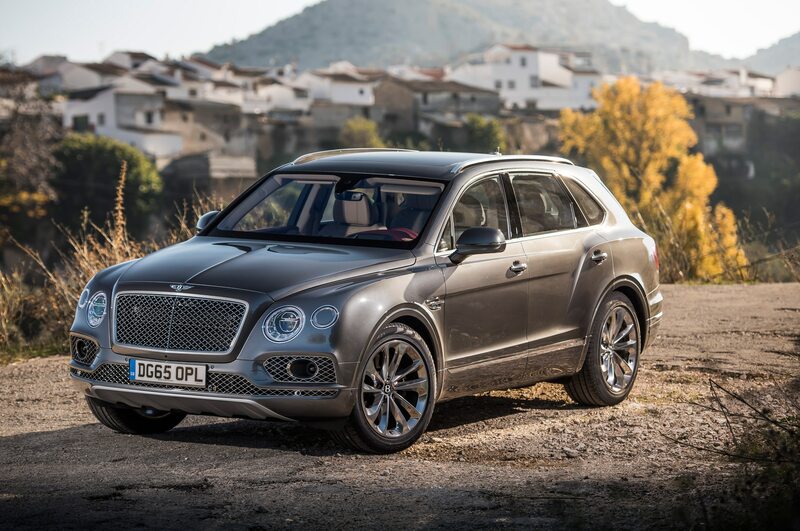 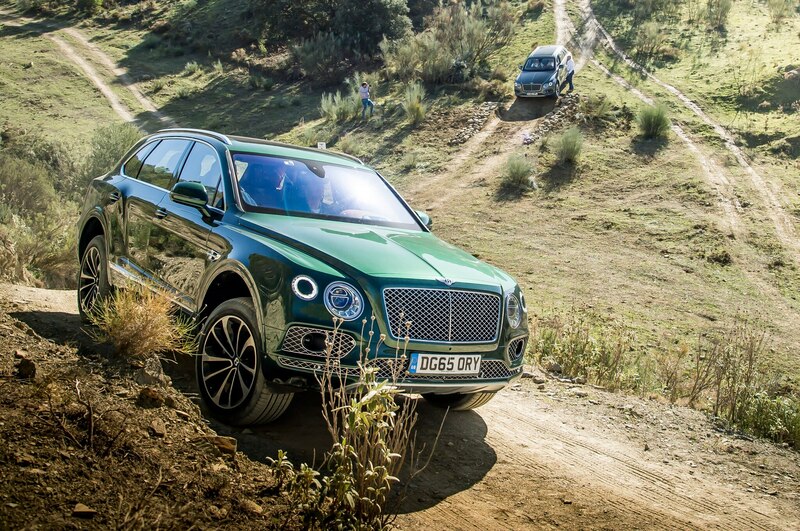 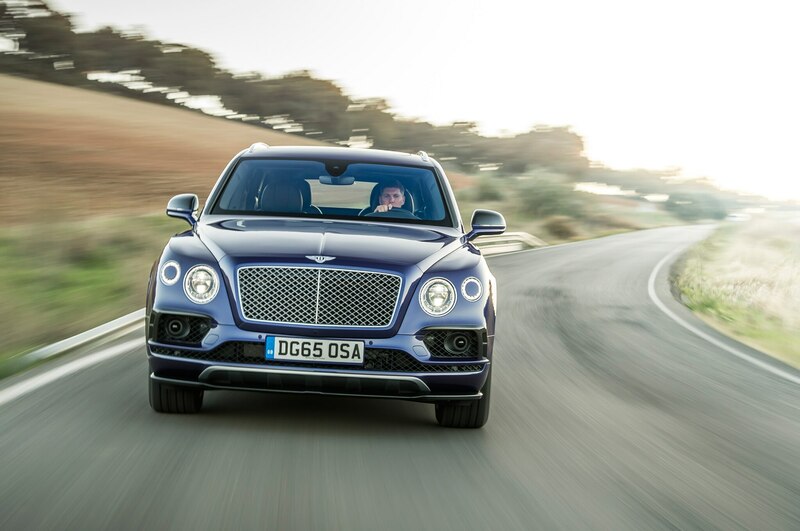 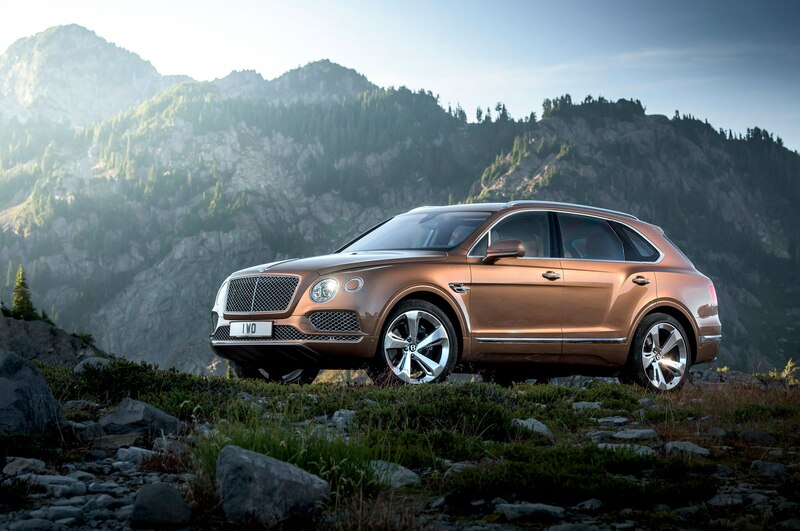 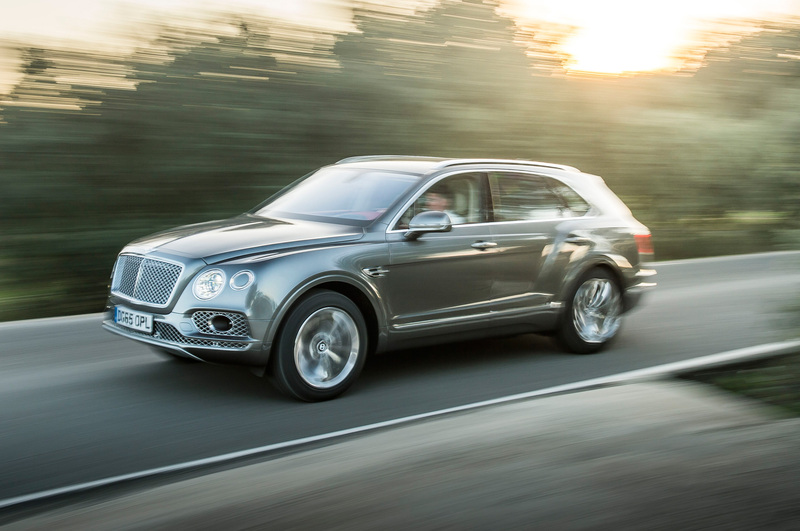 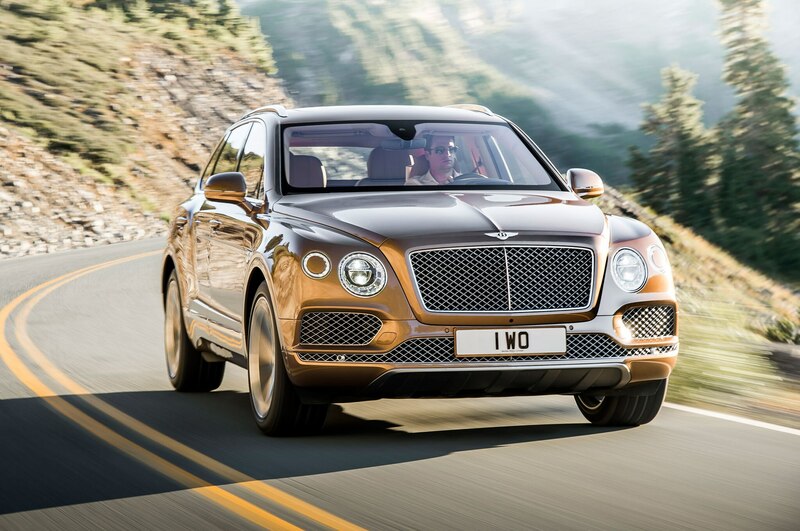 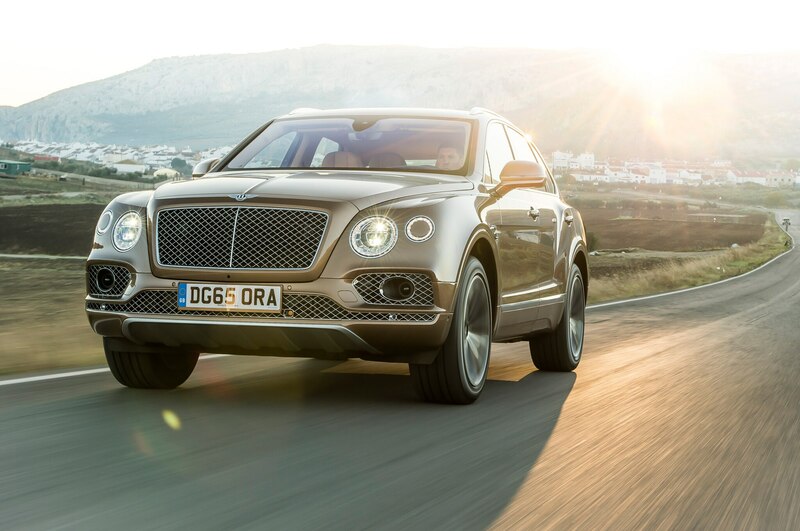 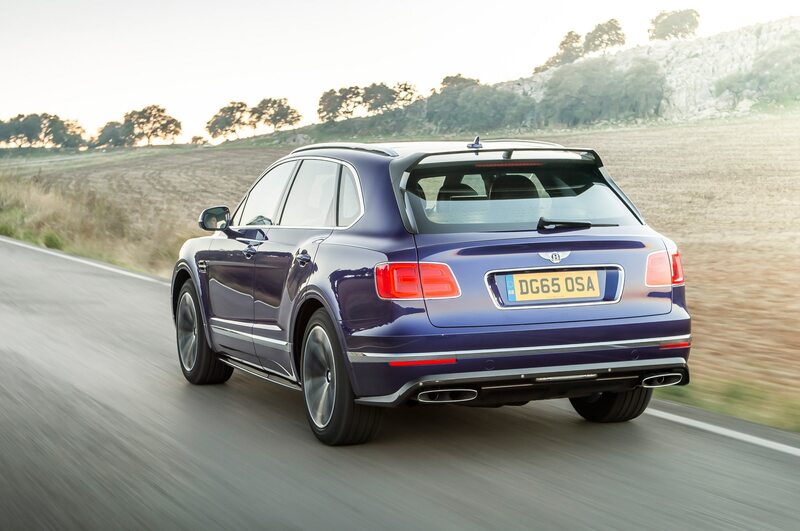 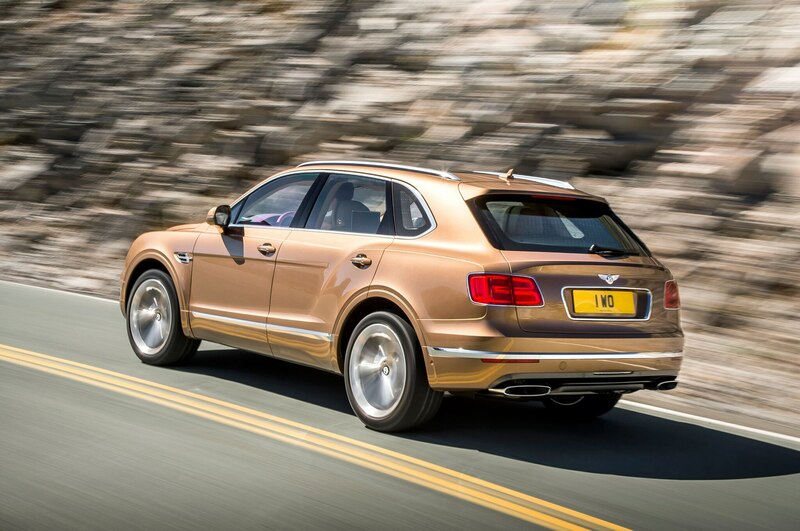 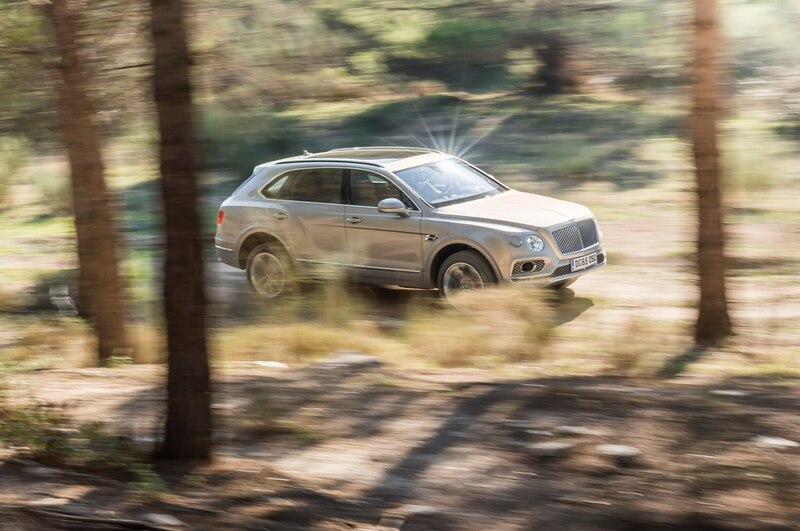 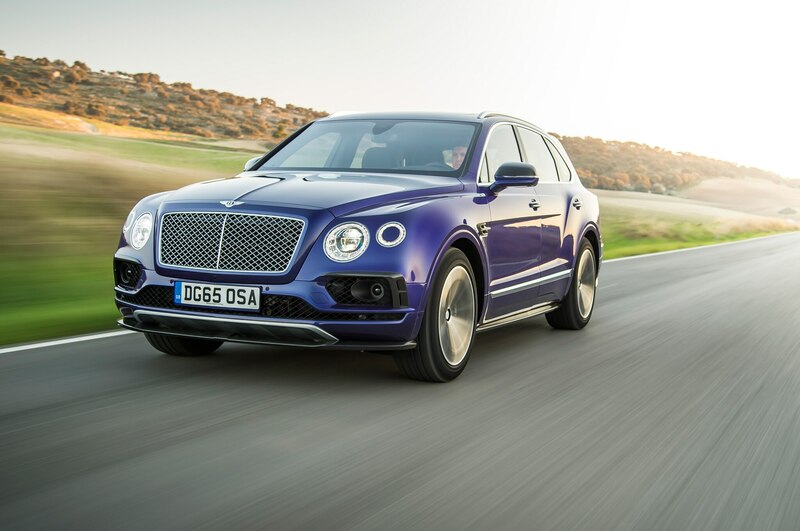 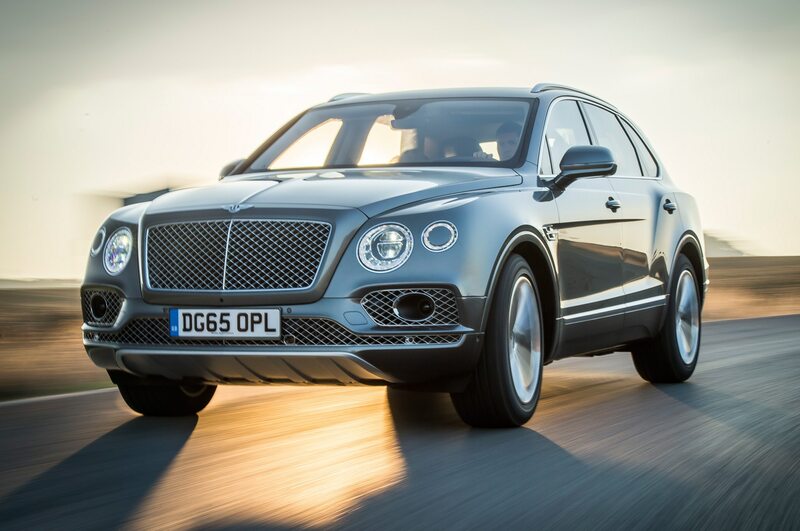 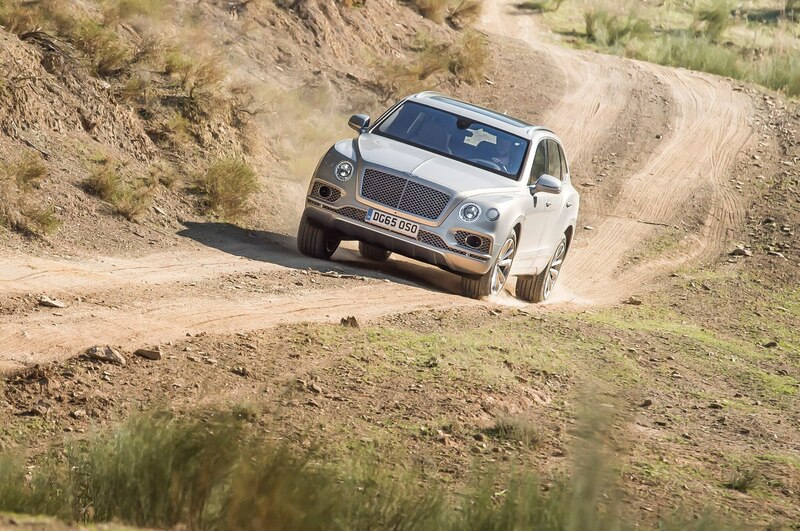 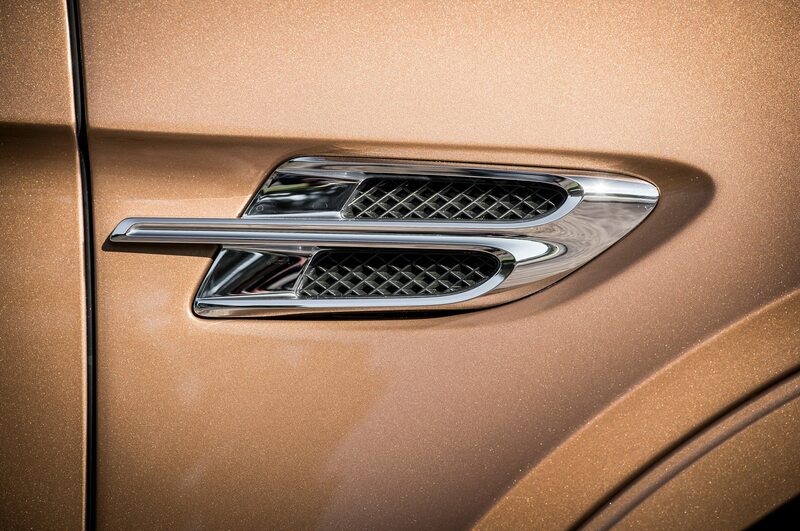 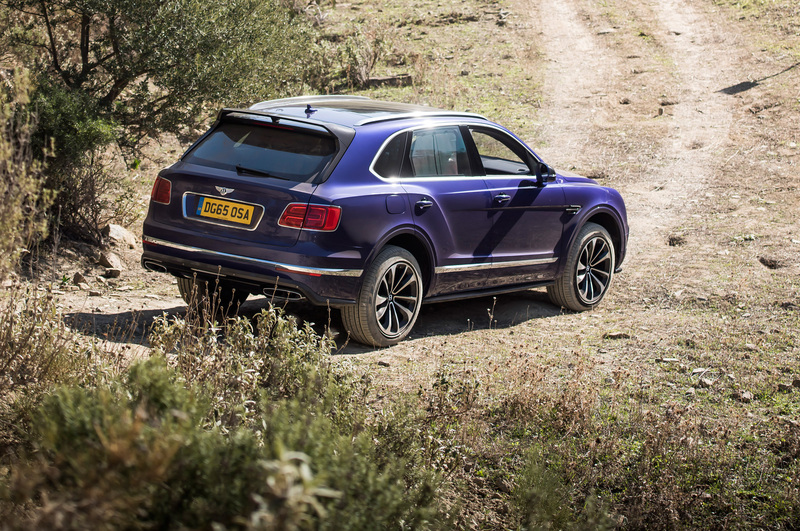 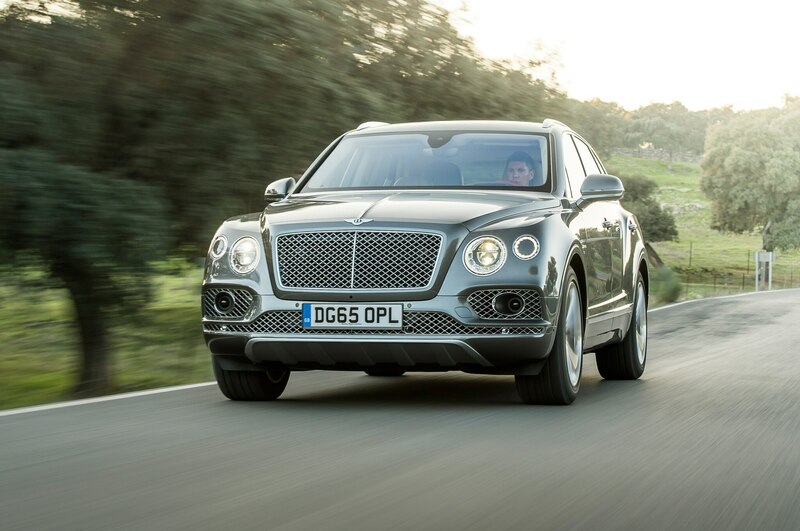 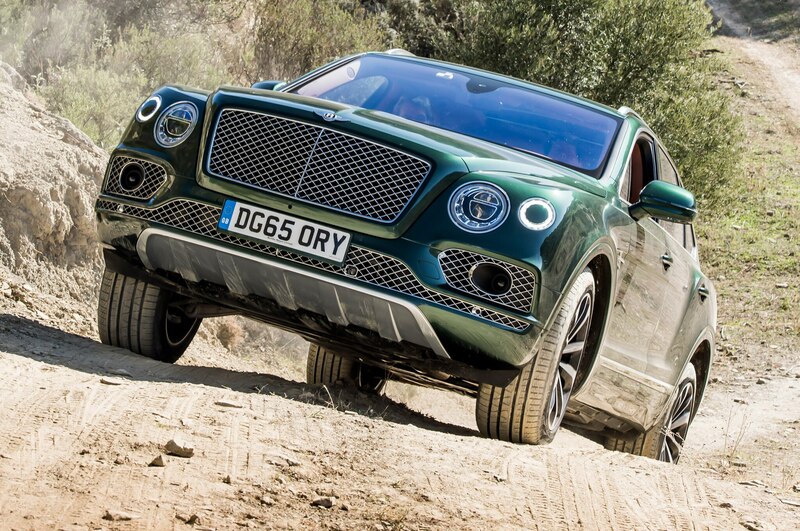 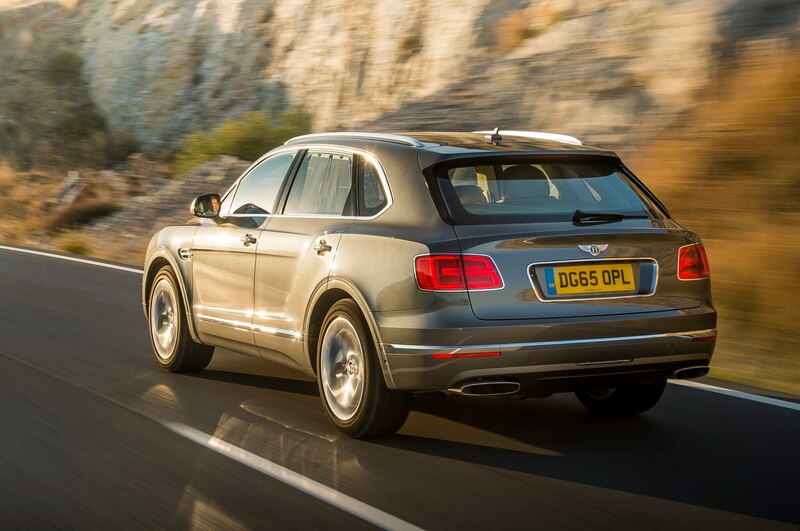 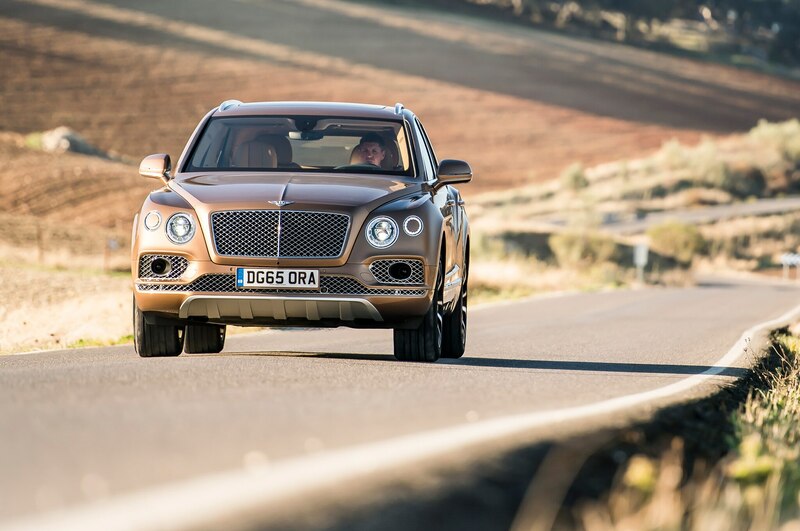 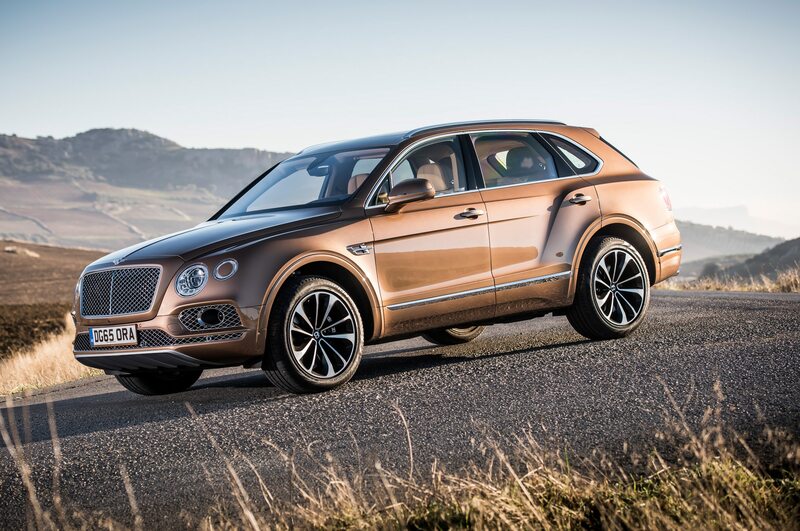 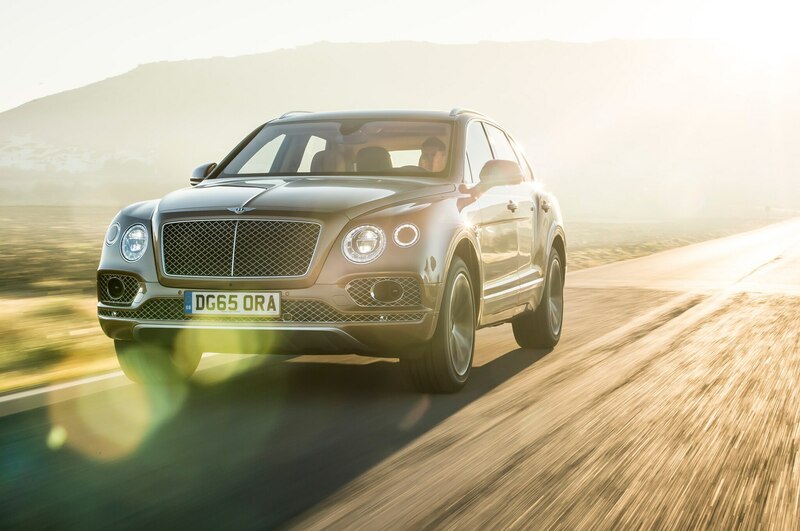 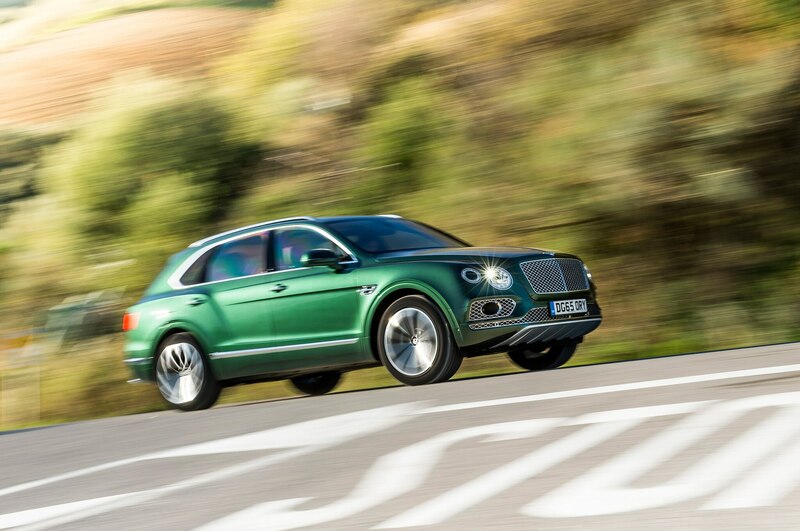 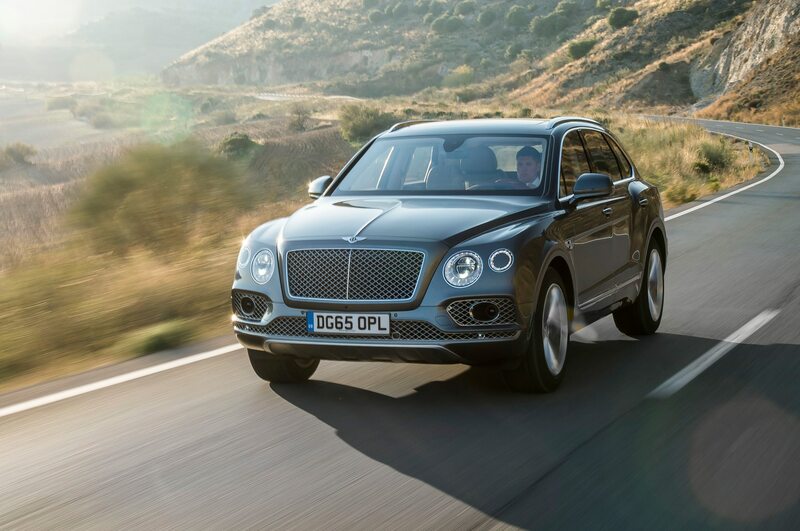 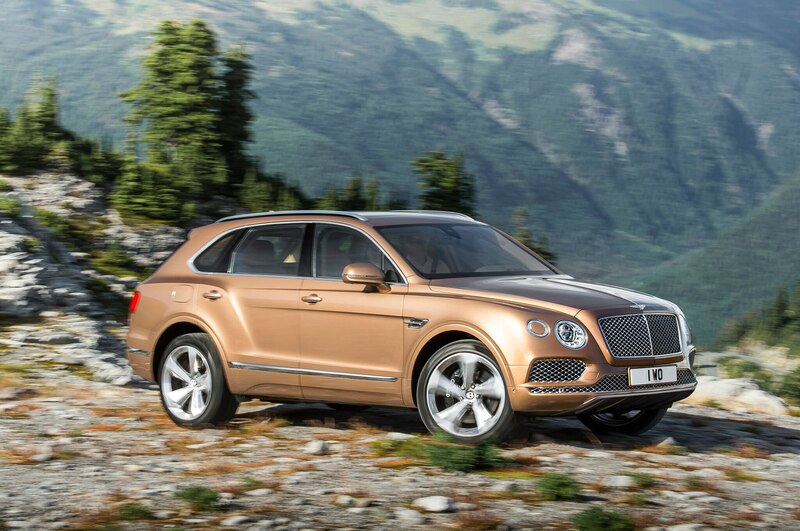 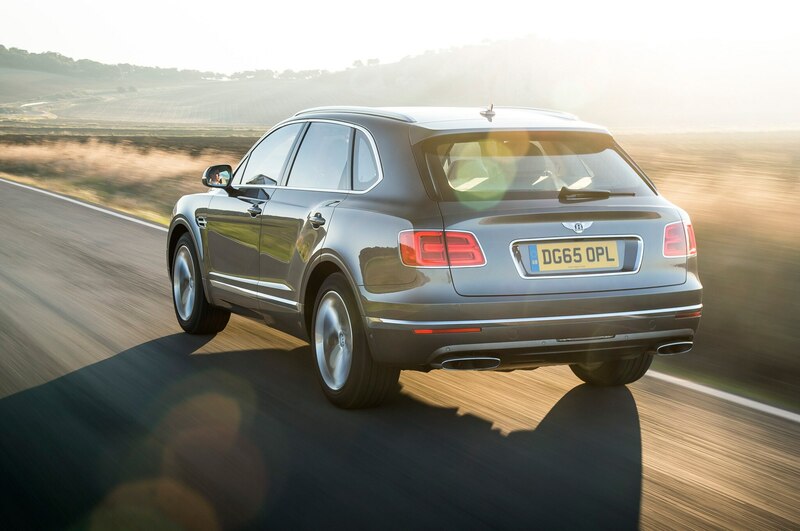 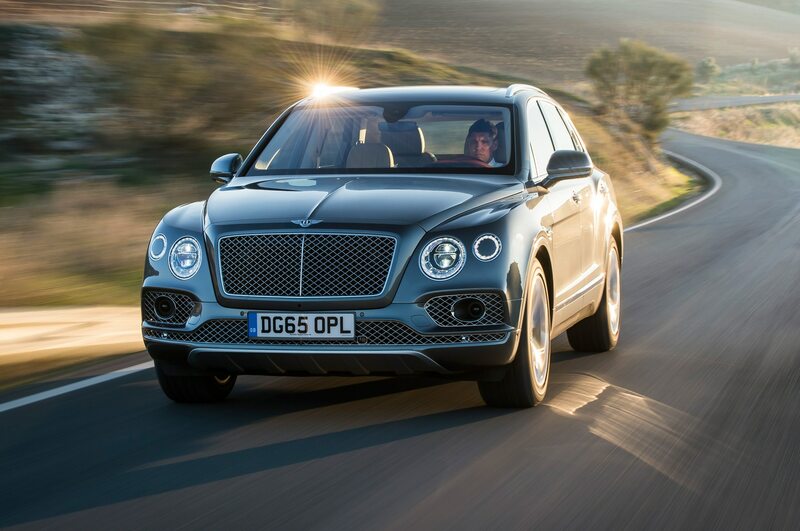 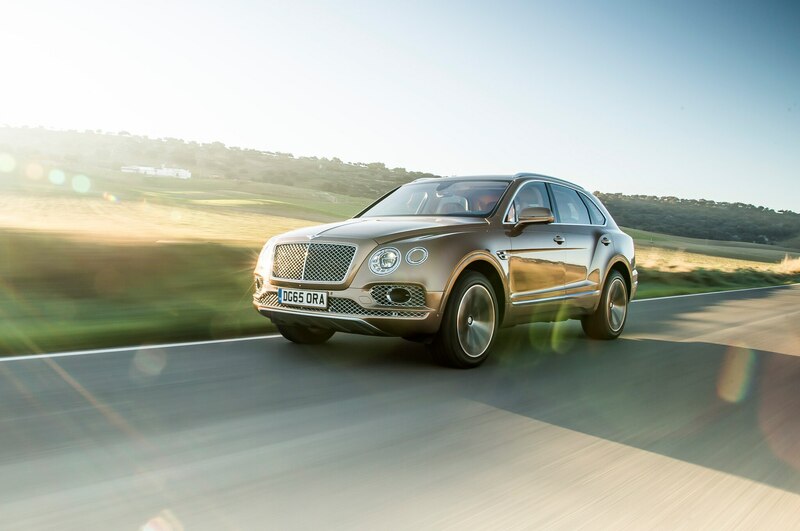 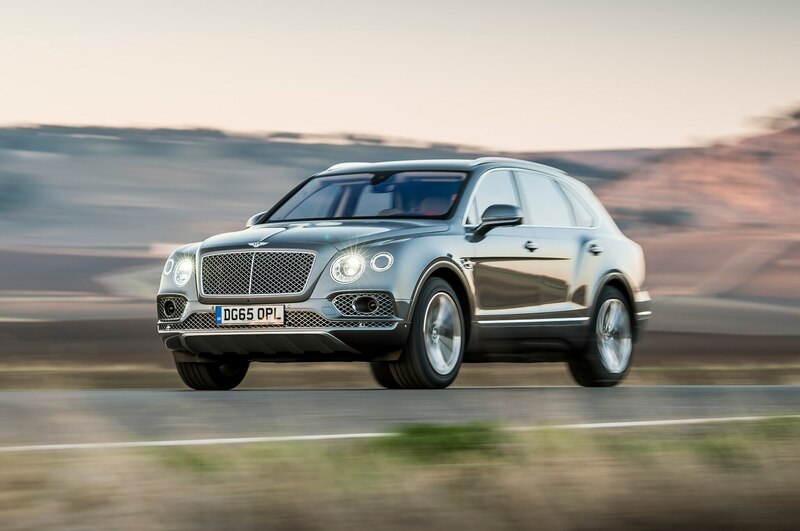 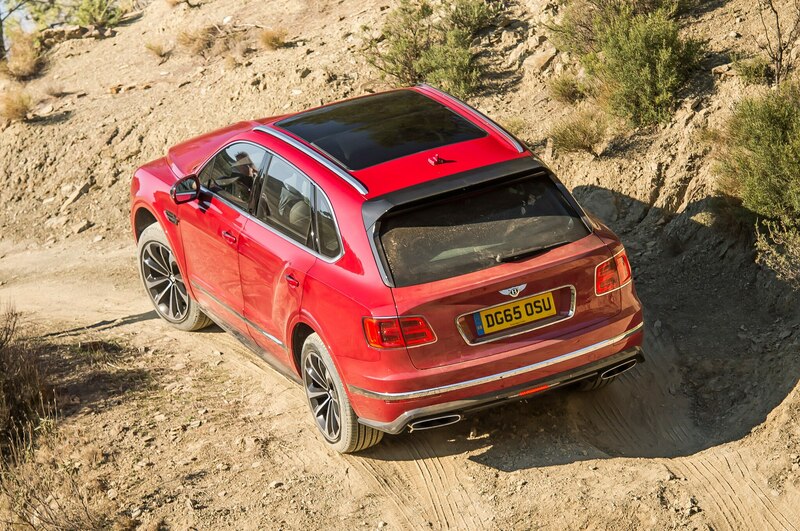 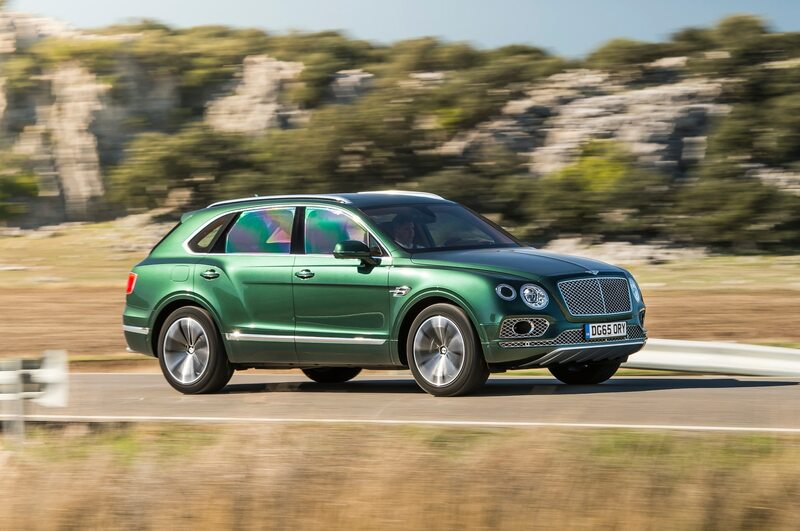 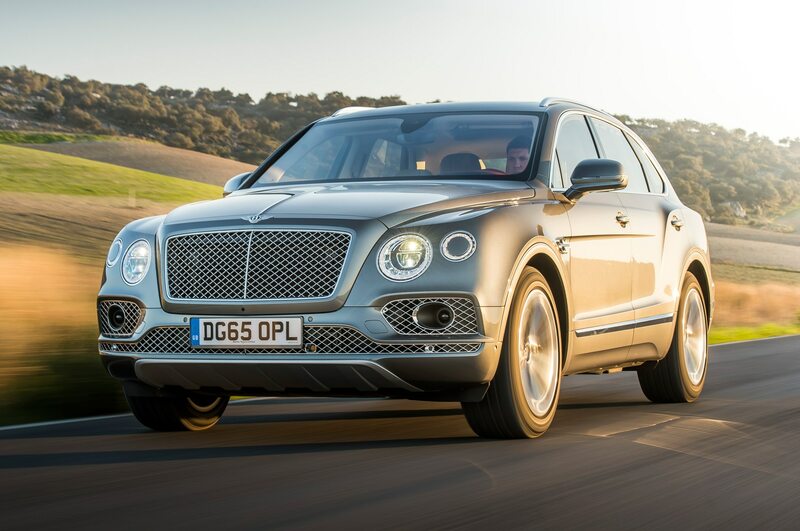 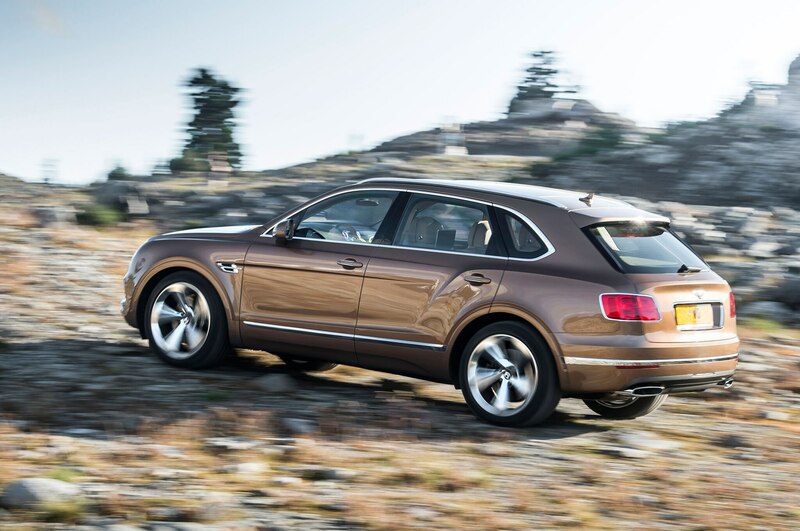 Bentley’s first SUV impresses us, mostly. 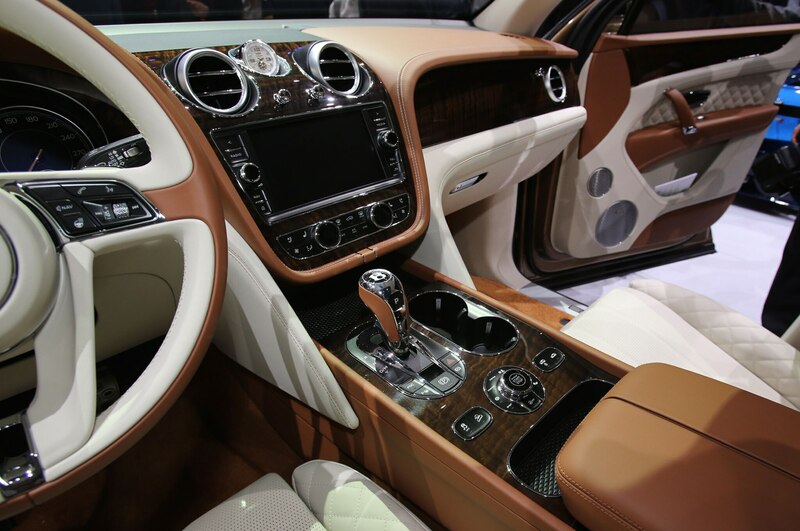 Yessir. 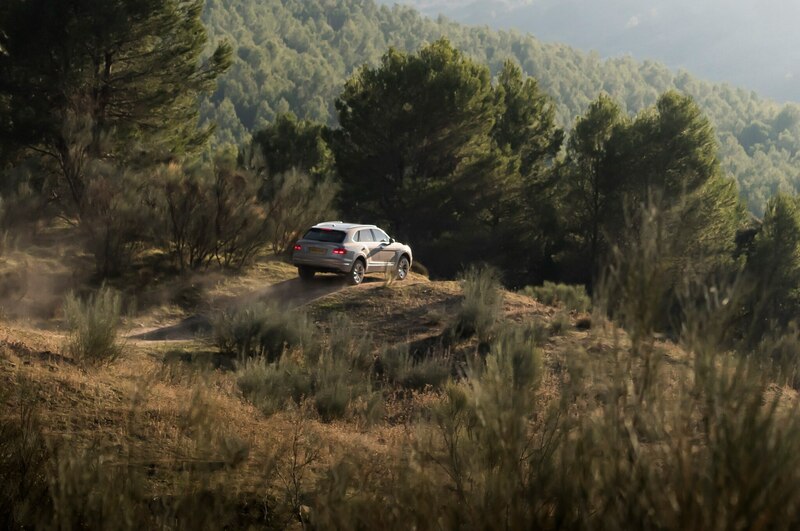 A few clicks down the road, the brakes begin to recover. 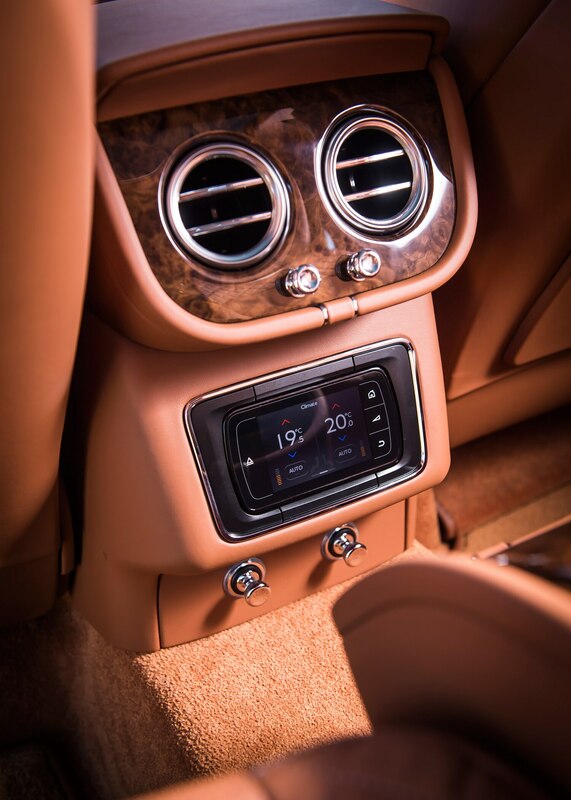 The pungent pad perfume evaporates as the crackling caused by slow dissipation of heat dies away, and resistance returns to the no-longer-spongy pedal. 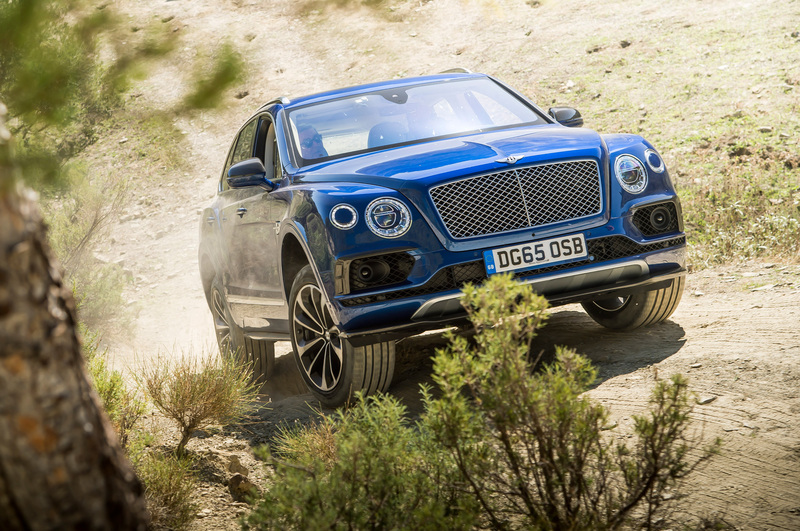 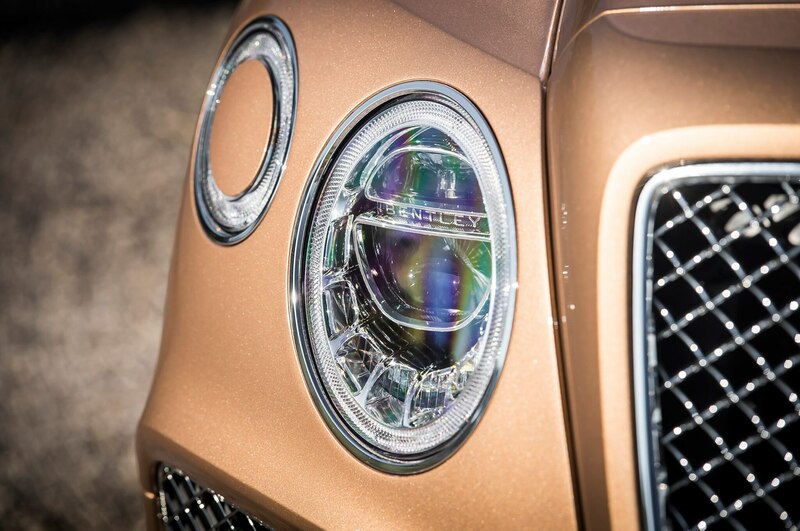 But there is no smoke without fire, and in this case the fire is lit at random by the 5,379-pound curb weight of Bentley’s first foray into off-road territory. 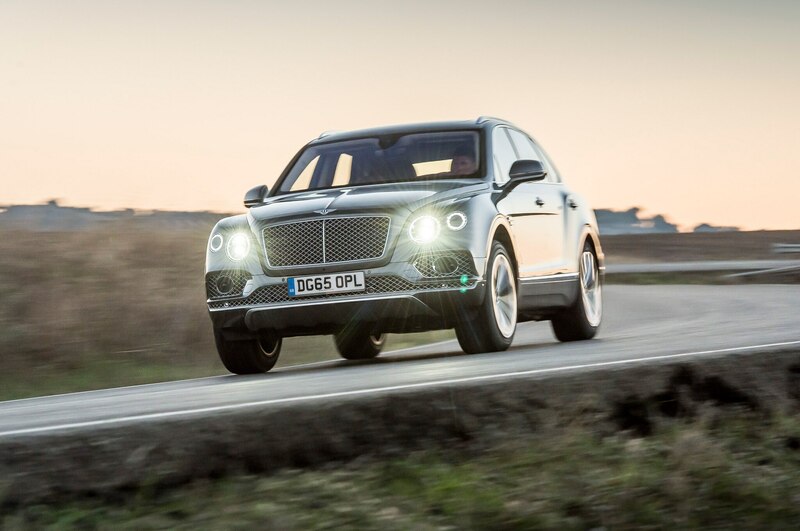 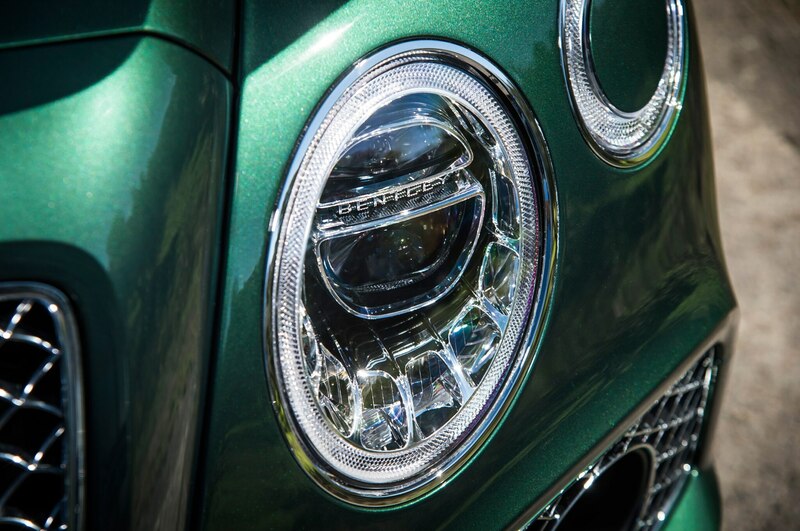 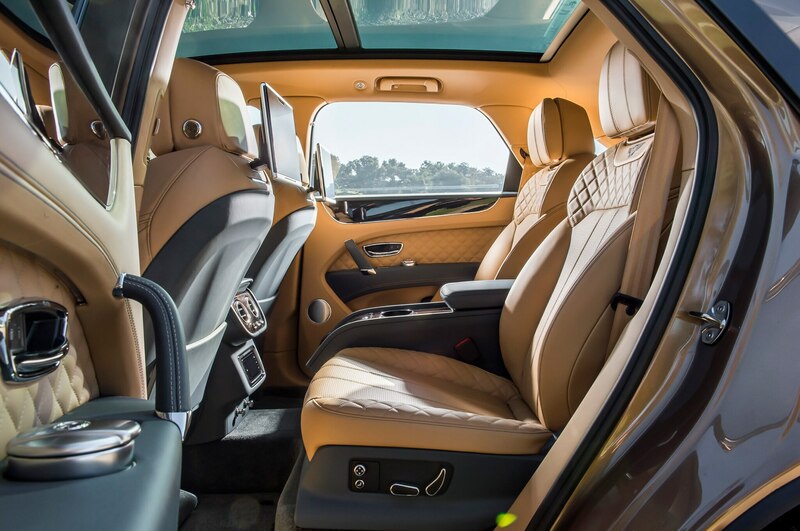 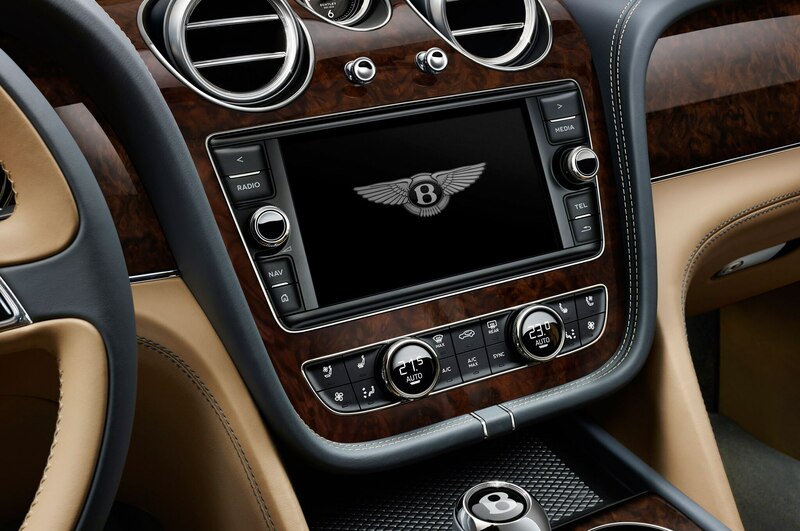 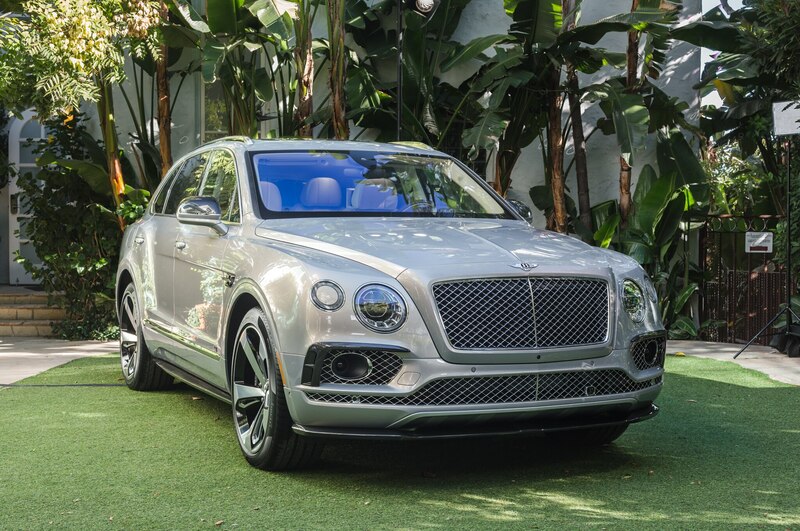 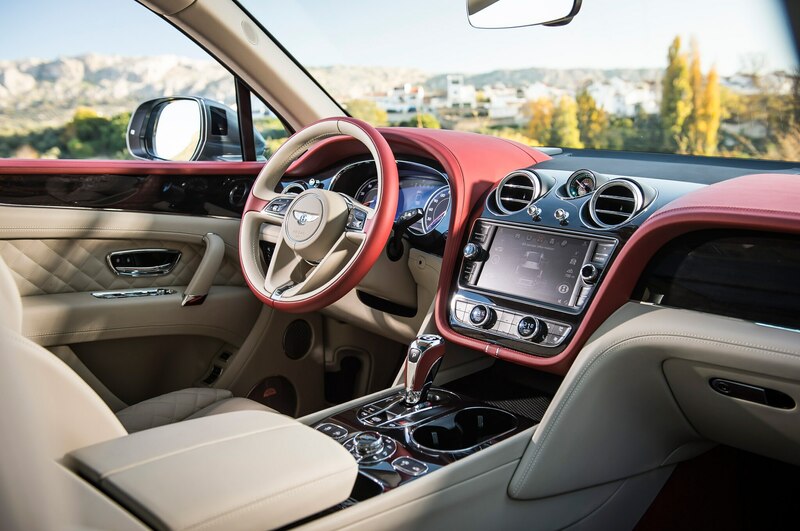 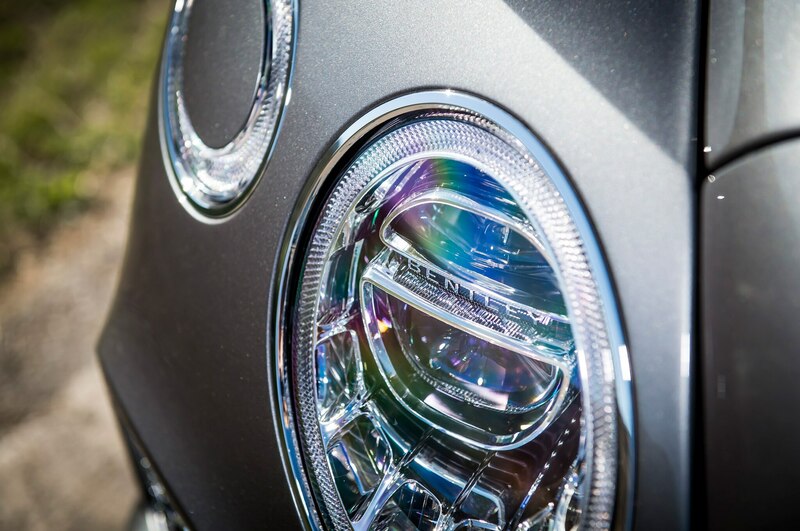 Measuring 202.4 inches long and 87.5 inches wide when measured to the edge of its exterior mirrors, the Bentley Bentayga harbors and consumes plenty of acceleration and deceleration energy. 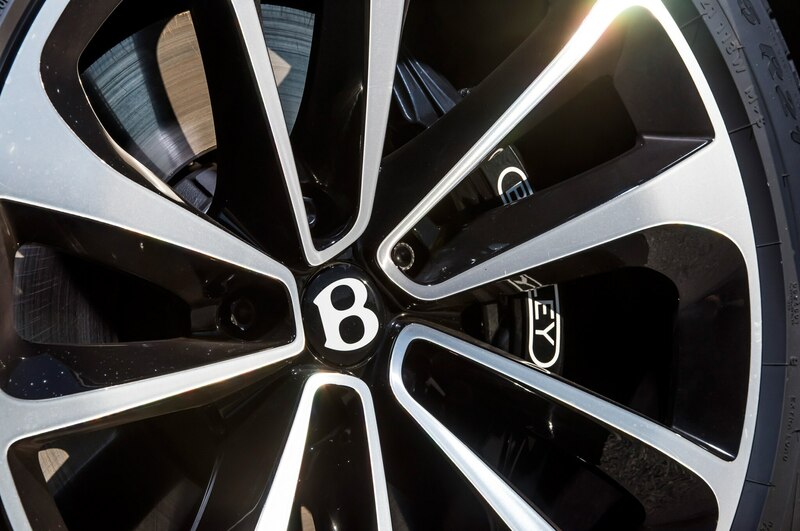 While the latest version — every part is new, Bentley says — of the mighty 6.0-liter, twin-turbo W-12 delivers thrust, four manhole-cover-size steel discs must conjure adequate stopping power. 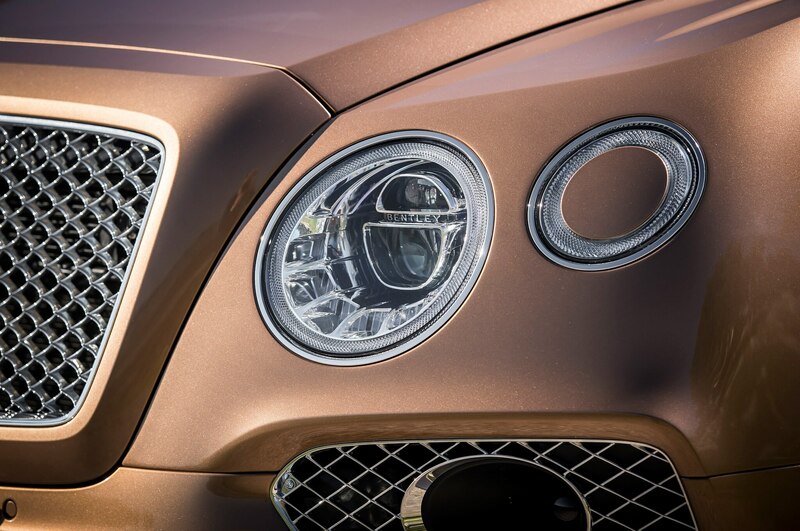 Why steel? 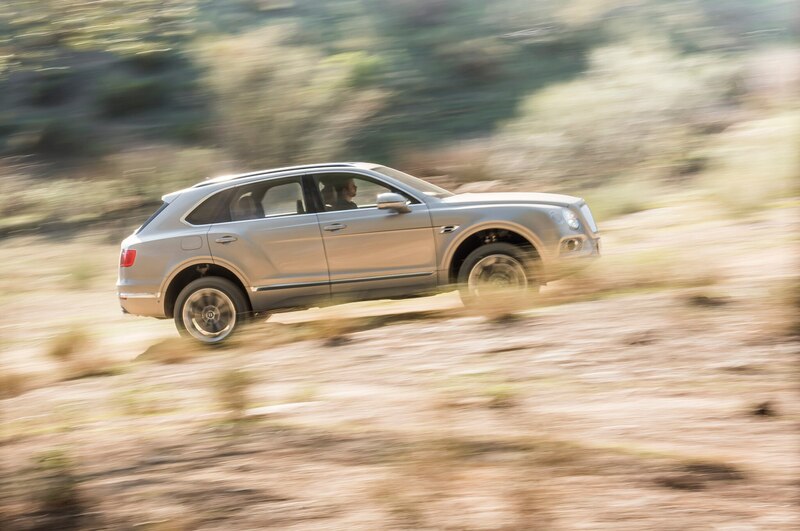 Indeed, earlier in the day, we pushed the brakes to the brink of self-destruction on more than one occasion. 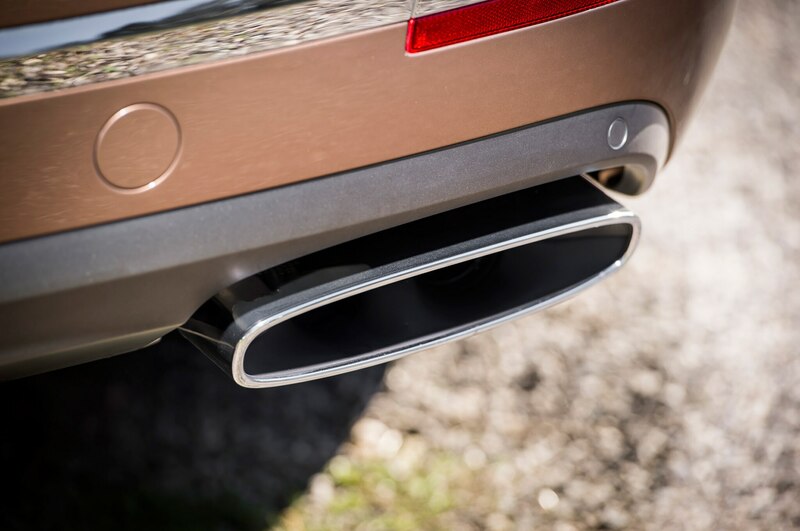 Perhaps Dürheimer should have taken the smoke signals as a compliment: After all, steaming anchors are almost always unmistakable proof the driver was having fun — in this case, a lot of fun. 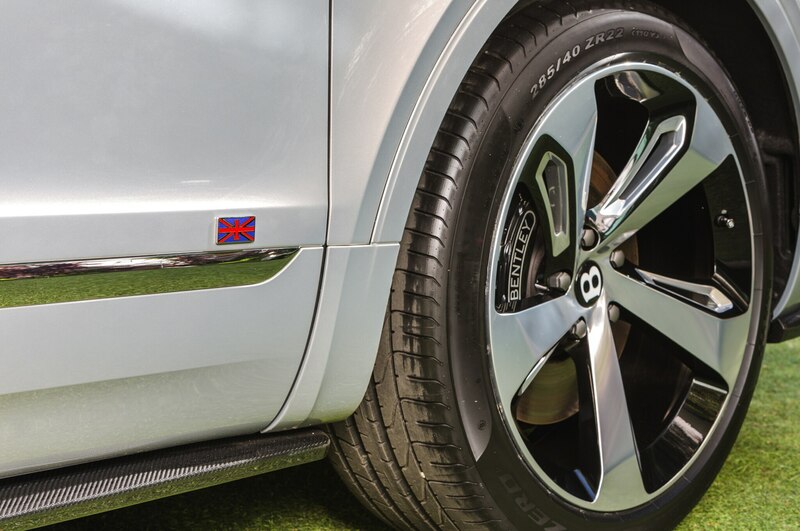 Corner by corner, however, the pedal travels closer and closer to the firewall, and the initially sharp braking-bite begins to give way to a determined but less fierce hold. 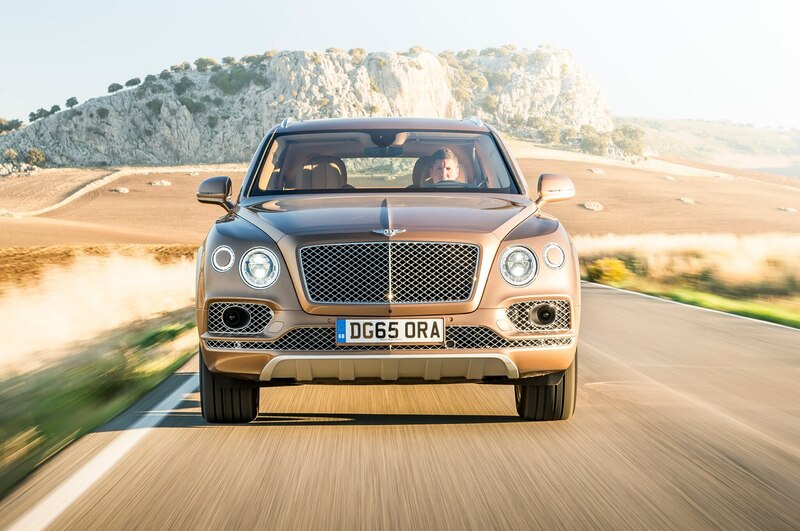 And though we stuck to the ambitious fast-forward rhythm and pace, the speed barge never shot past an apex or ran out of road. 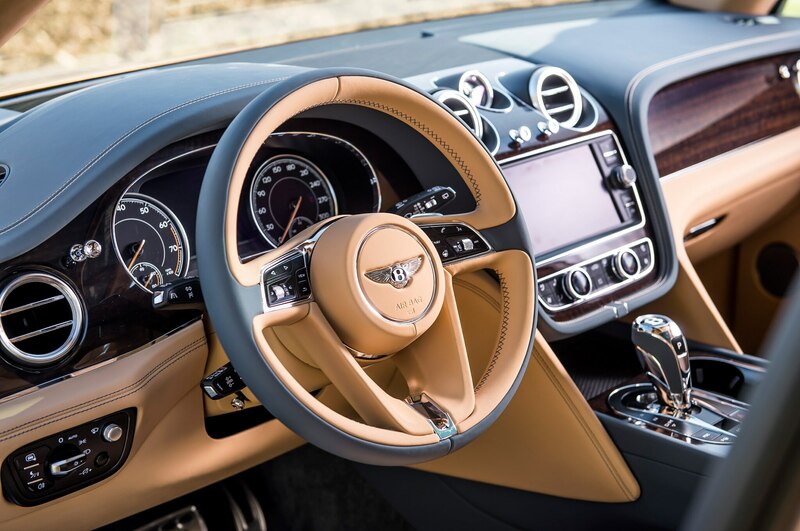 This surprisingly benign attitude at the limit is to a large extent masterminded by an active body-control system dubbed BDR for Bentley Dynamic Ride. 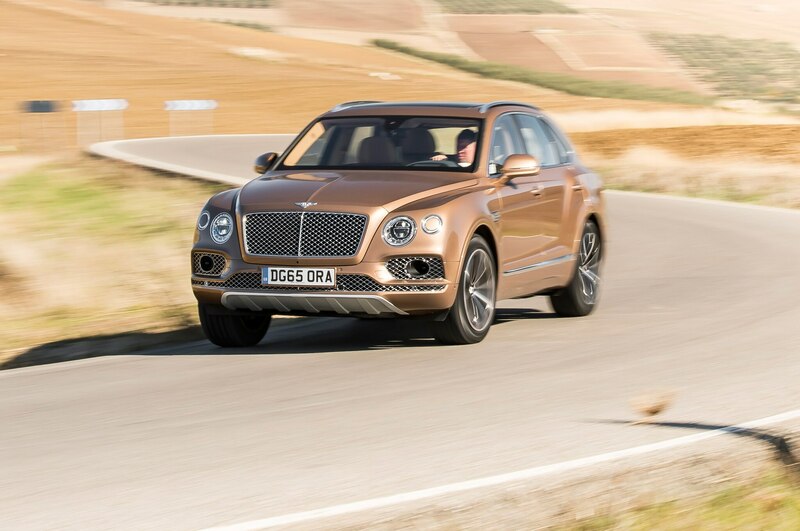 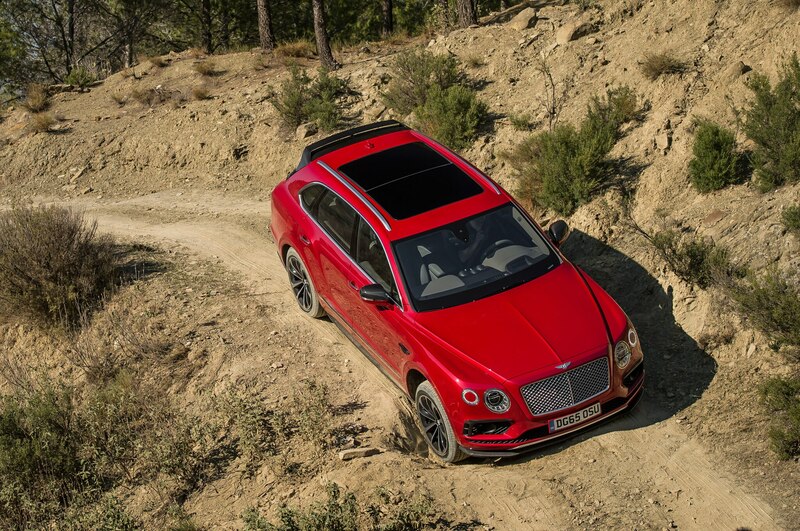 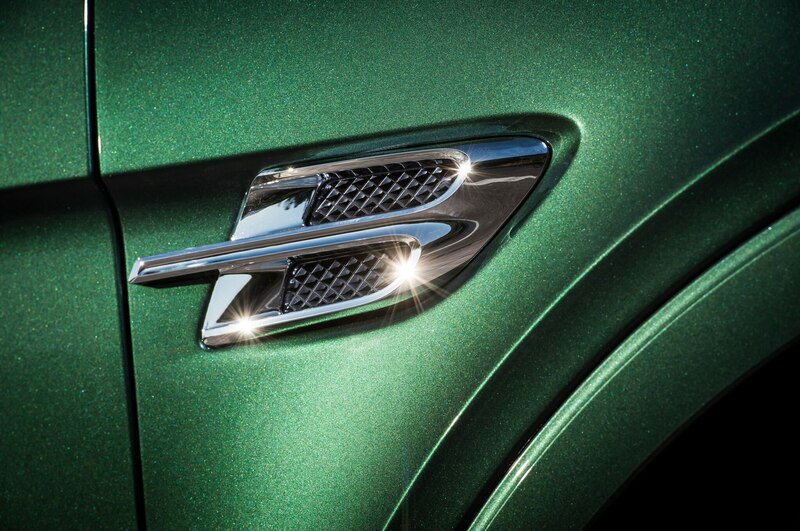 Like Porsche’s Cayenne Turbo S and BMW’s X6 M, the high-roof Bentley prioritizes g-force, grip, and torque. 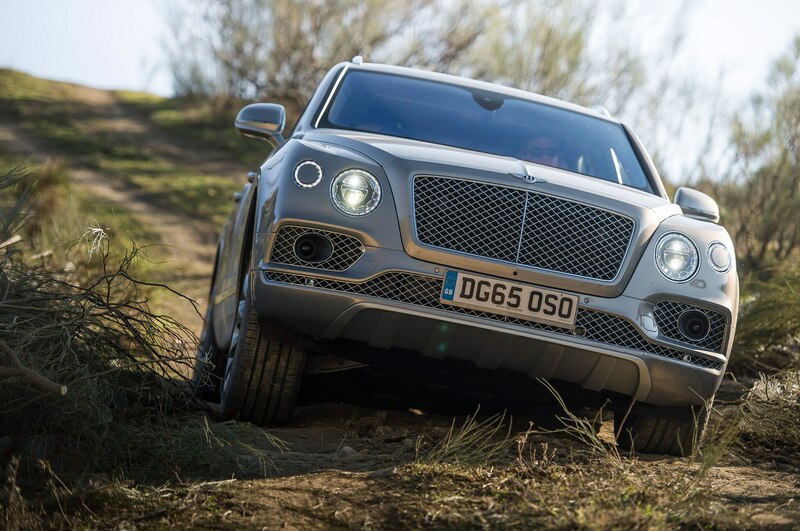 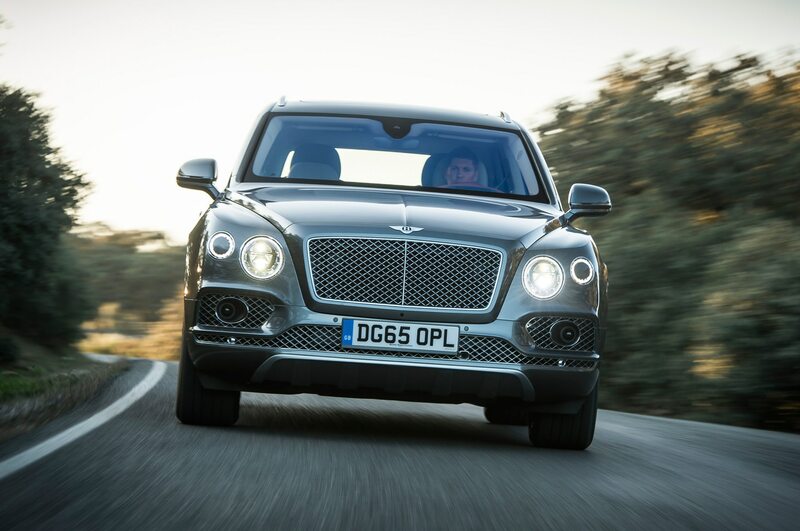 Despite its stance, its imposing proportions, and the grandma-would-love-it details, the Bentayga is a fast, involving, and proper driver’s car. 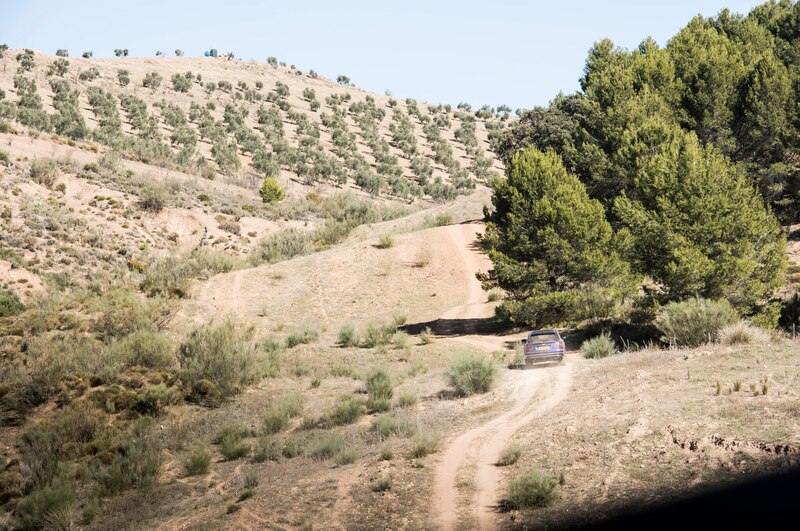 Thanks to BDR, turn-in is sharp and devoid of irritations such as excessive body roll, early understeer, and a momentarily wayward rear end. 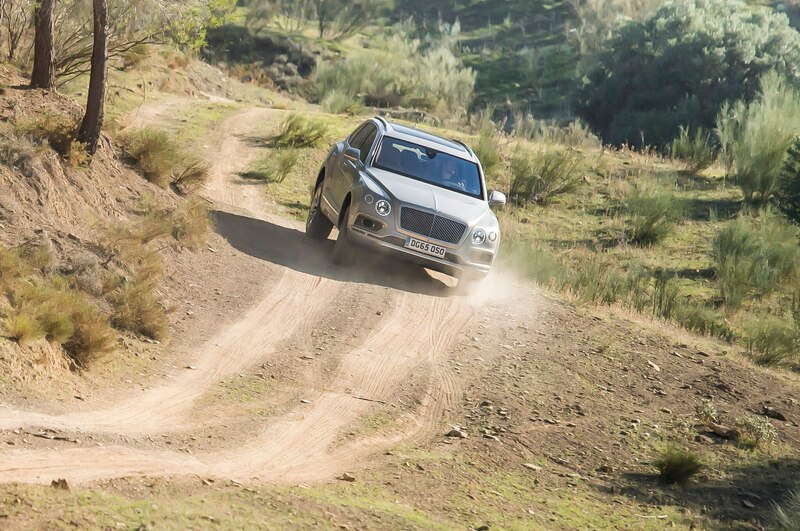 Even when cornering along the limit of adhesion, the heavyweight SUV remains flat and composed, stable and attentive. 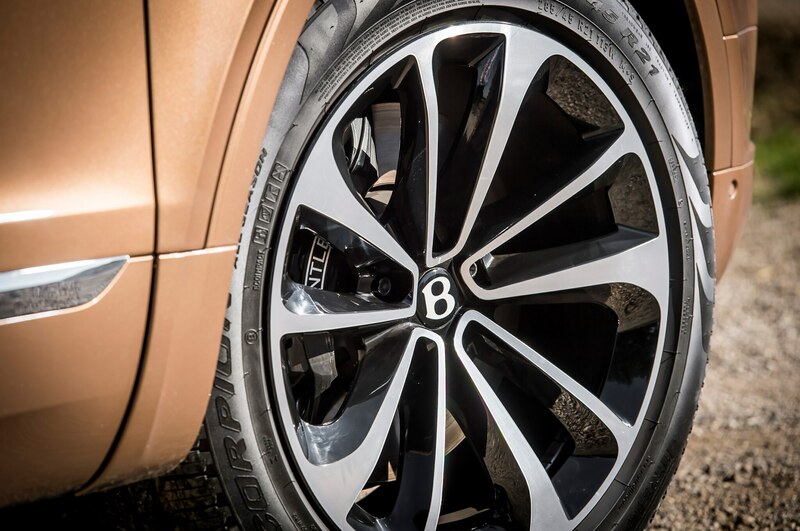 Suffering from the devil at the wheel are not only the brakes but also the tires: Pirelli’s finest foursome returned to the garage at night with scrubbed tread and ragged shoulders. 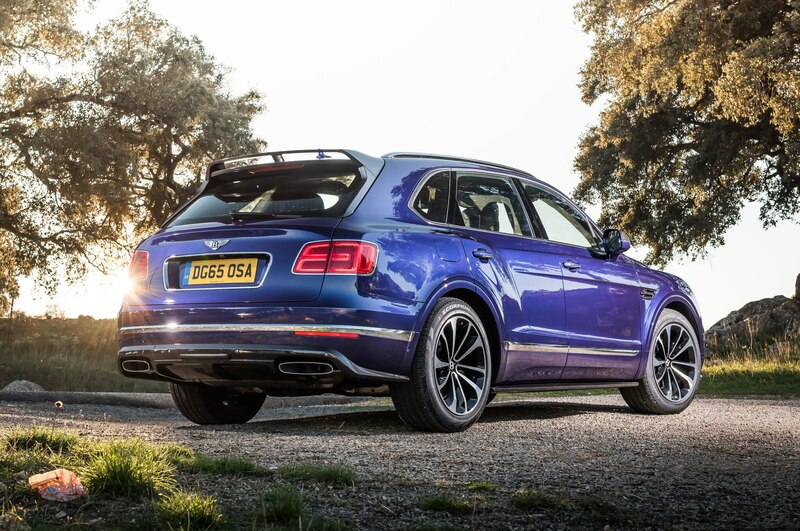 Speaking of rubber, the 285/45R-20 Pirellis felt about right for the mixed bag of Spanish country roads and motorways. 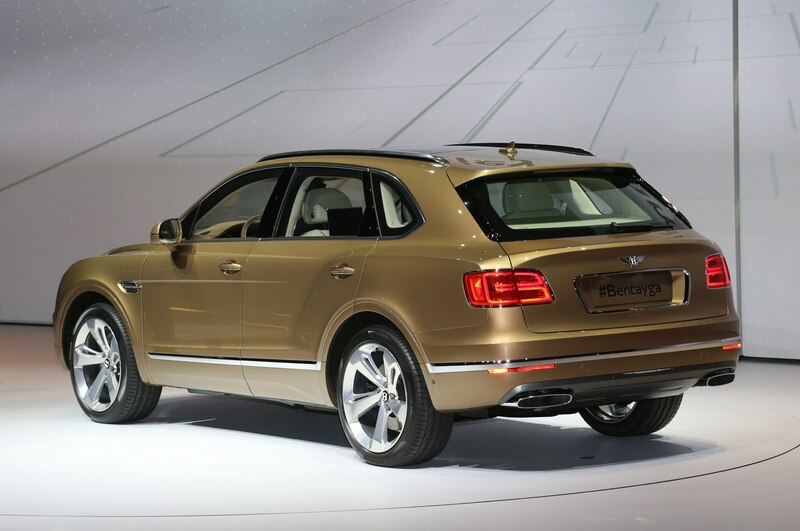 According to a Bentley mechanic, the standard 20-inchers look too petite while the butch 22-inchers are too vulnerable. 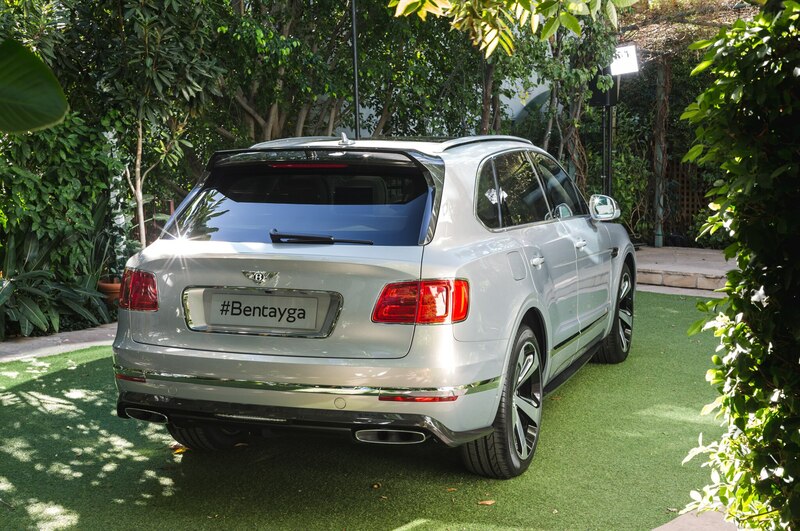 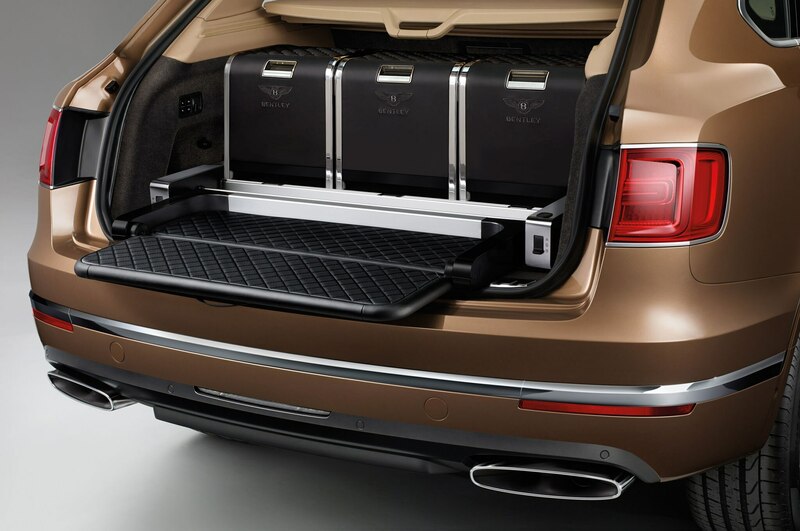 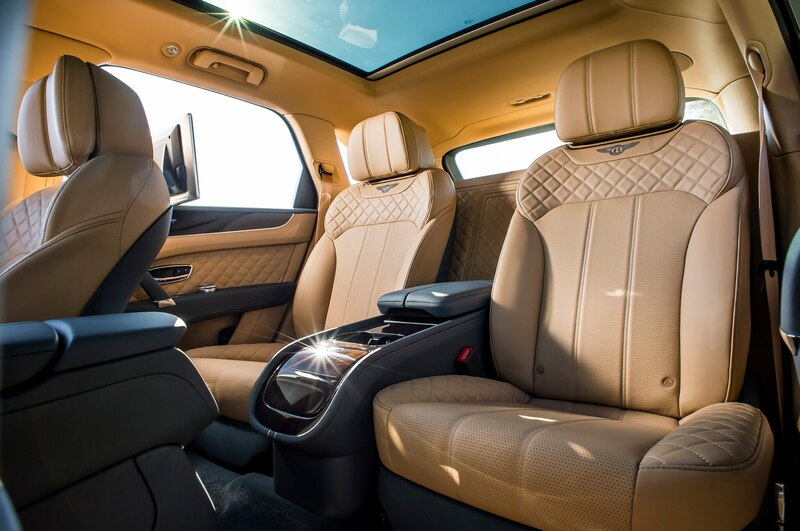 Although the Bentayga beats any direct rival in terms of ride comfort, its chassis does not feel quite as compliant as the latest Audi Q7. 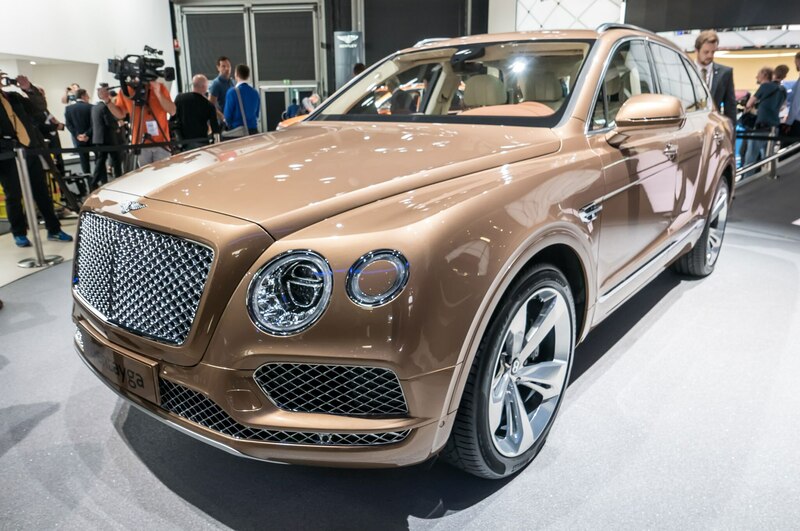 How come? 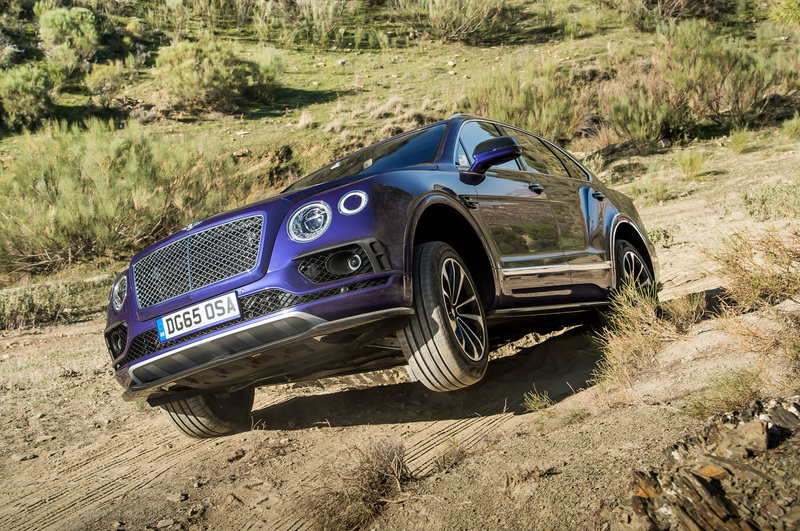 Well, to reach 187 mph without disintegrating requires, among other things, tires with extra-stiff sidewalls and a taut suspension tuned for unerring stability. 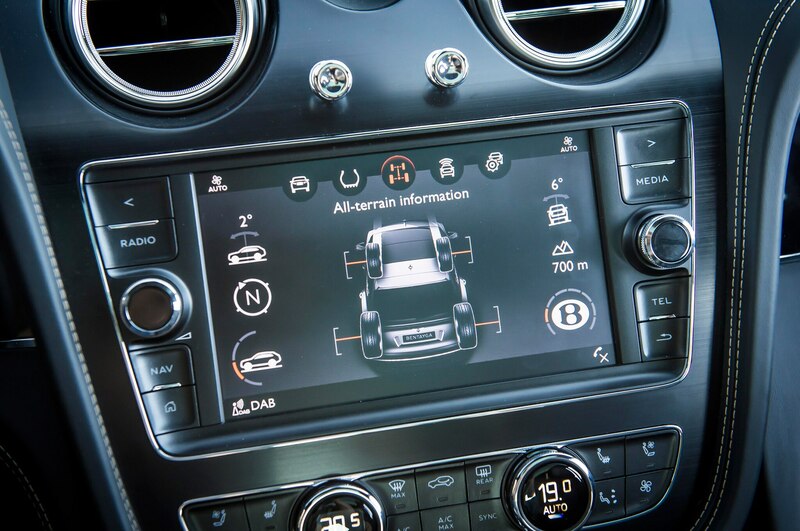 Most owners could probably live without the swarm of pricey assistance systems, but the aforementioned BDR (standard only in North America) is absolutely essential. 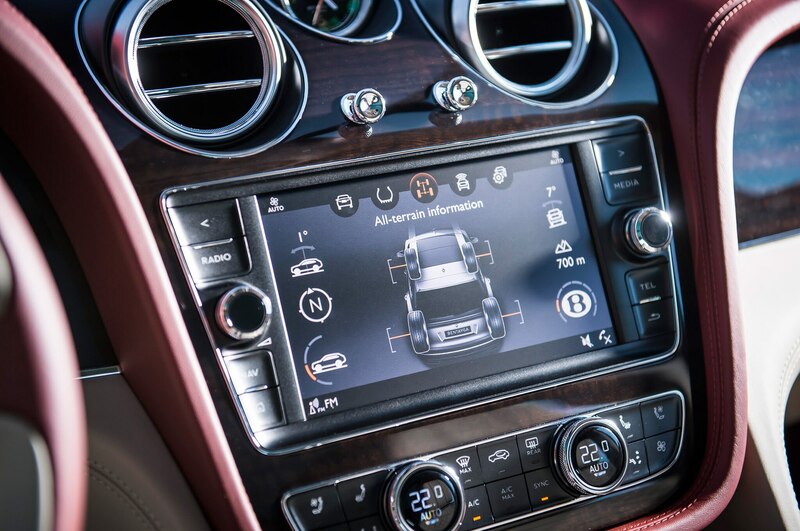 We know this because a software glitch deactivated the system intermittently, converting the agile and sure-footed crossover to an indifferent and ponderous colossus. 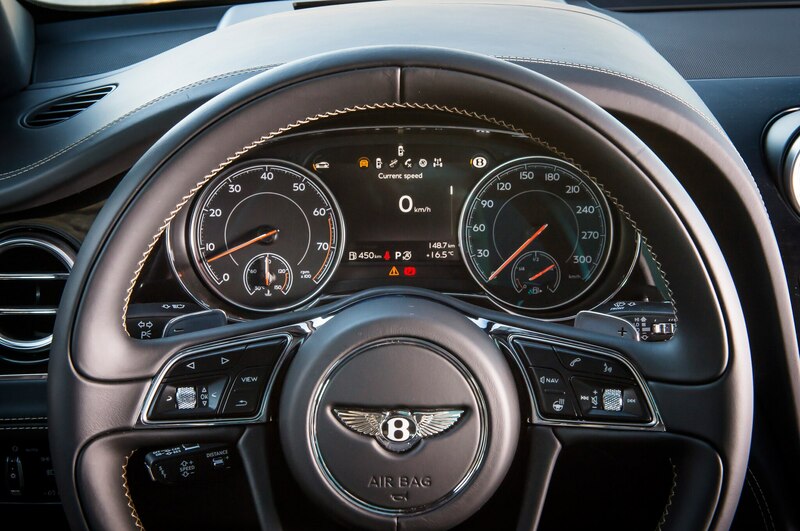 On the positive side, the competent variable-rate steering is linear, precise, and responsive. 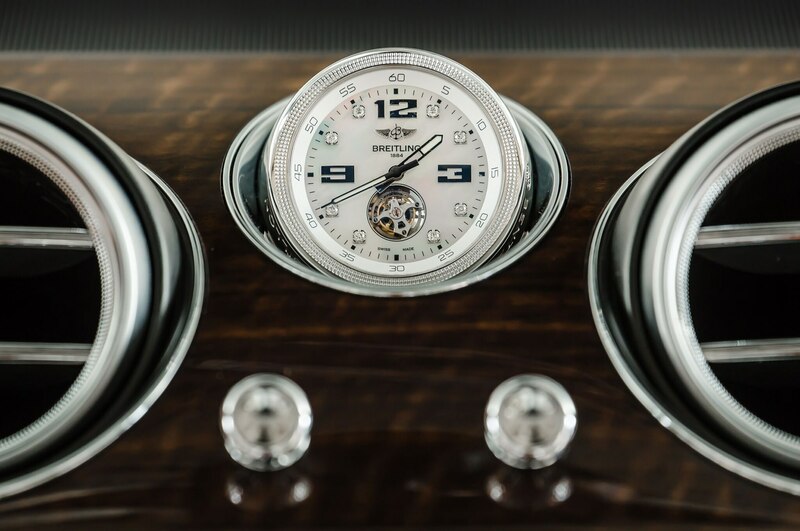 The progressive and well-balanced tuning is an important confidence-inspiring tool. 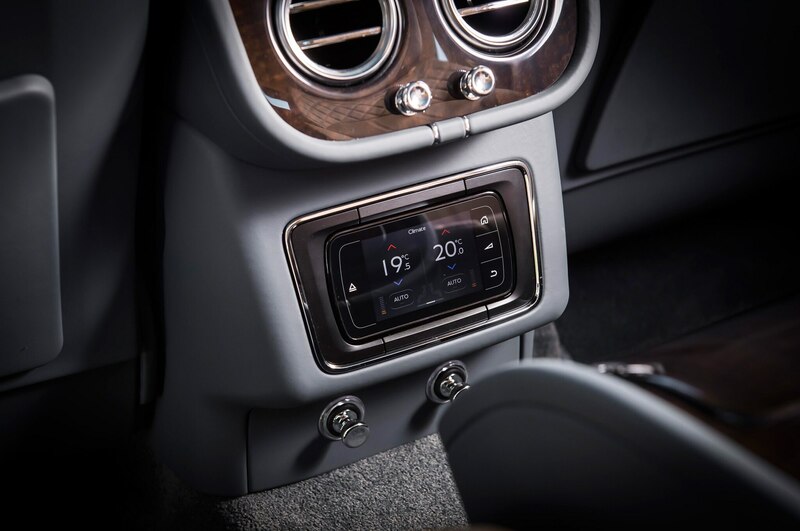 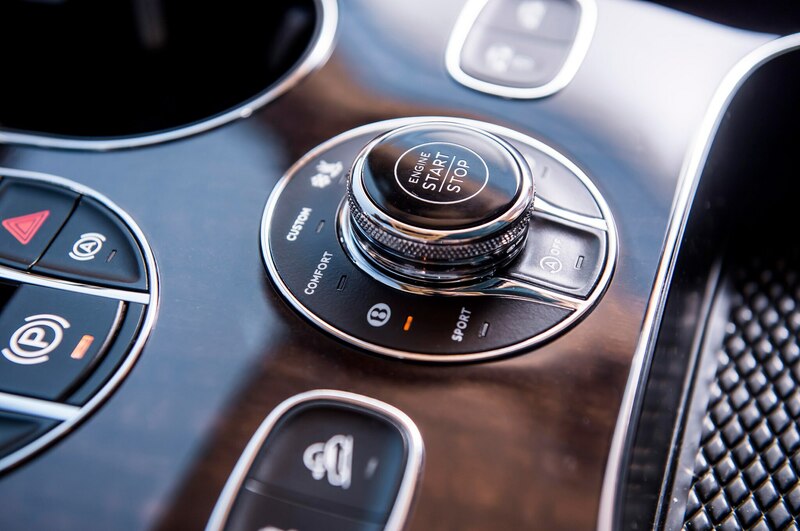 Select Custom mode via the Drive Dynamics Control (DDC) knob on the transmission tunnel, and you may adjust the calibration of steering, chassis, and driveline to your liking. 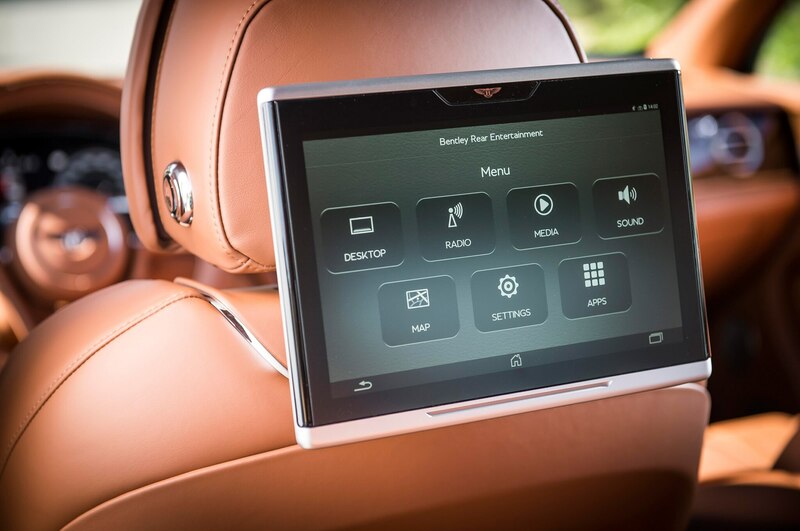 After two days and plenty of experimental fiddling, Sport emerged as the most involving setup and the best comfort-and-handling compromise. 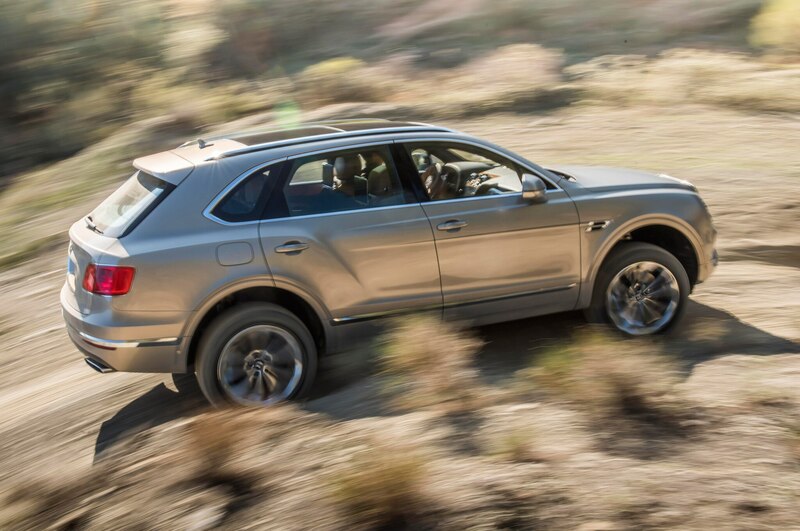 True, most high-performance SUVs are equally gifted corner kings and fast-lane heroes, but all of them deposit their ride comfort in pit lane before they go to 10/10ths. 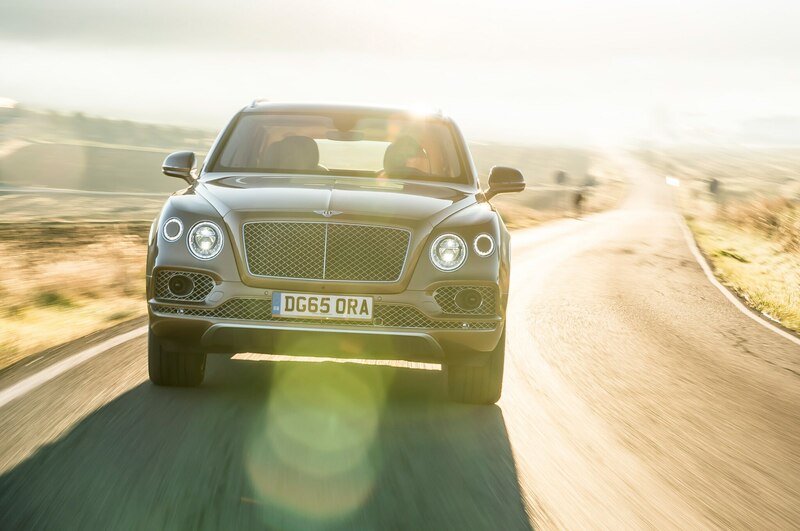 Not so the Bentayga, which offers a notably wider range of talents, especially when equipped with dynamically relevant options. 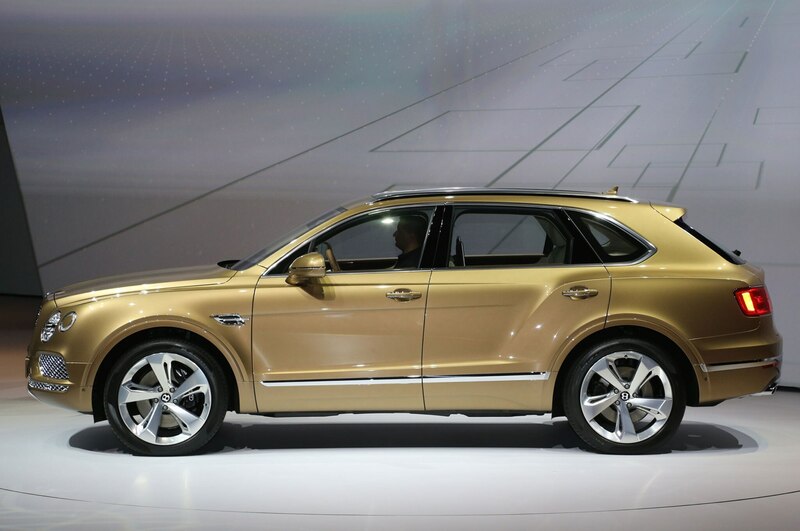 The base model rocks the bank account with a $229,100 starting price. 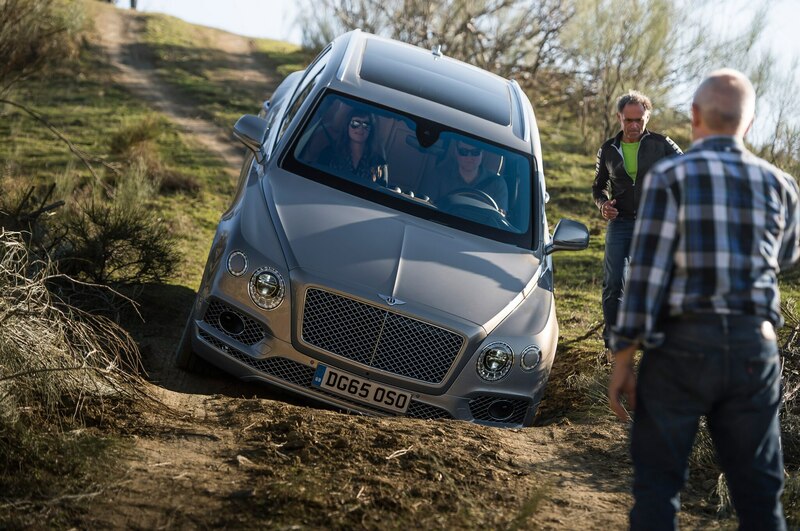 Only North American customers are exempt from paying extra for the All-Terrain kit. 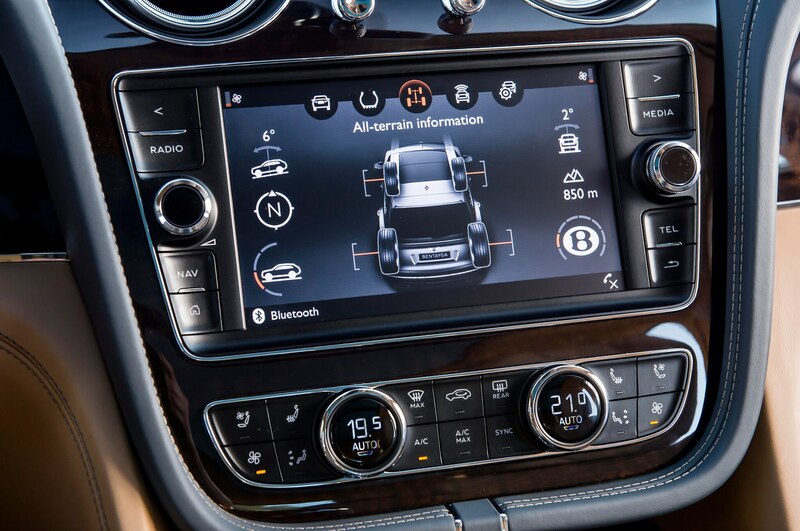 (For roughly the equivalent of $4,800 in Europe, it includes BDR, top-view cameras, and underbody protection.) 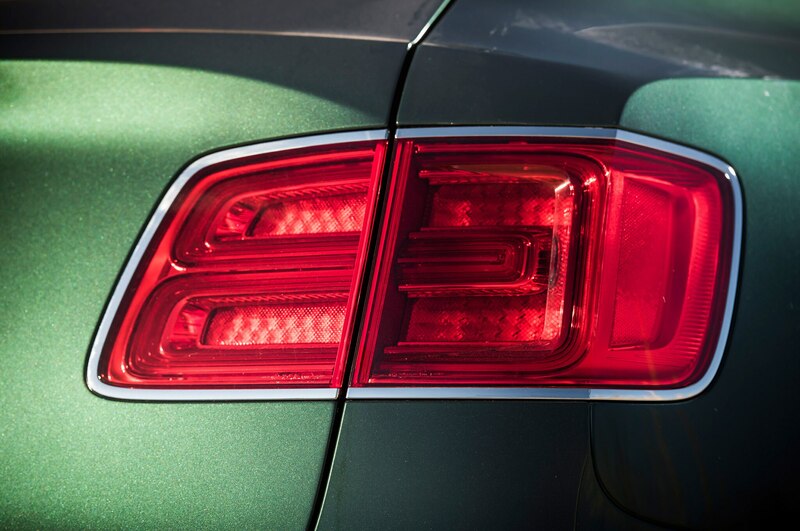 Neither do U.S. buyers need to pay extra for the City Specification option — roughly $3,925 in other markets — featuring park assist, pedestrian warning, reverse traffic warning, and traffic sign recognition. 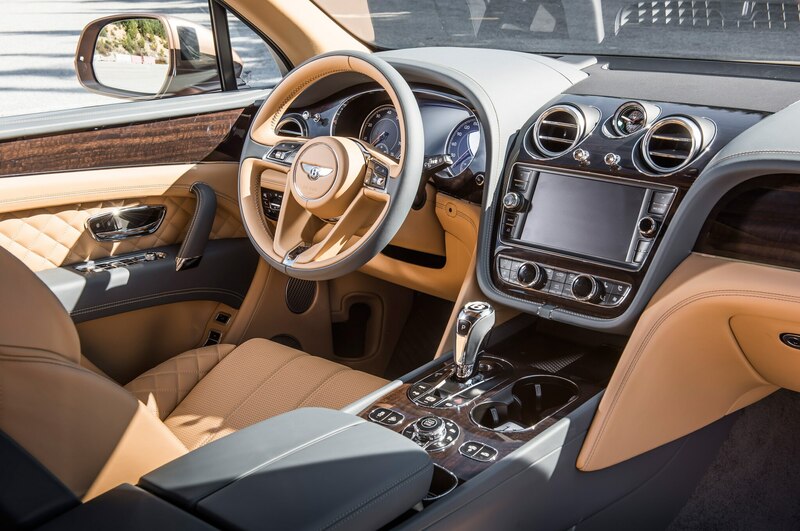 For an additional $7,870, the crew from Crewe will happily install the desirable Touring pack complete with adaptive cruise control, head-up display, night vision, and lane assist. 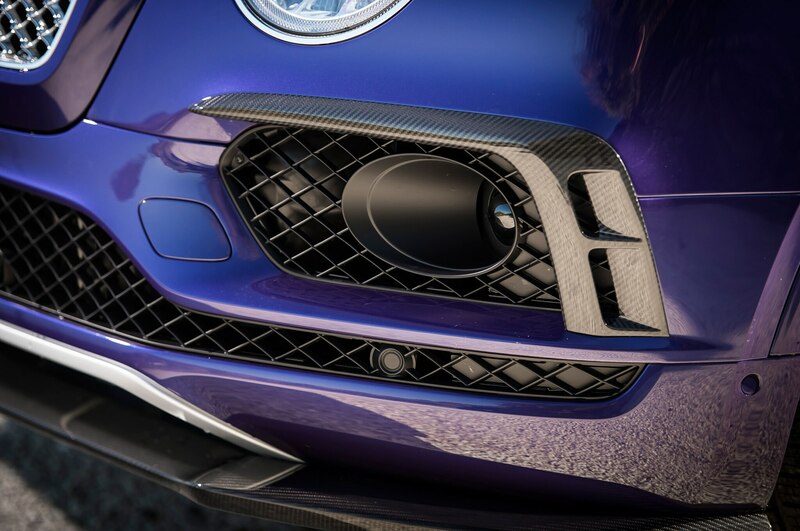 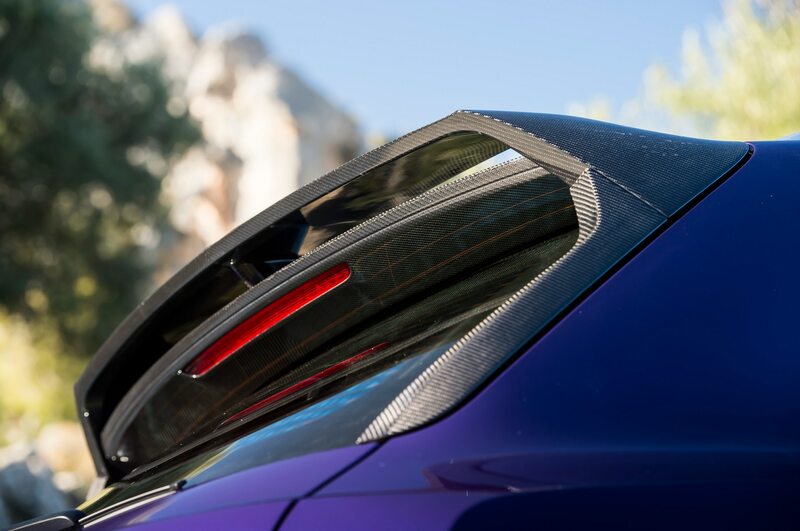 As demonstrated by our test car, racking up $50,000 worth of add-ons is child’s play. 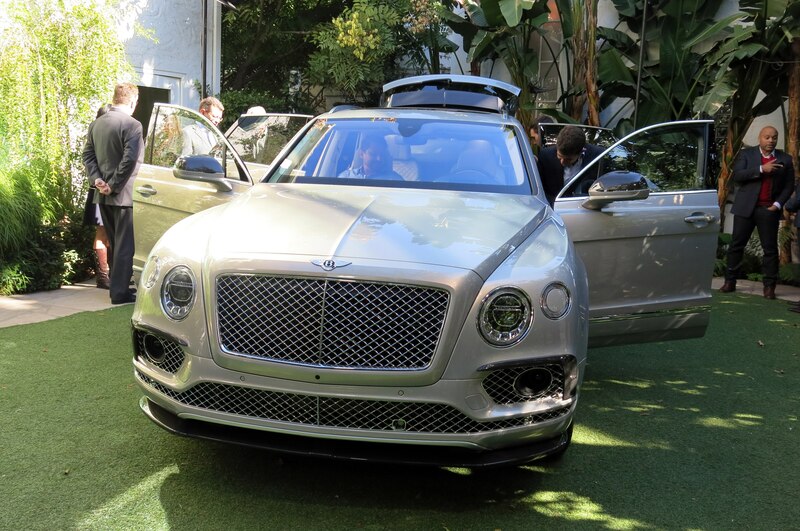 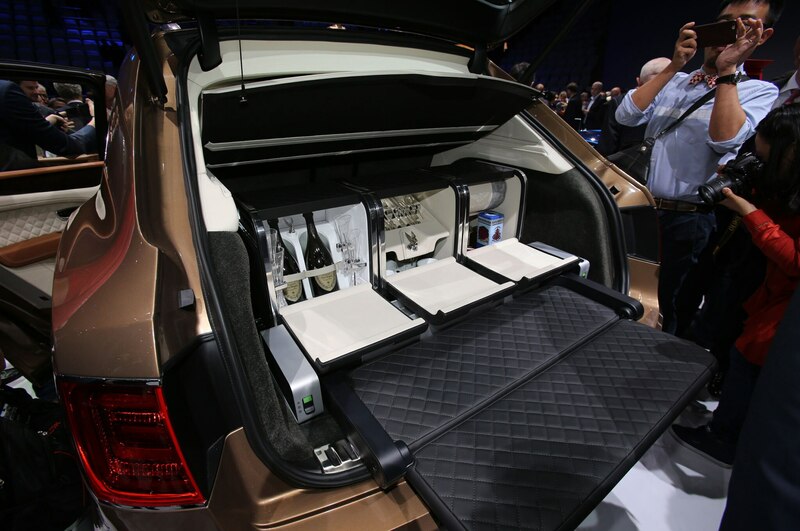 And that’s before you get drawn in by the personalization specialists who are bound to tempt Mr. and Mrs. Millionaire with such debatable must-haves as a lavish picnic-hamper set, the carbon-fiber-intensive styling specification, and the anodized demi-black brightwork kit that gives the Bentayga a distinct Batmobile touch. 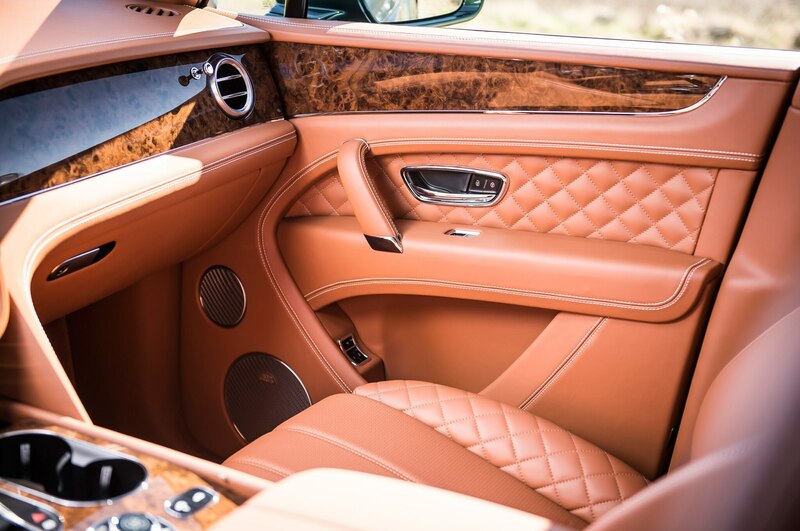 Money-is-no-object clients who order special paint, bespoke leather, and a high-end sound system on top of all the other goodies should brace themselves for a grand total well in excess of $300,000. 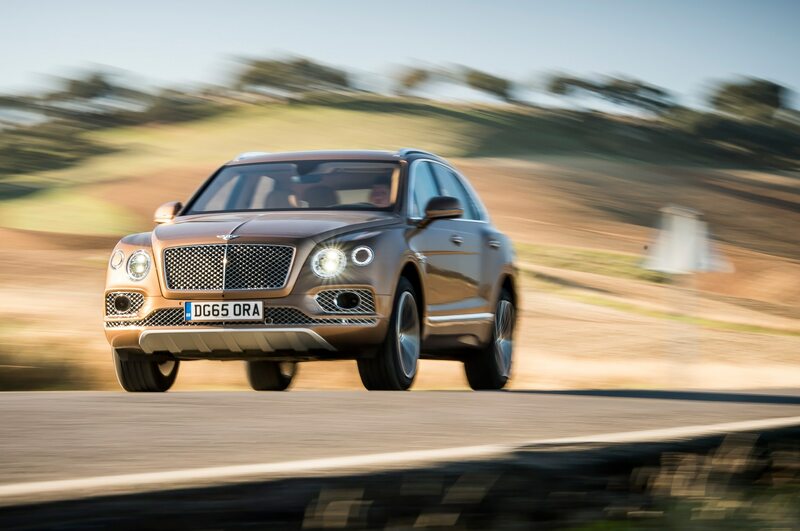 Bentley at a later stage will also offer the Bentayga with a less expensive V-8 engine in gasoline and diesel form and as plug-in hybrid. 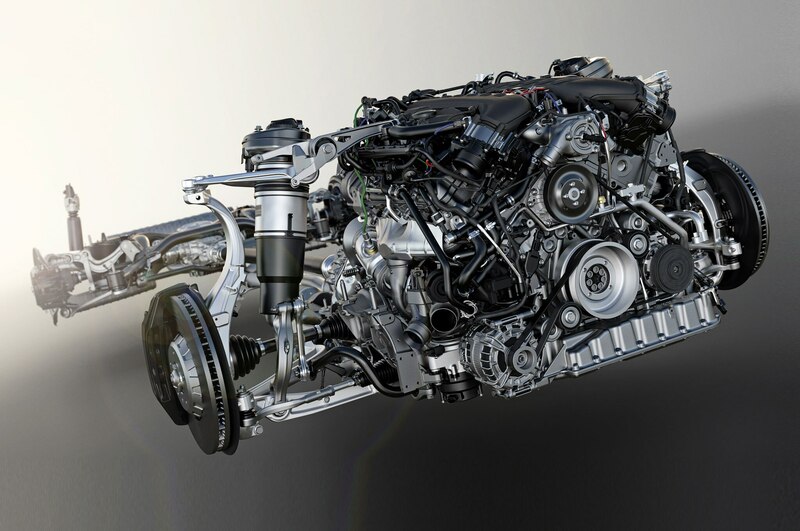 When deliveries commence in early 2016, however, the only available powerplant is the re-engineered 6.0-liter W-12, which now boasts cylinder deactivation, a combination of direct and indirect fuel-injection, and a start-stop system that cuts the engine long before the coasting vehicle comes to a halt. 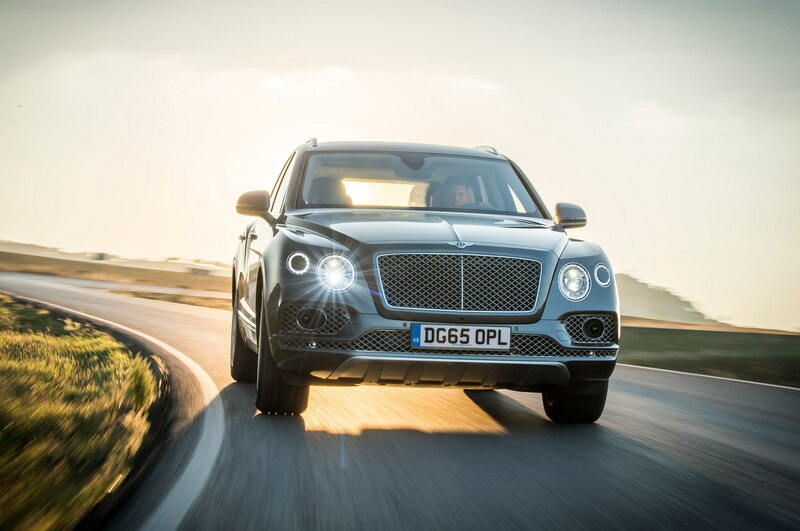 While the average fuel consumption dropped by 11.9 percent to a highly theoretical (at this stage) 21.6 mpg combined for city and highway driving, maximum torque increased to 664 lb-ft — on tap from 1,250 to 4,500 rpm. 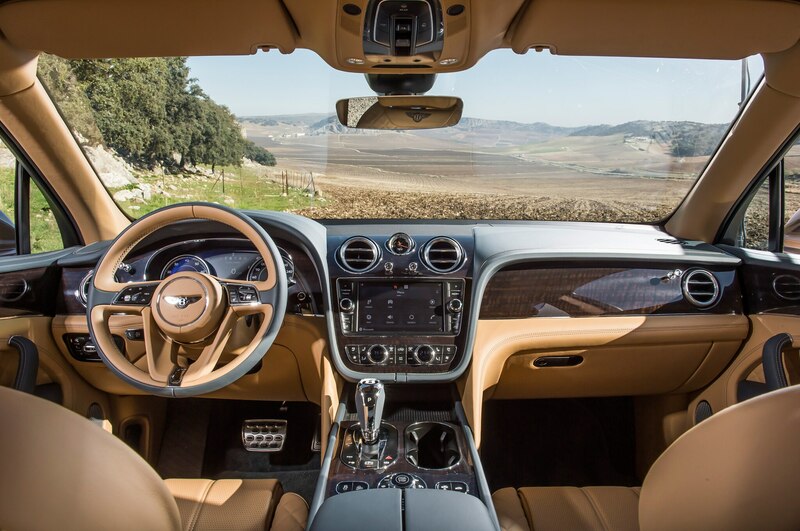 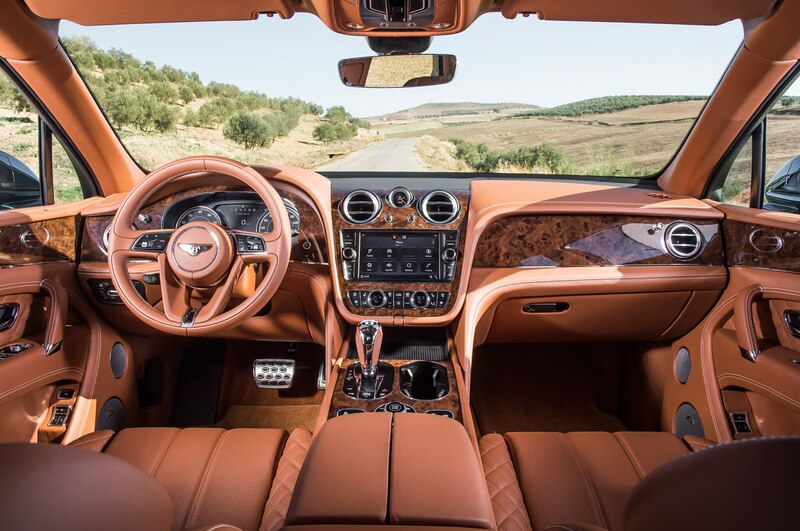 The maximum output of 600 horsepower falls only 26 hp short of the muscular Continental GT Speed. 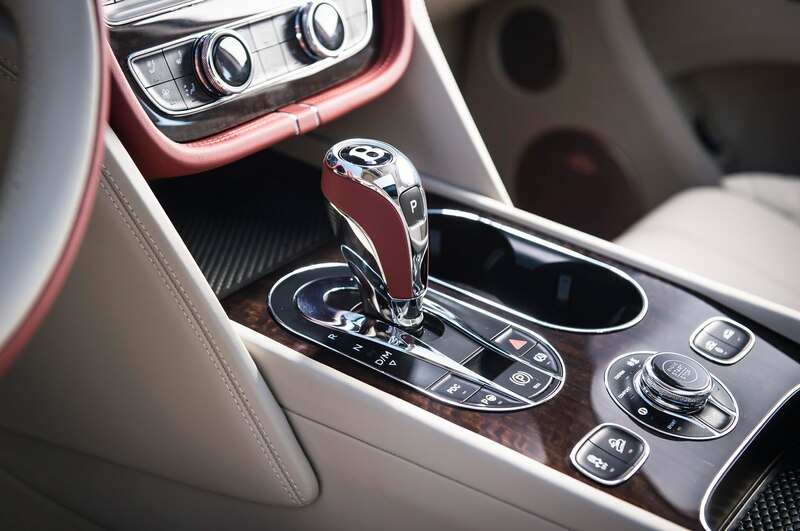 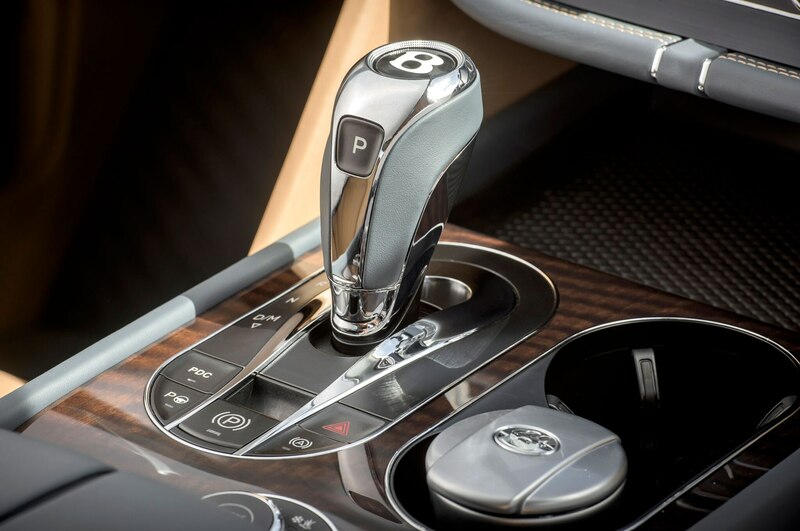 An eight-speed automatic is in charge of gear selection and torque distribution. 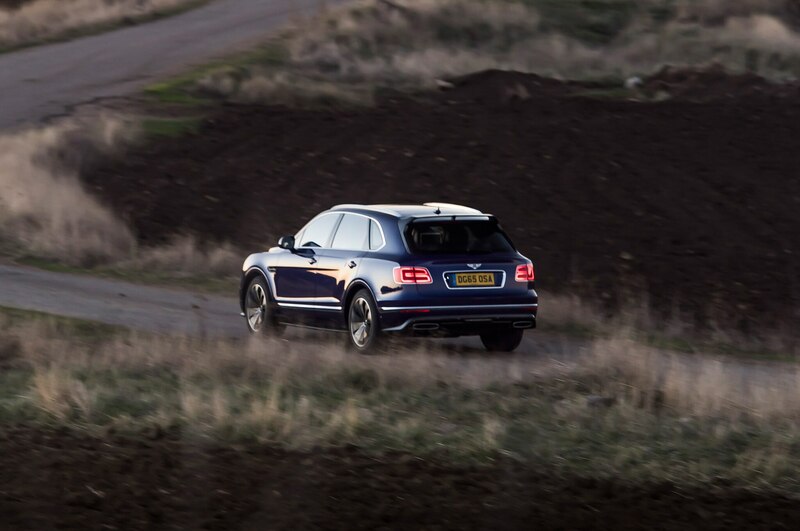 Assisted by the standard all-wheel-drive system, the Bentayga roars from 0 to 60 mph in 4.0 seconds, with its rivals from Munich, Stuttgart, and Solihull hot on its heels. 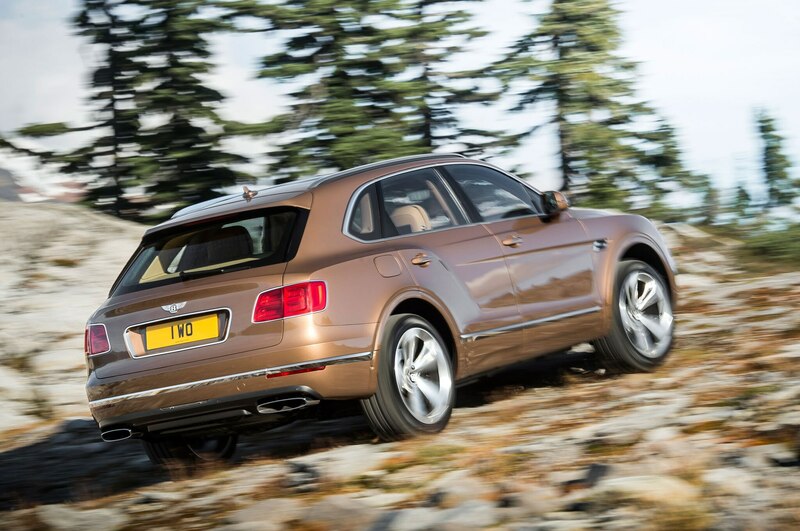 Beyond 175 mph, though, the Bentley is without peer. 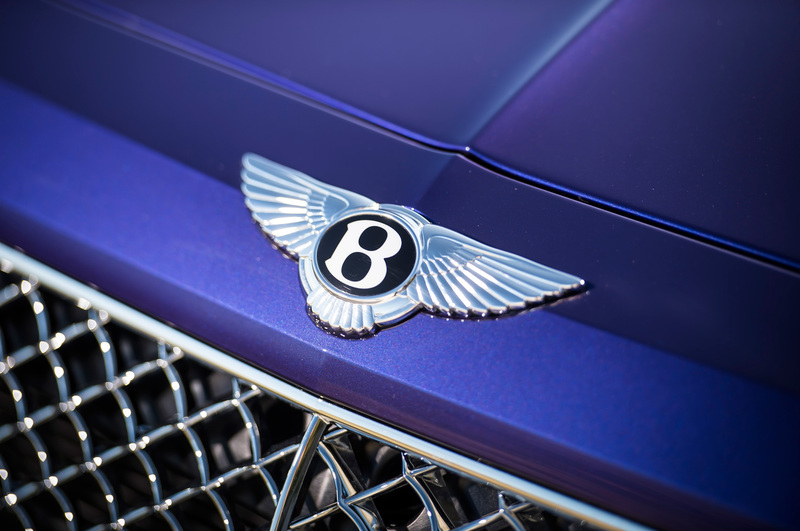 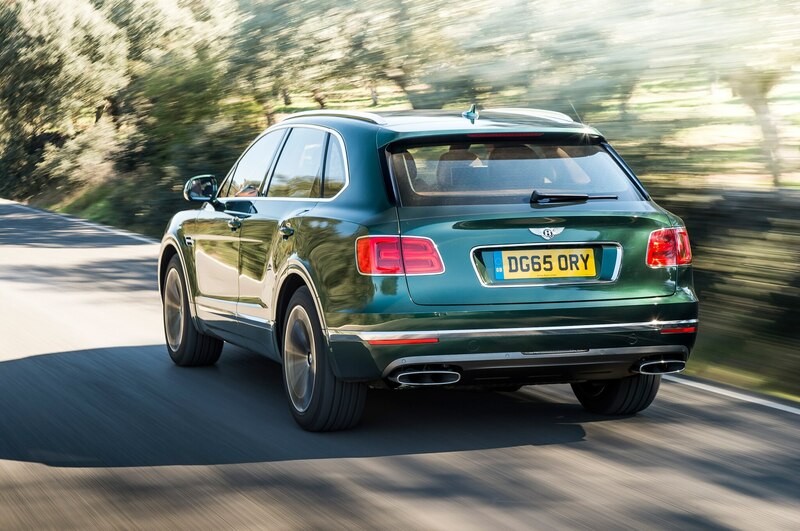 Thanks to its remarkably slippery drag coefficient of 0.24, the relatively small frontal area and the low-riding suspension, the Bentley is the only SUV to date that cracks the 186-mph barrier. 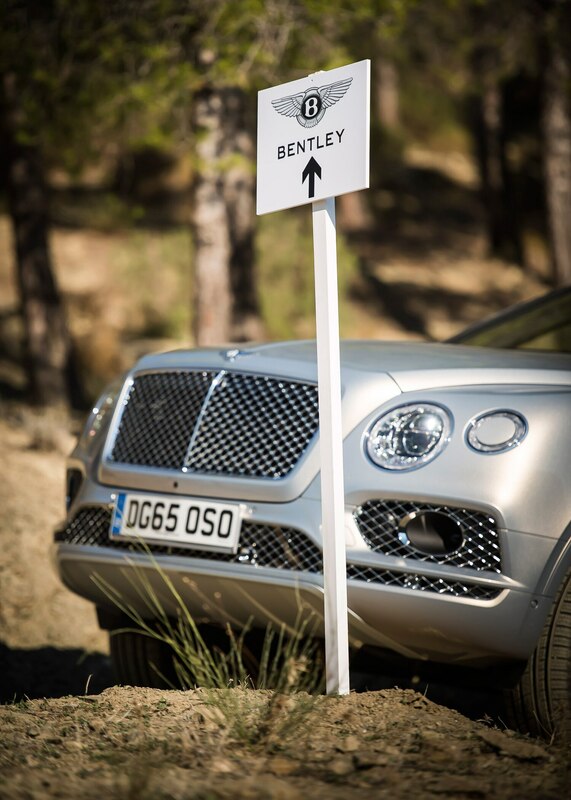 No, please don’t think of it as a paper tiger that takes ages to get its act together. 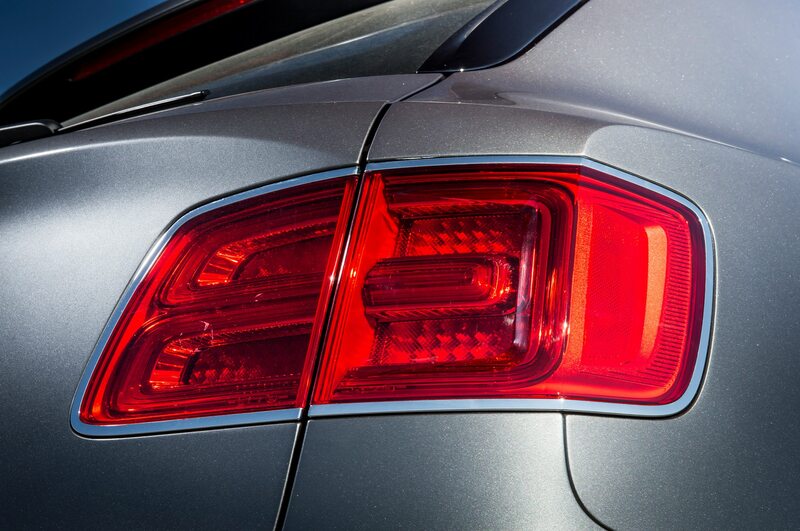 Quite the contrary: The relentless turbine-like urge continues beyond 150 mph, fusing wind noise, road noise, and mechanical noise to a catchy techno jam session in B-minor. 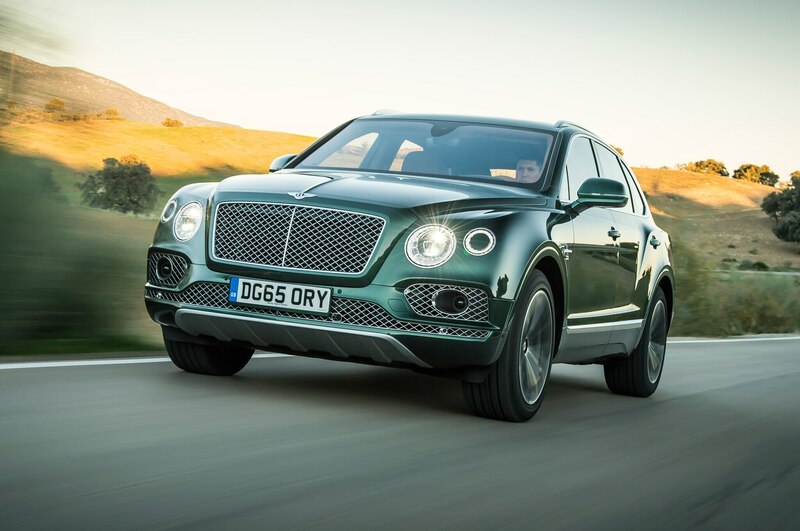 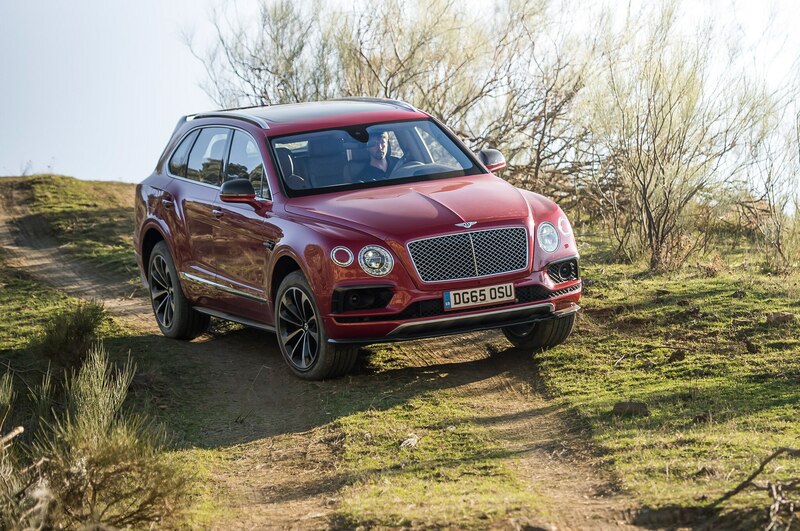 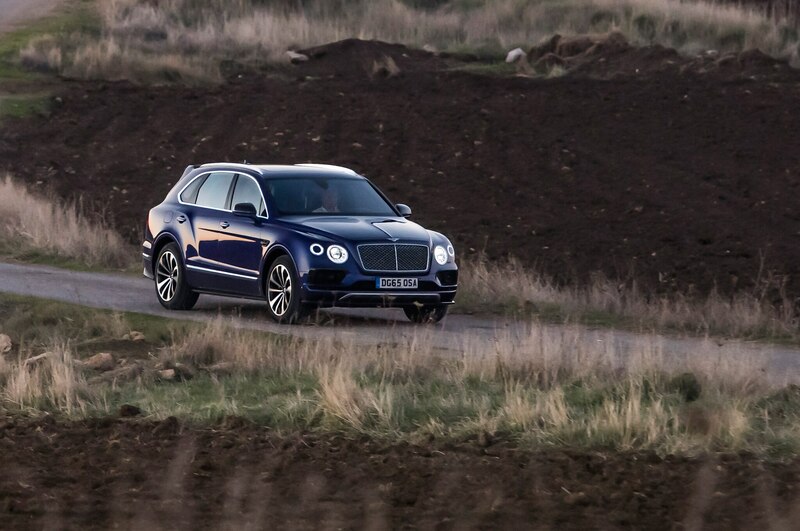 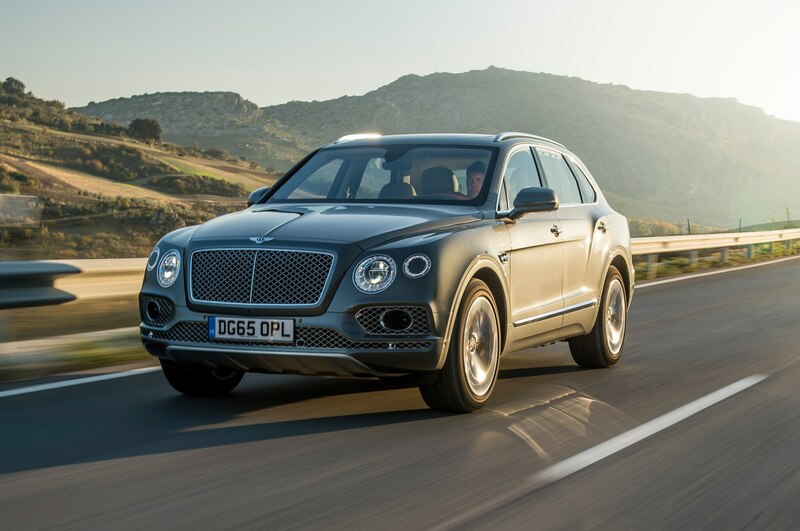 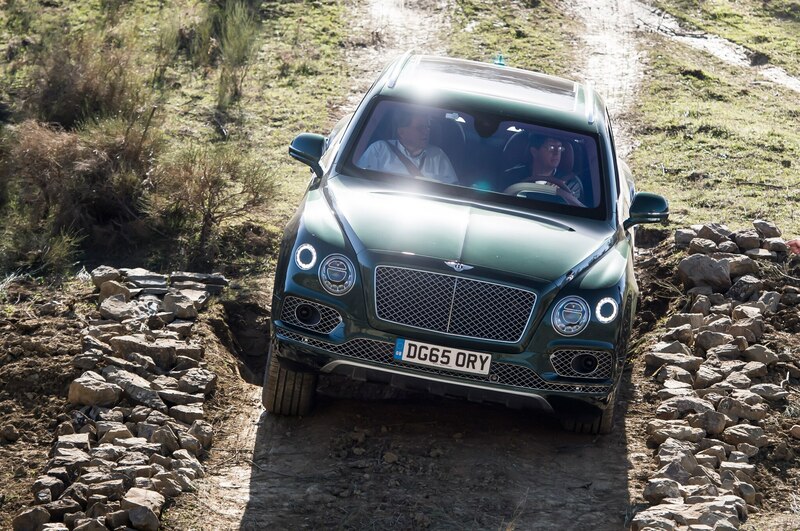 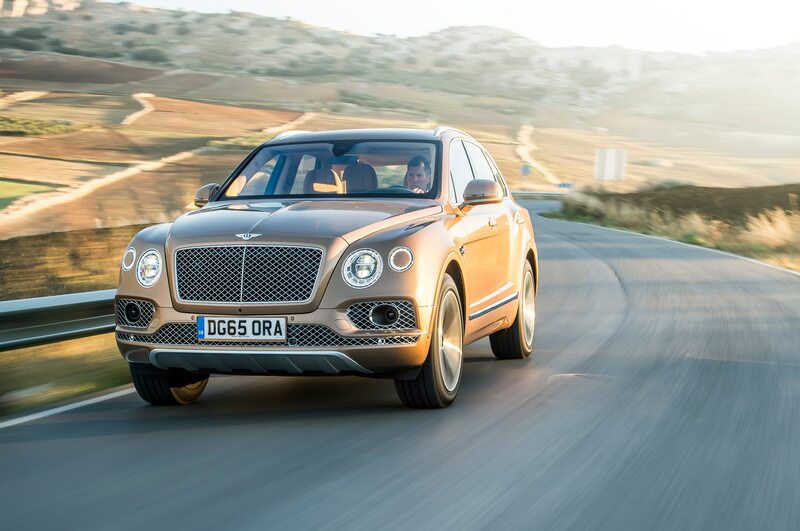 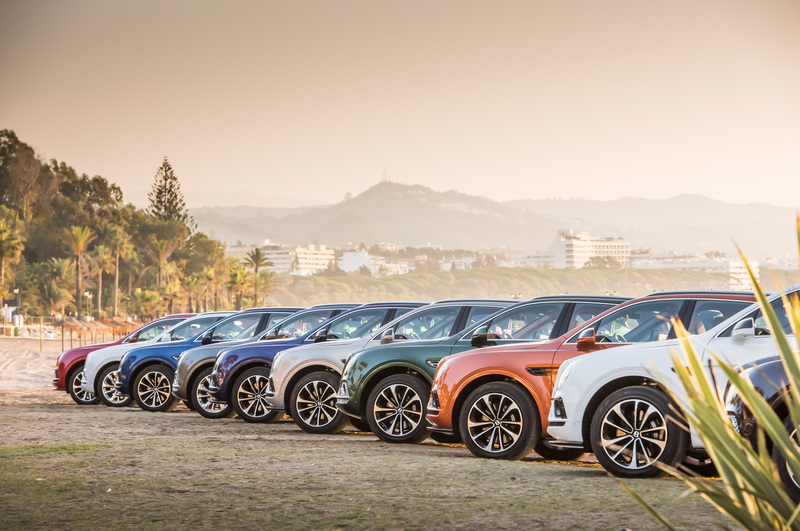 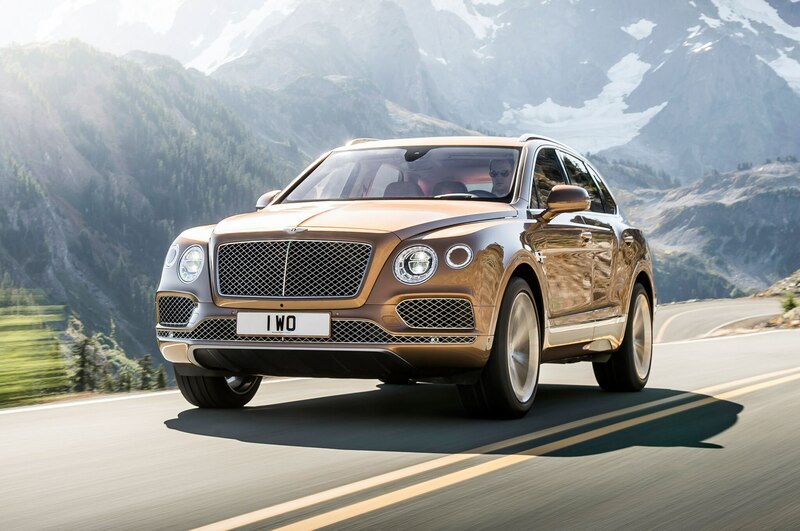 The Bentley Bentayga passed through the same genetic gateways as the Audi Q7, the successors to Volkswagen’s Touareg and Porsche’s Cayenne, and the all-new Lamborghini Urus. 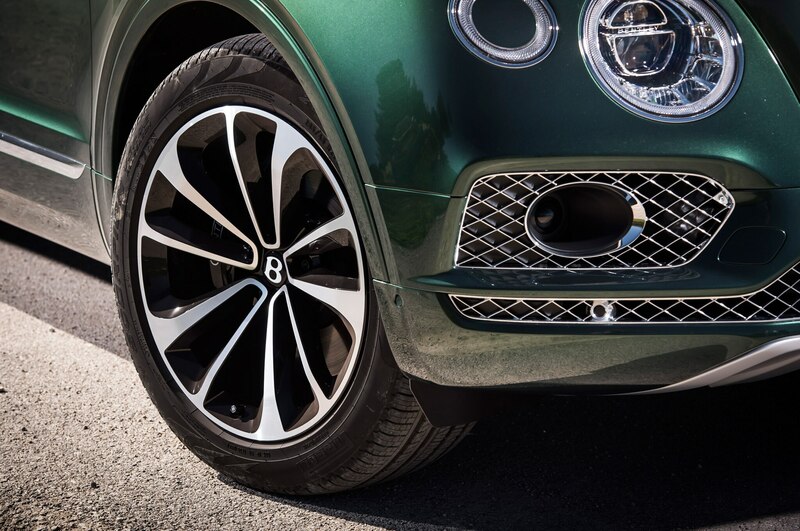 Bentley and Audi sit on the same long-wheelbase platform, and they also share the same Drive Dynamics Control/Drive Select MMI concept. 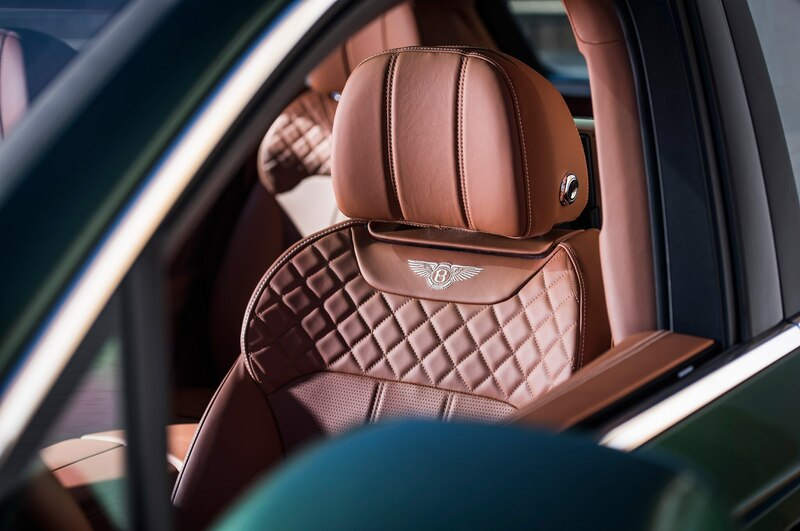 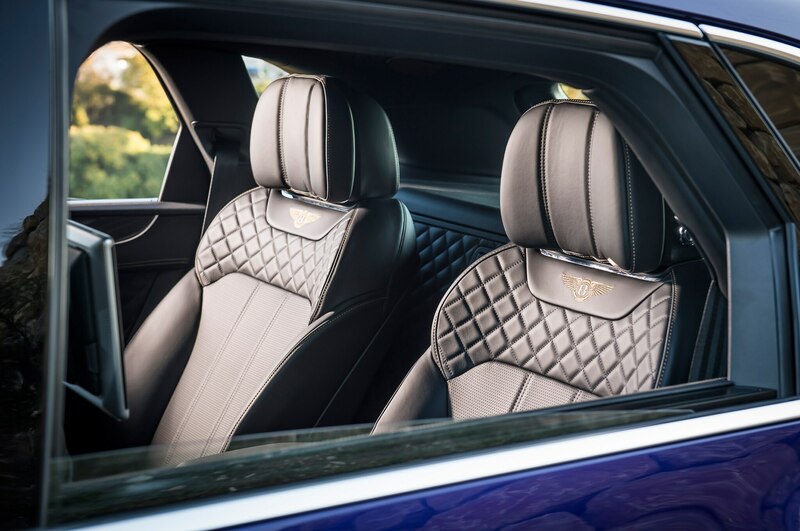 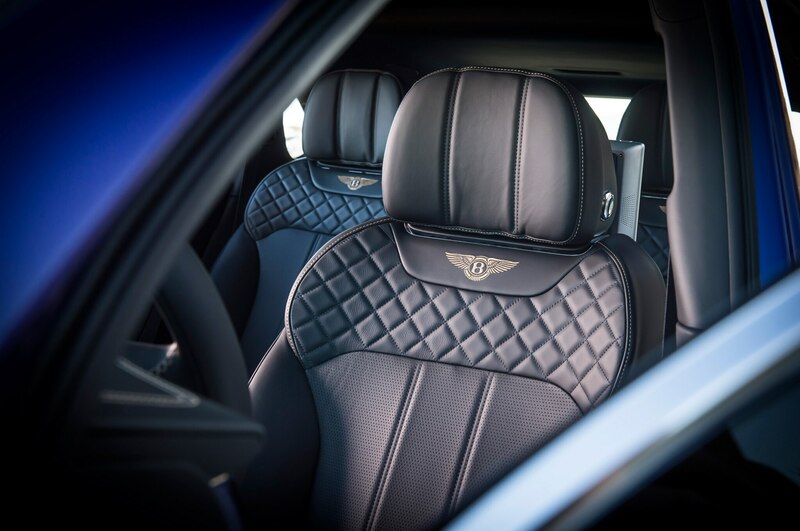 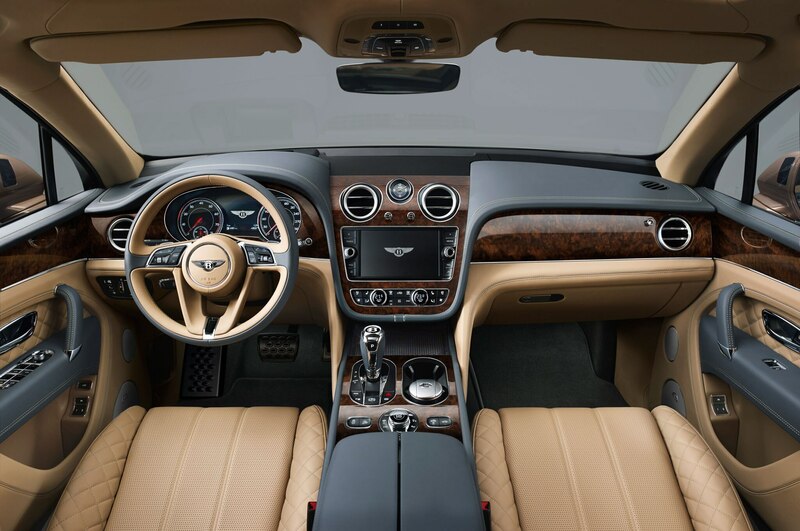 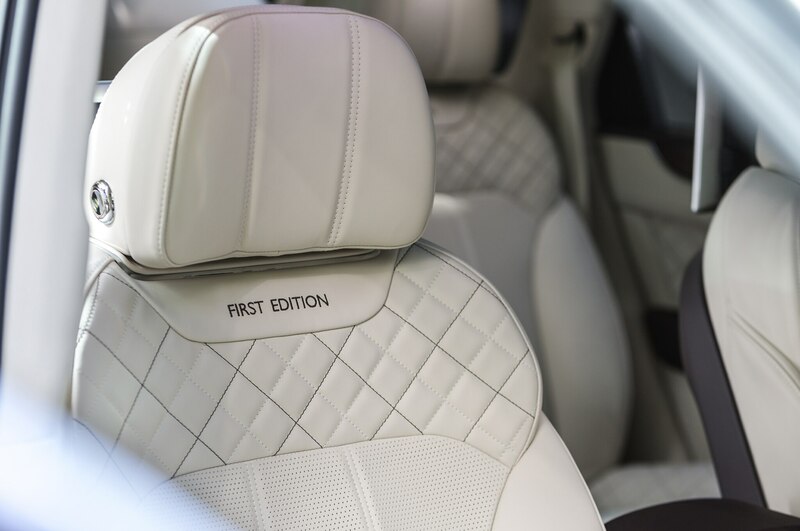 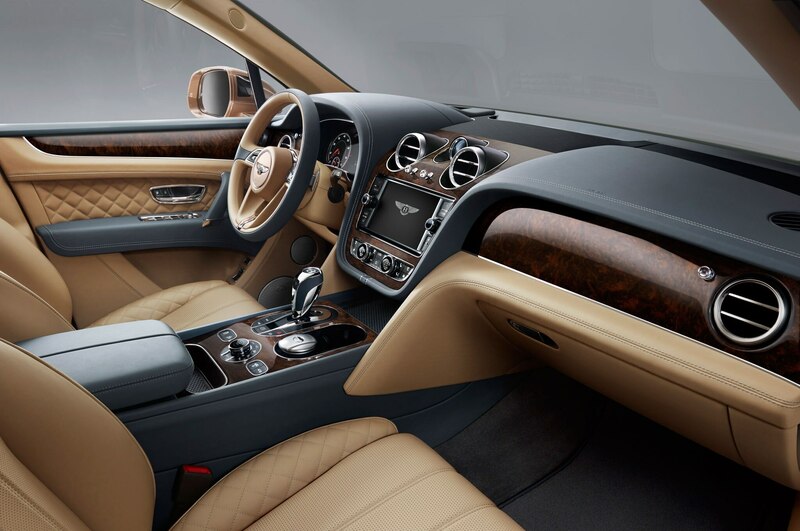 The base model lets you choose from Sport, Comfort, Bentley (what messieurs Dürheimer and Frech think is best for you), and Custom. 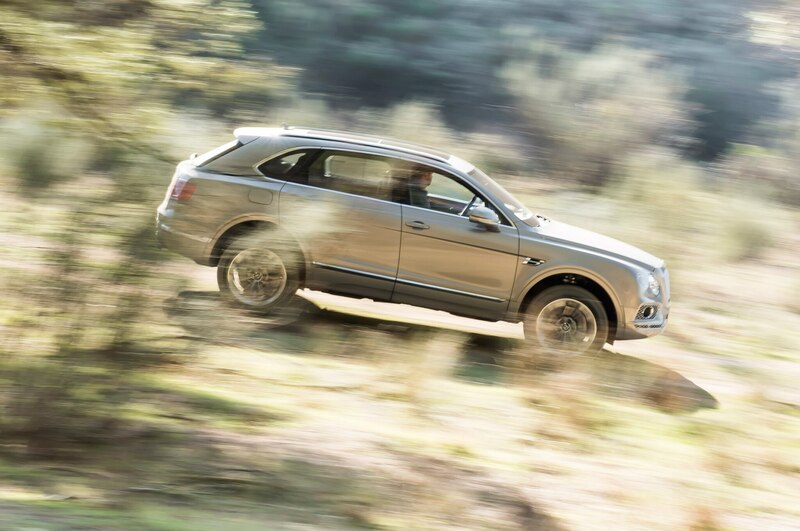 The All-Terrain specification adds four more programs labeled Snow & Grass, Dirt & Gravel, Mud & Trail, and Sand Dunes. 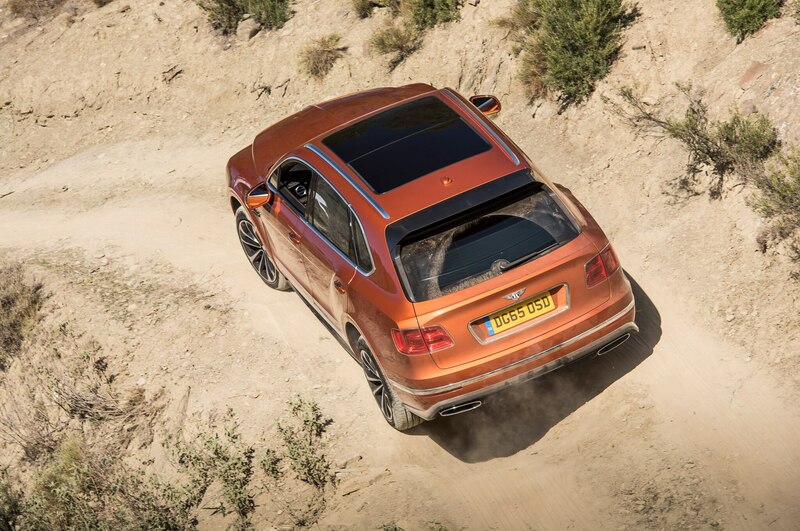 Despite hill-descent control and height-adjustable suspension, dedicated off-roaders should not opt for the boy-racer styling kit or for the exposed 22-inch rims. 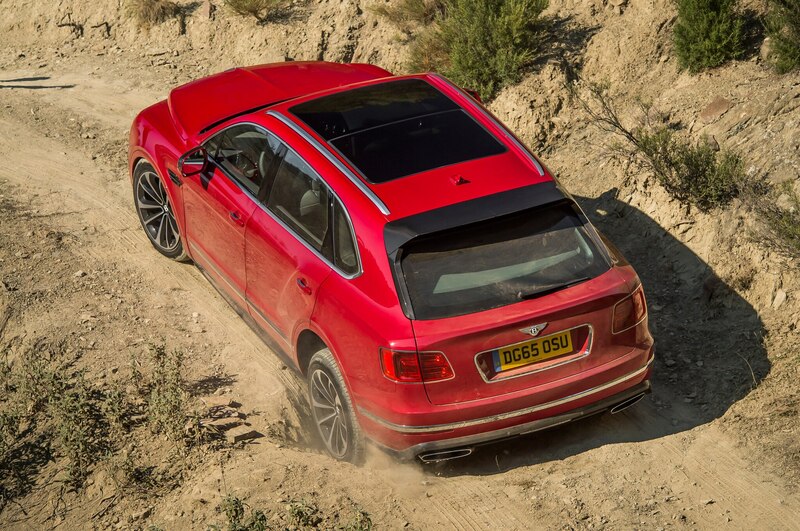 From memory, the Range Rover is a much better mud wrestler than the Bentayga, but fact is that both competitors feel more at home on gravel driveways than on the Rubicon Trail. 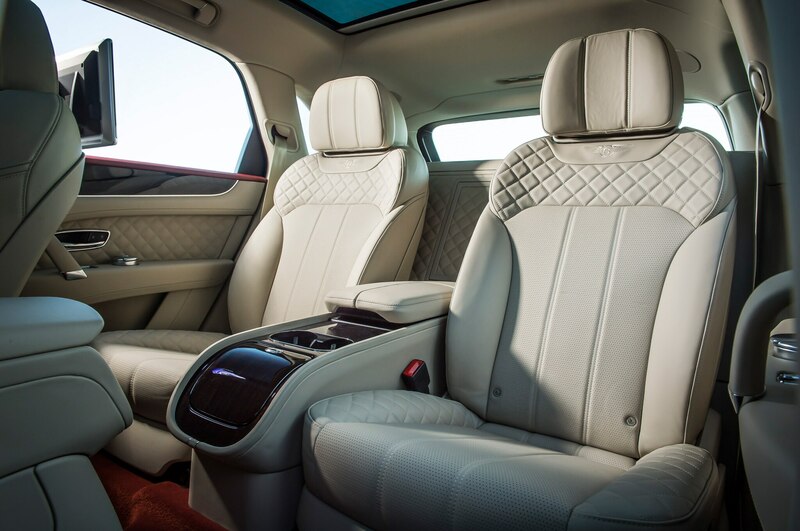 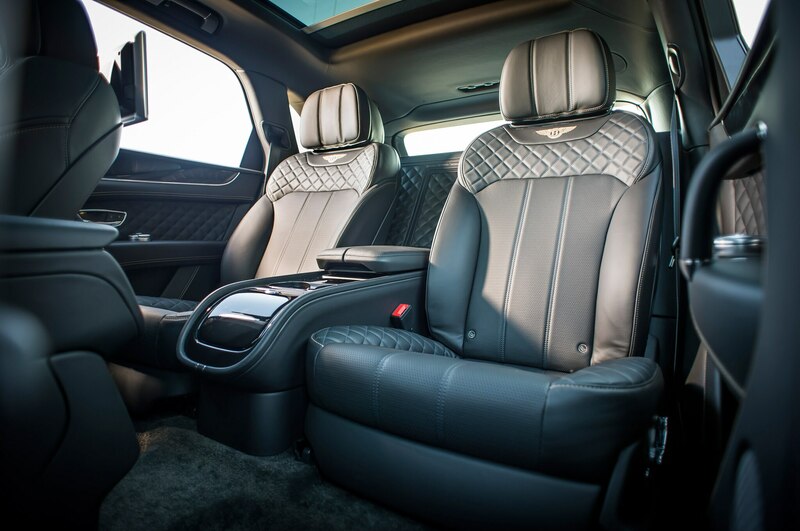 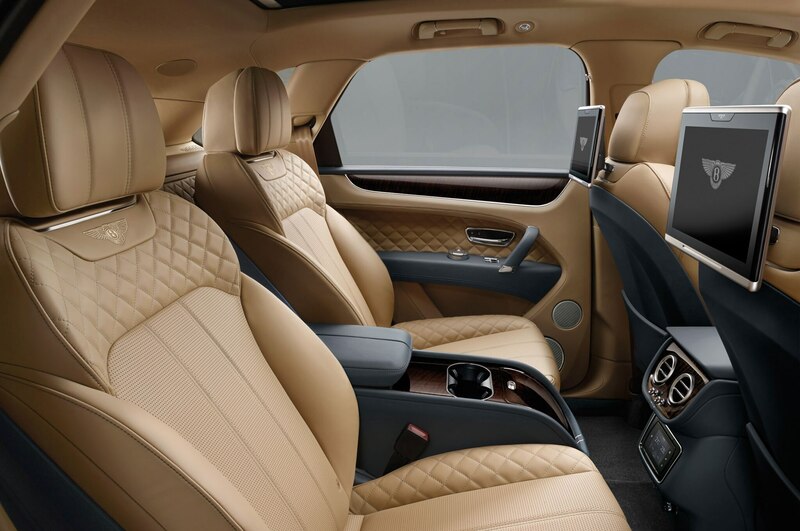 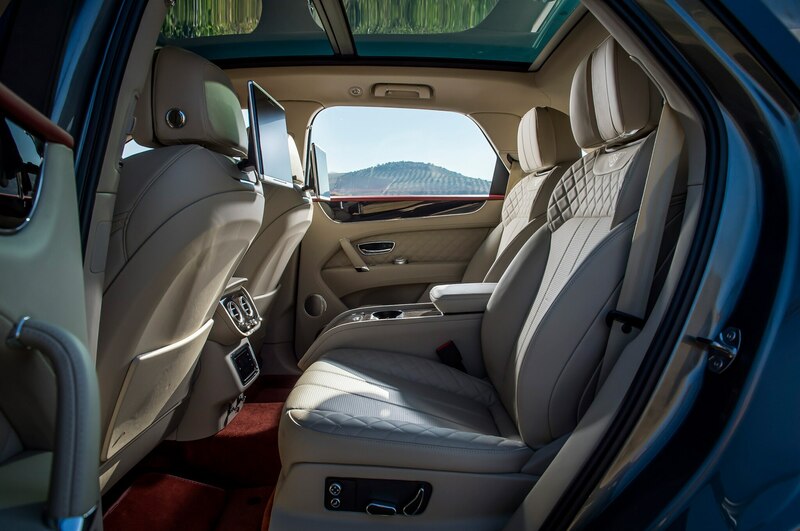 While the driver and front passenger travel in superior style and comfort, rear head- and legroom disappoint. 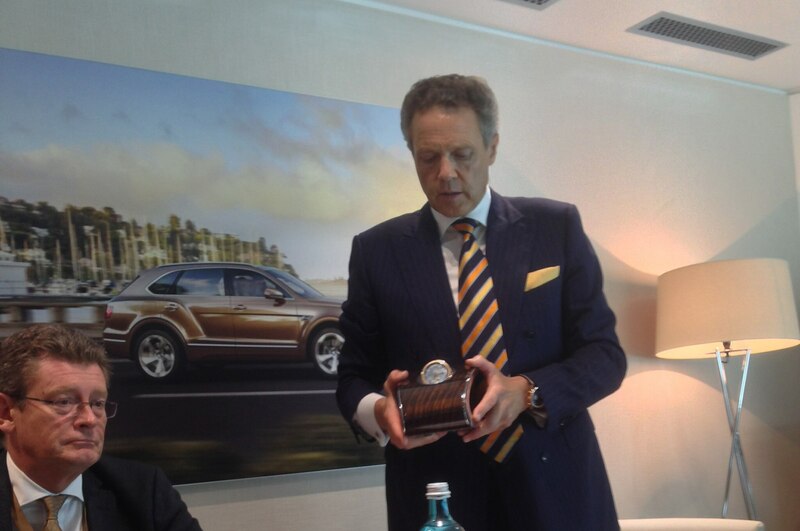 Predictably, the head honcho disagrees. 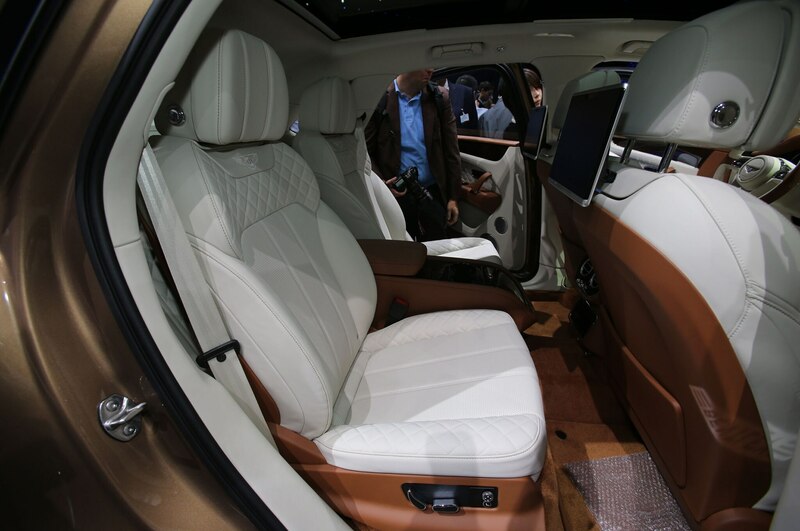 “In the back of our car, you sit slightly higher up and fractionally further back than in its sister model sold by a well-known Bavarian brand,” Durheimer says. 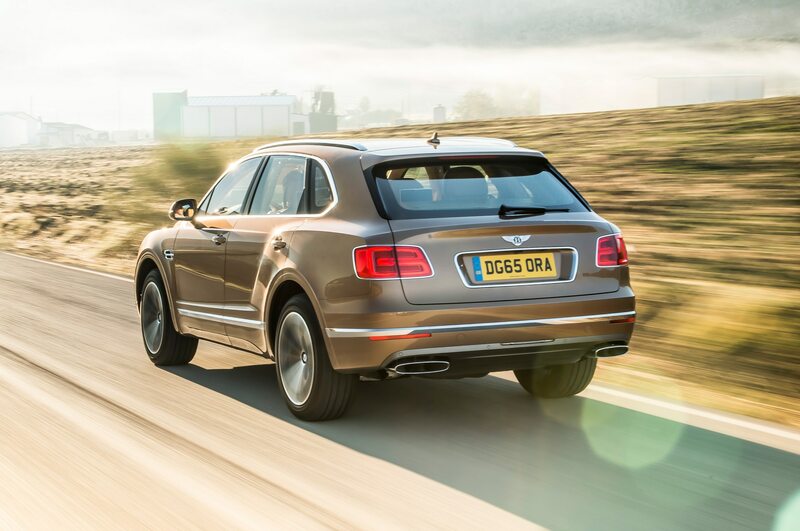 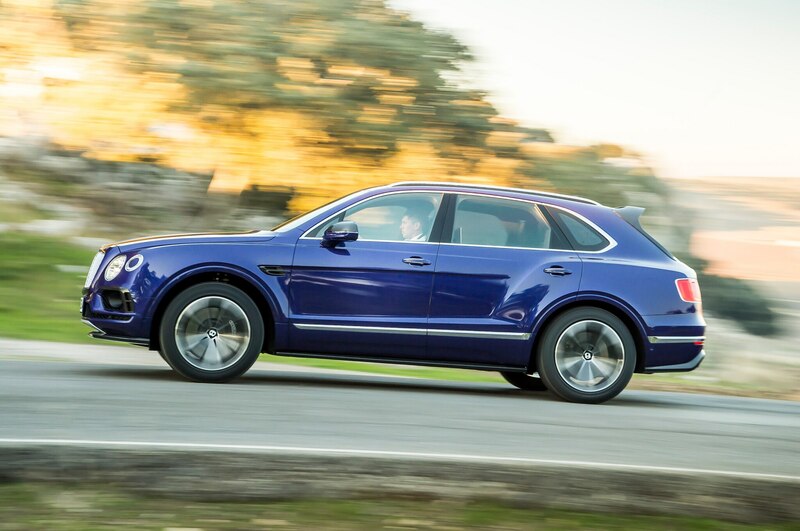 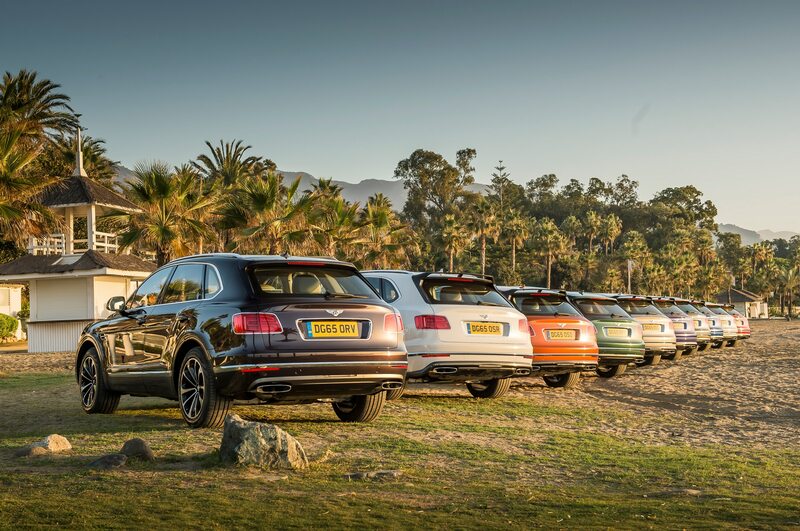 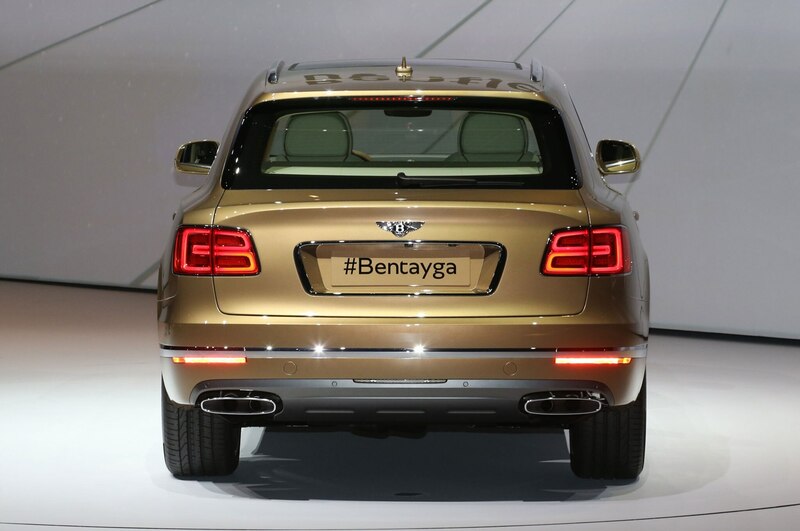 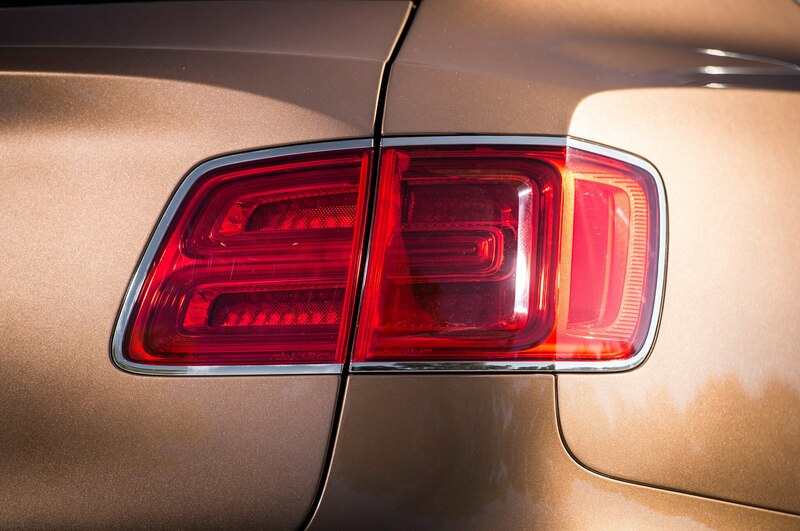 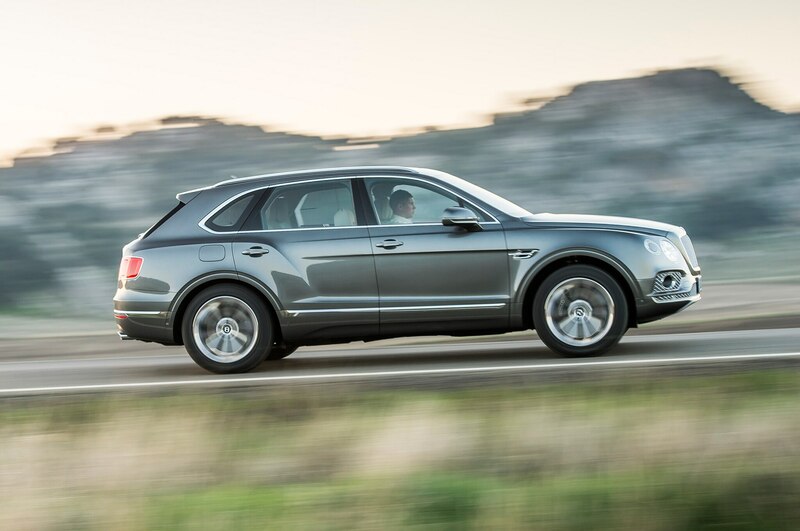 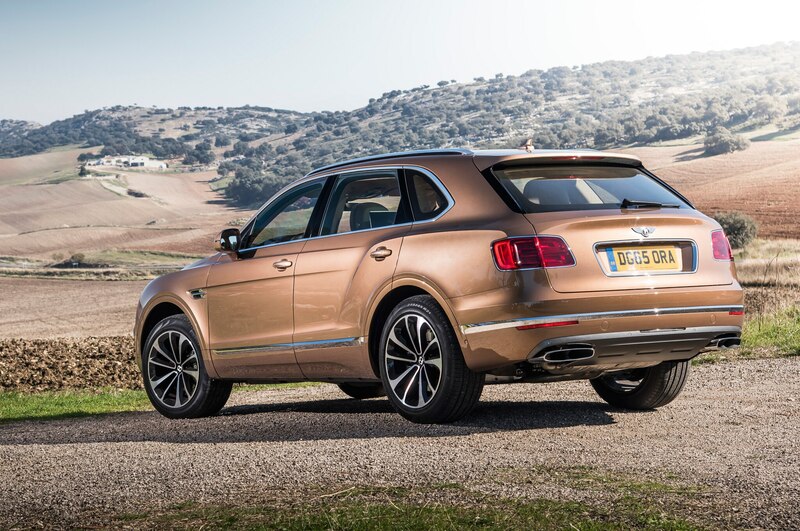 Despite its unbalanced weight distribution of 57.5 percent front/42.5 percent rear, the Bentayga is not in the same stodginess league as a VW Touareg V8 TDI or the discontinued Audi Q7 W-12. 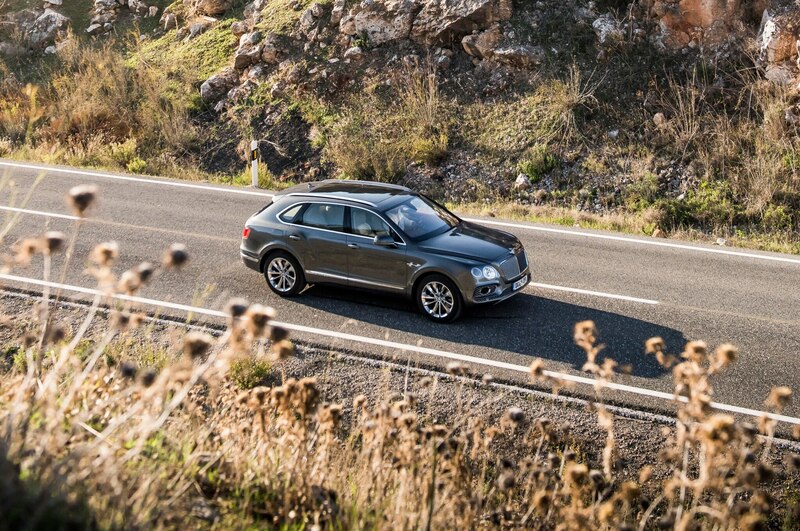 True, unassuming drivers will experience an unassuming attitude. 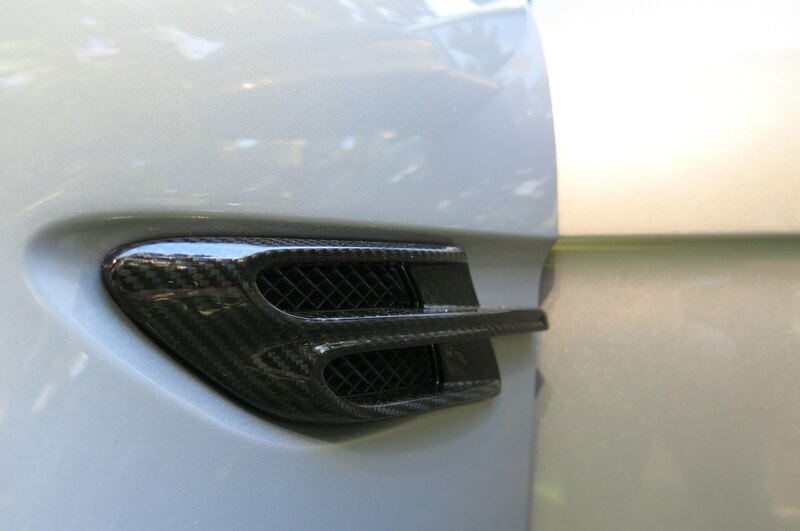 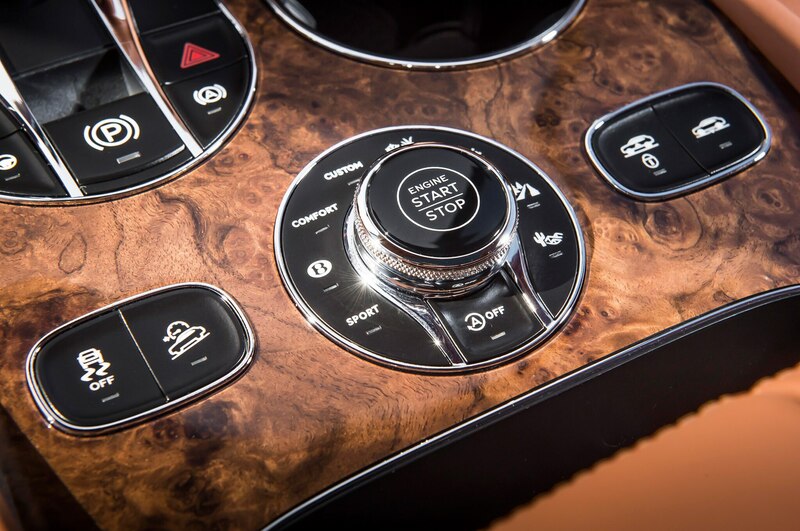 But hit the right buttons in the right order, and the car’s character changes duly from stately to inspiring. 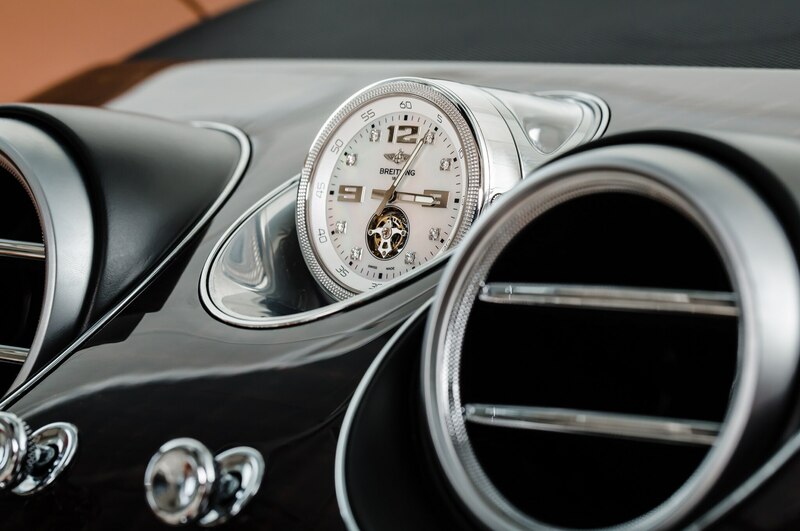 For a start, lock the DNA in Sport, thereby firming up all variables. 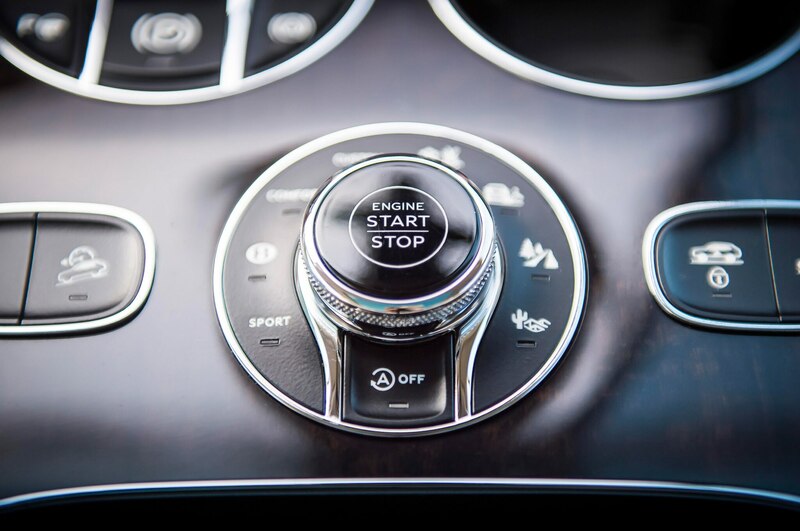 Next, switch off ESC. 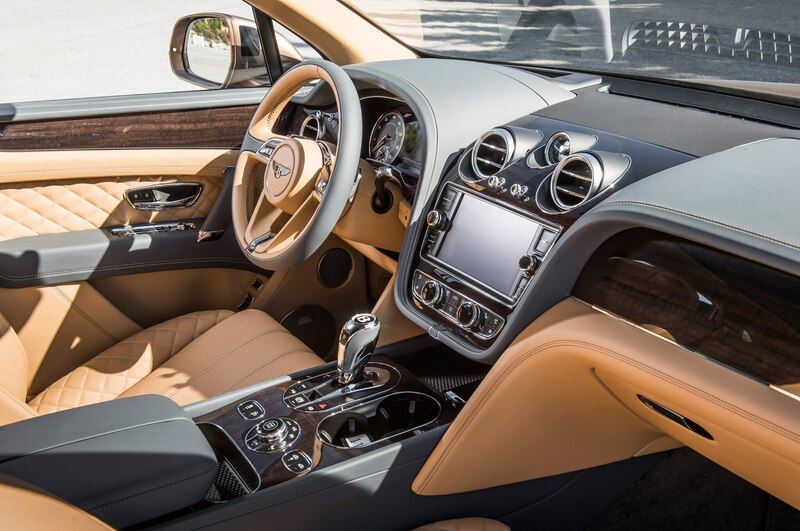 No, not good enough. 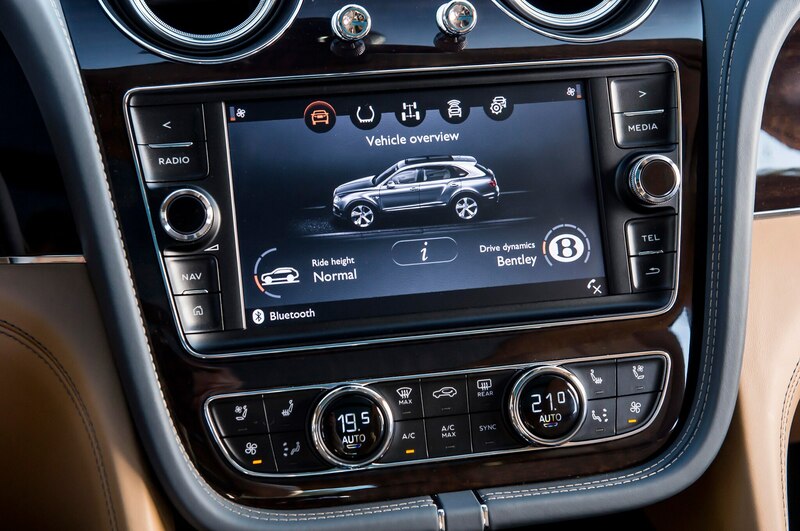 Keep the button pushed for at least 7 seconds until a second yellow warning light appears. 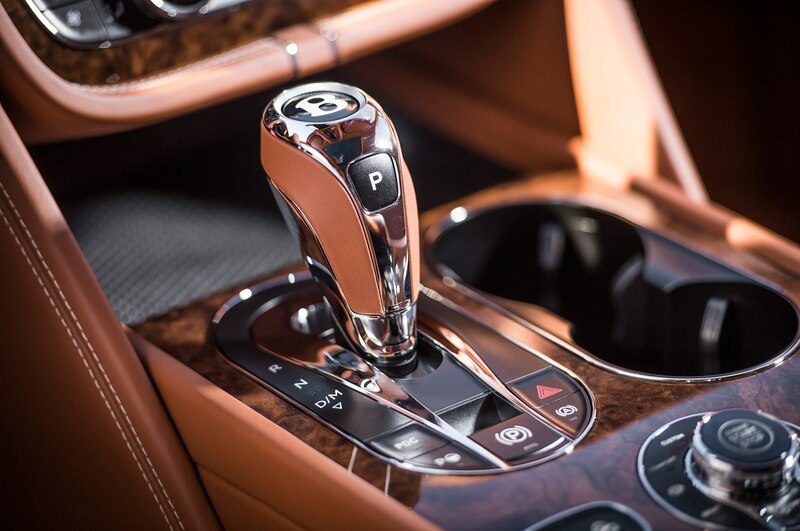 Now pull the gear lever all the way down, through S into M for manual. 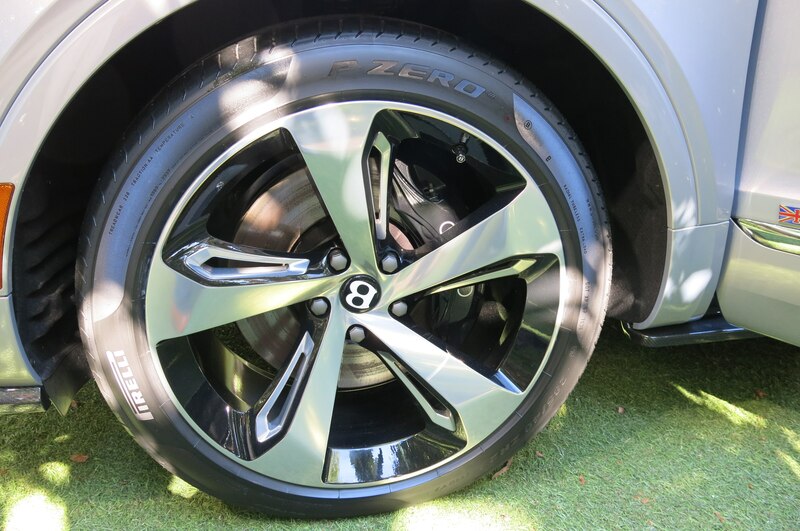 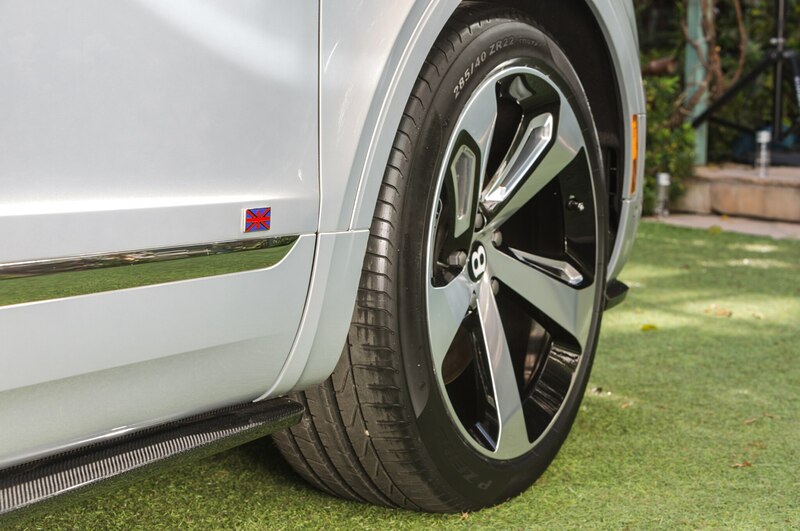 Last but not least, reducing tire pressure by up to 7 psi after 15 or 20 minutes of hard charging helps to regain composure on a hot day. 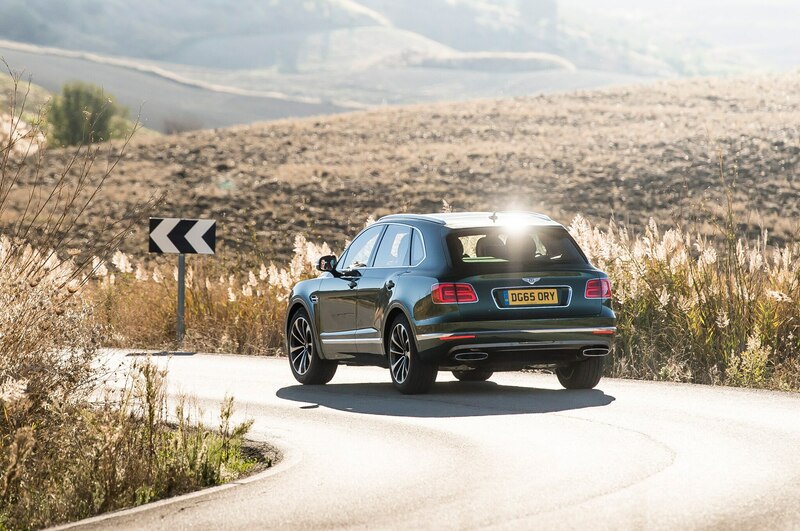 An empty roundabout is all it takes to become familiar with power oversteer. 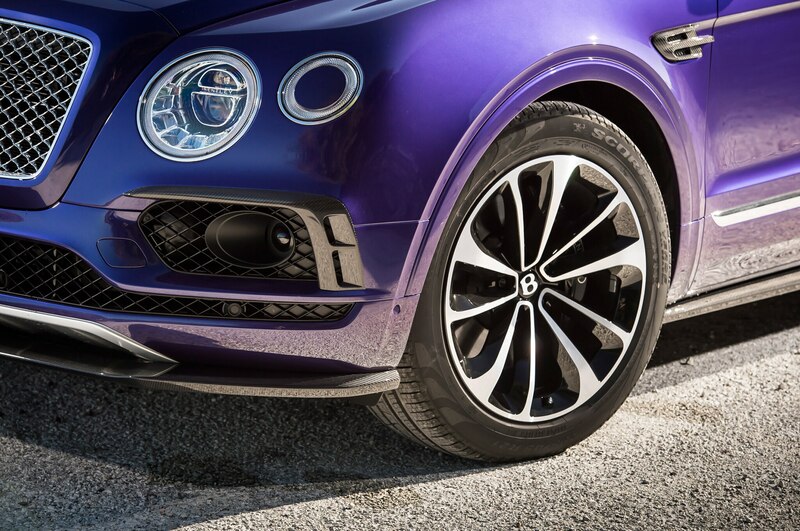 From now on, every open second-gear bend is a clear invitation to paint the tarmac black with freestyle graffiti. 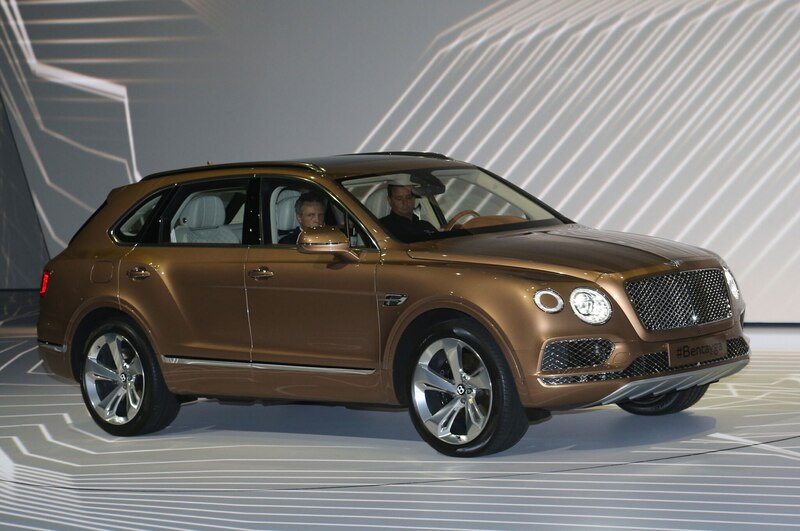 True, the Bentayga is not the only slidemeister in the high-dollar SUV segment. 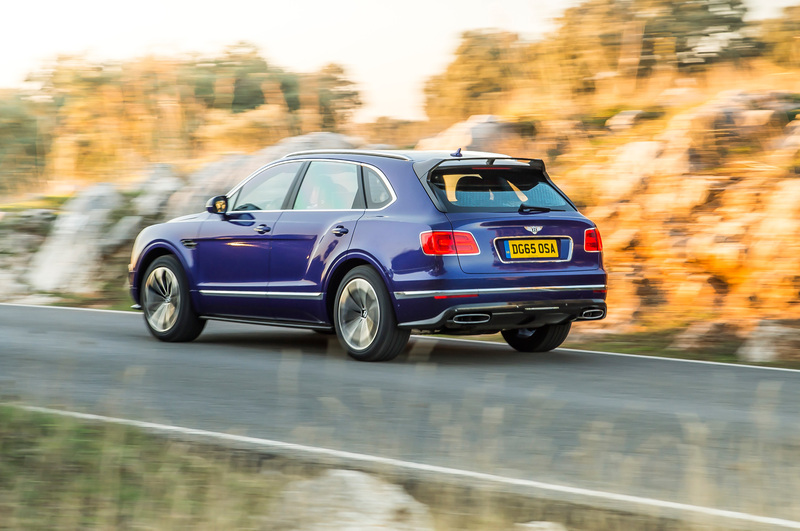 Range Rover Sport SVR, BMW X5 M, and Porsche Cayenne GTS are equally talented figure skaters, and they do sound more aggressive and emotional than the monosyllabic Bentley. 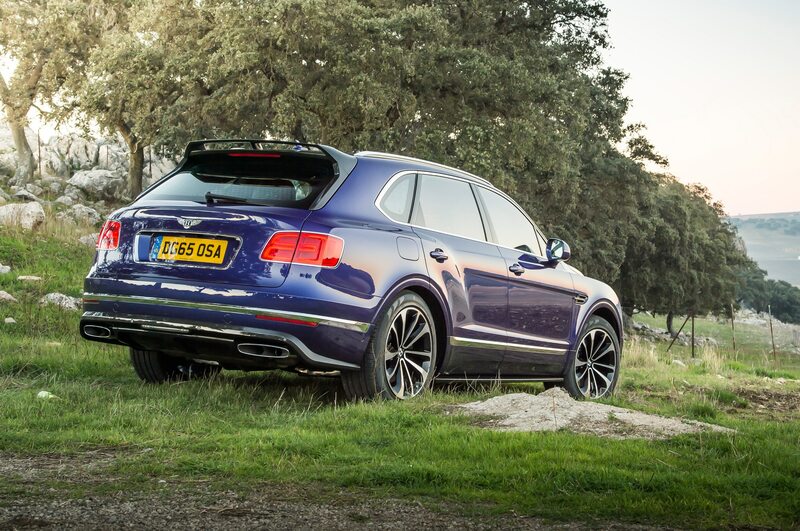 In doing so, the mighty mauler from the Midlands is always honest and transparent. 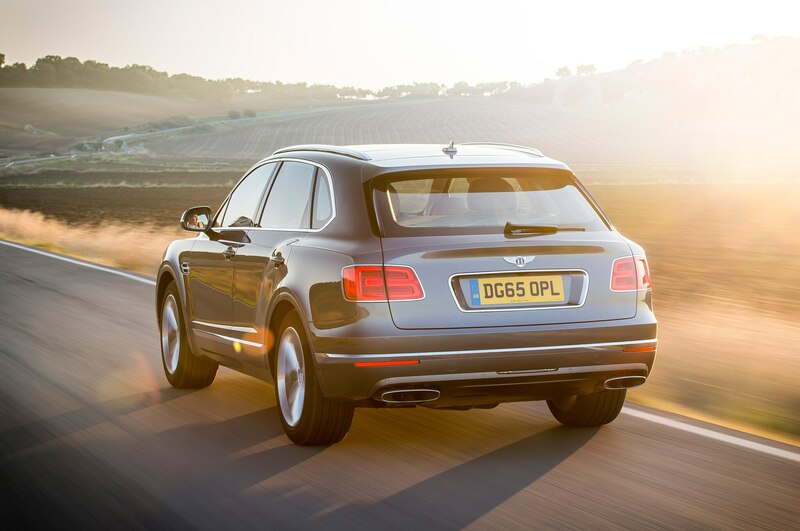 Its movements are progressive and predictable, its electronic-support brigade takes a back seat when the driver is in a playful mood, and its cornering attitude adapts nicely to steering and throttle inputs. 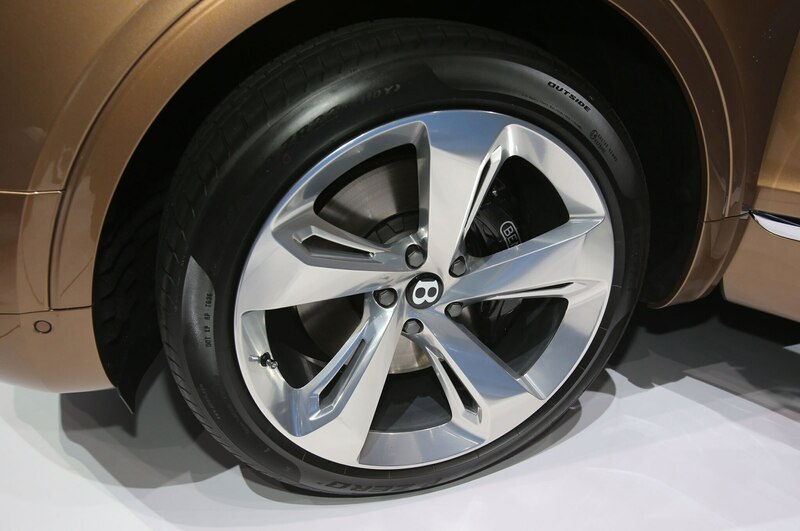 But you need to be quick to catch the heavy, faraway tail, you better build a safety margin into every borderline deceleration maneuver, and you should obey to the slow-in, fast-out principle or the front tires will lose grip in meltdown manner. 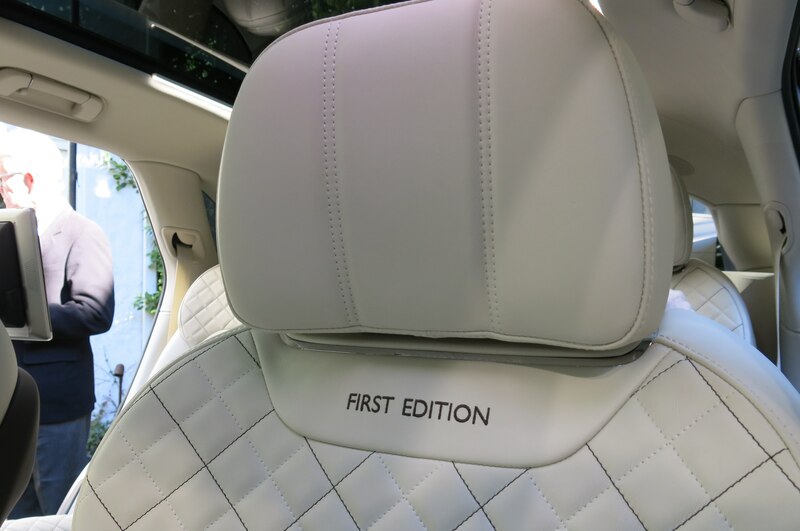 There was something else? 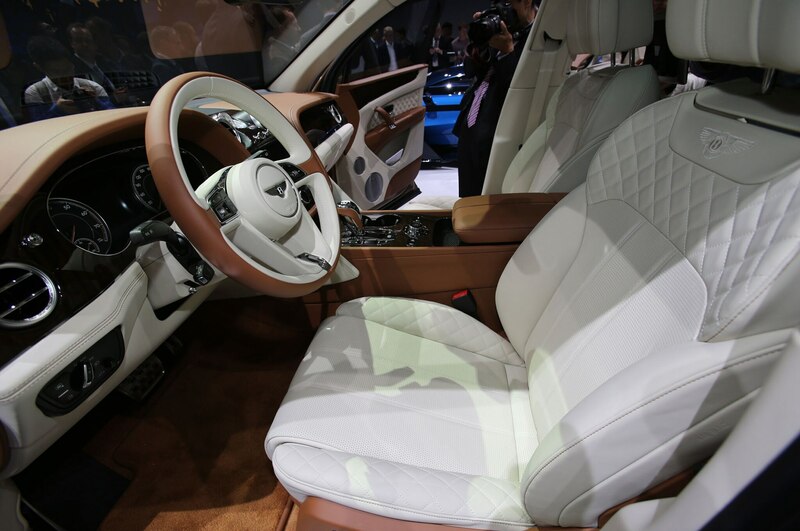 Ah, yes, the design: An early Donckerwolke, so to speak, but not exactly Luc’s best effort. 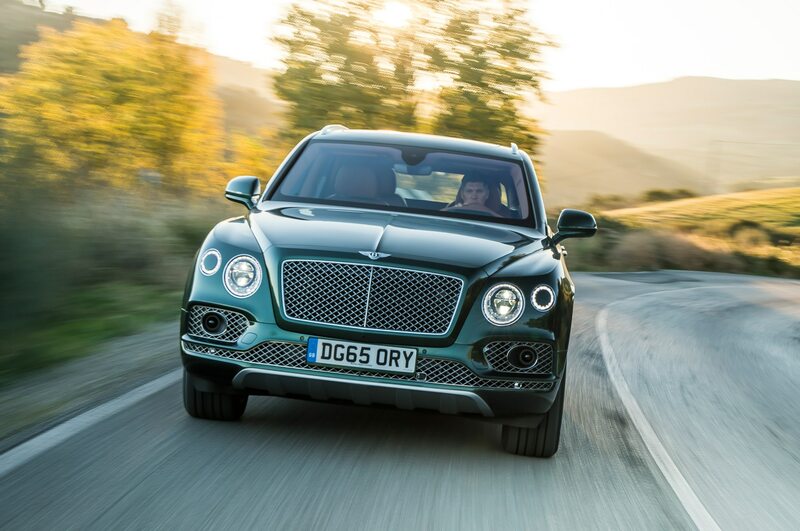 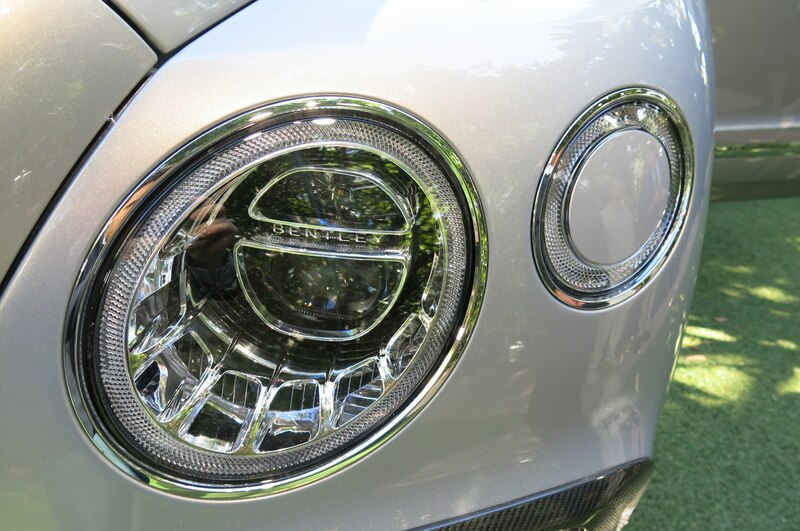 Although the marque has nursed a new top talent named SangYup Lee who penned the exciting EXP10, the EXP9 concept that gave a first glimpse of the Bentayga looked rather brash and overly glamorous. 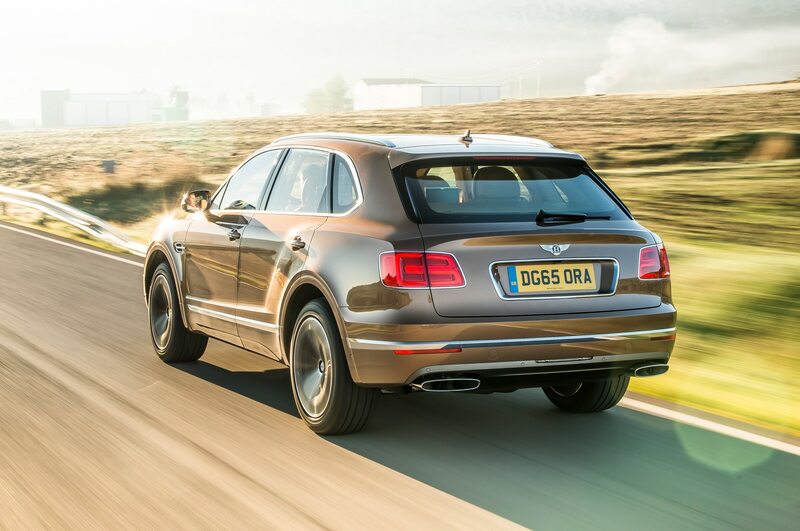 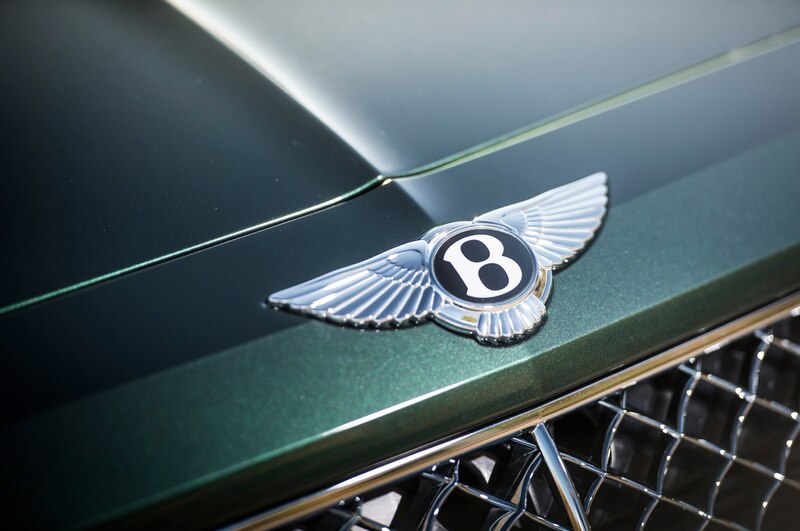 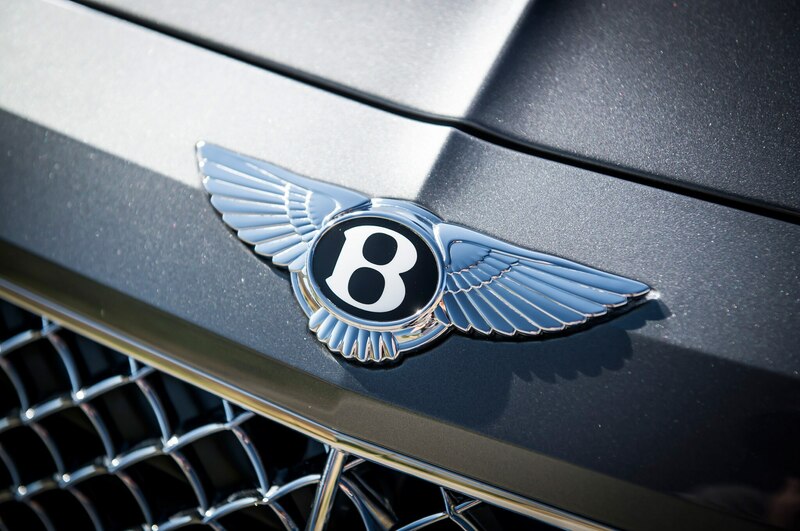 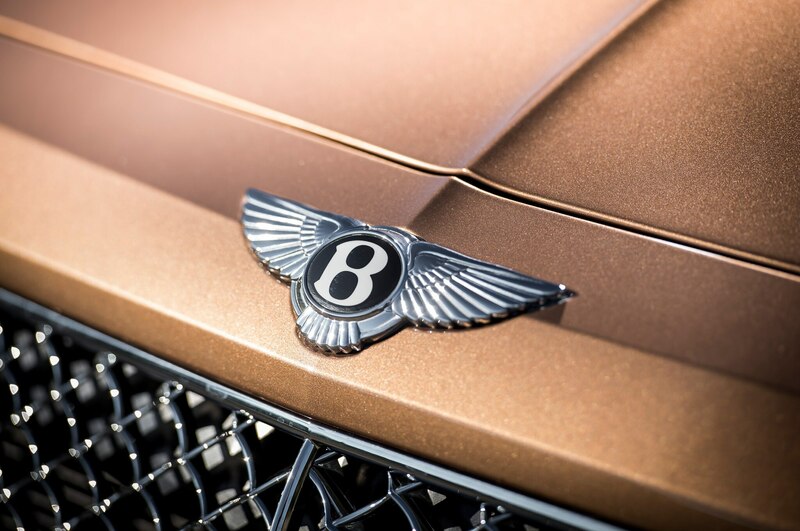 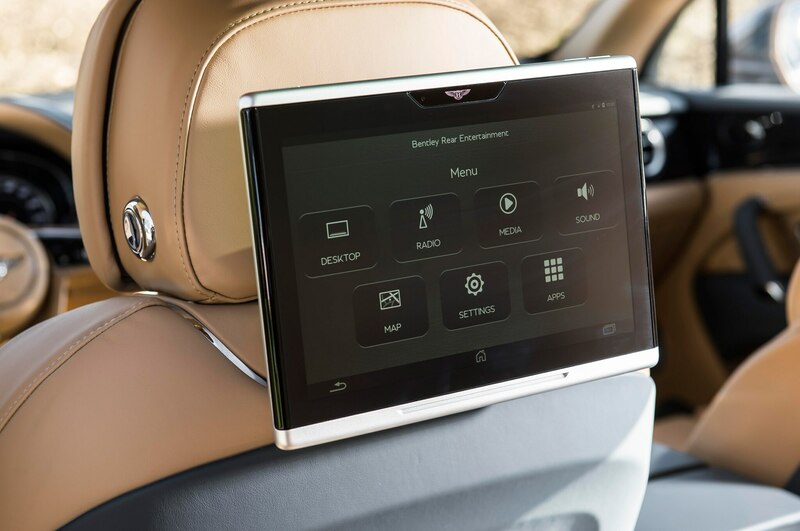 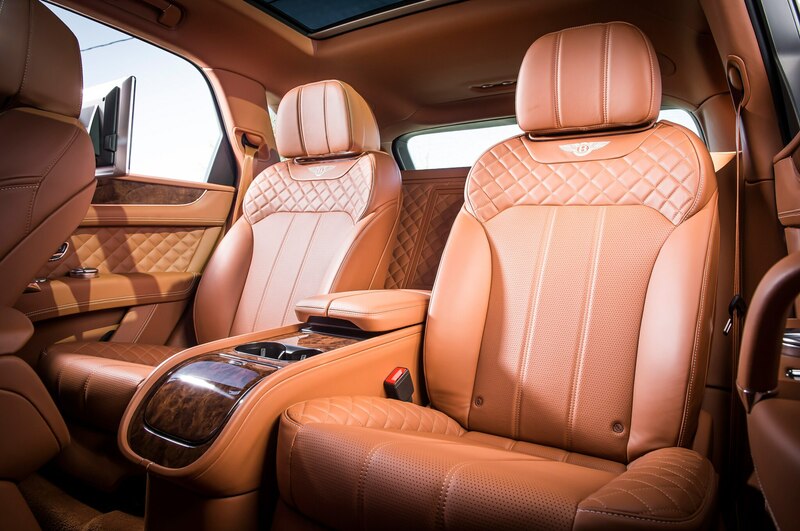 When Bentley showed the car to customer clinics, however, the response was enthusiastic beyond all expectations. 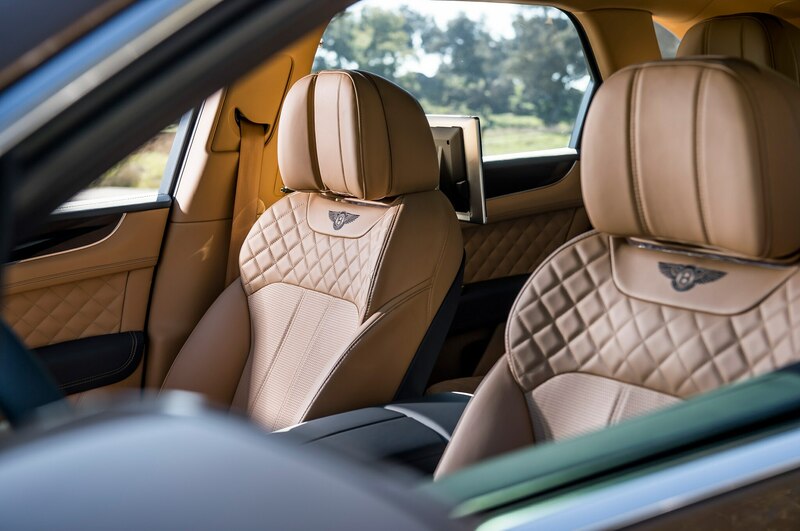 Which is why the interior was transferred virtually unchanged to the production model while the exterior underwent only minor alterations. 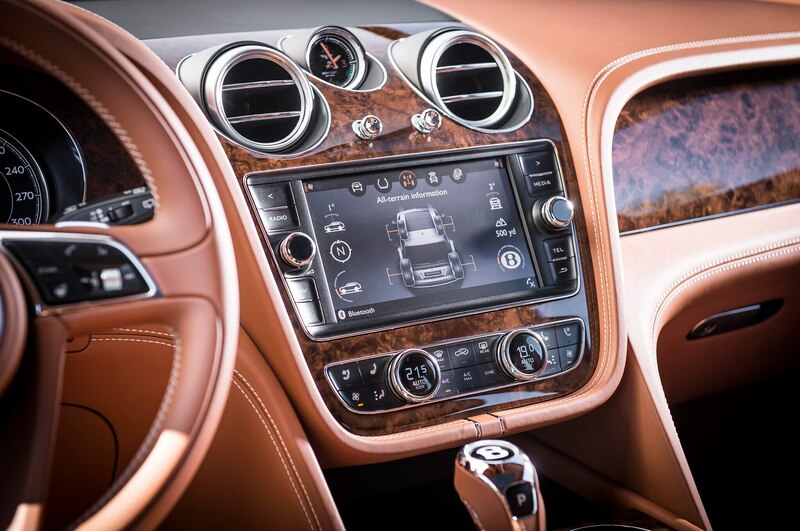 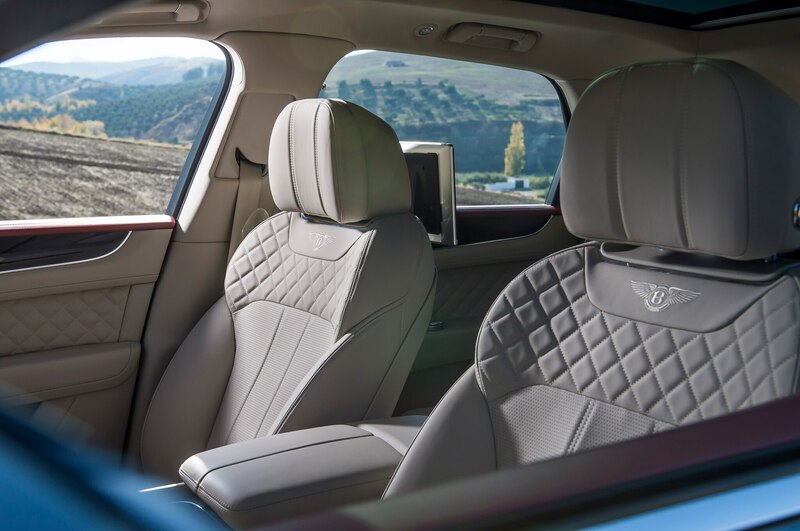 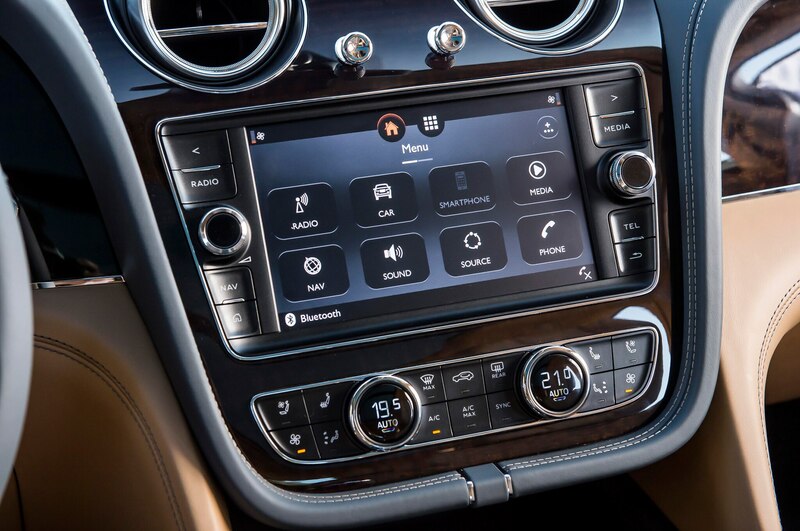 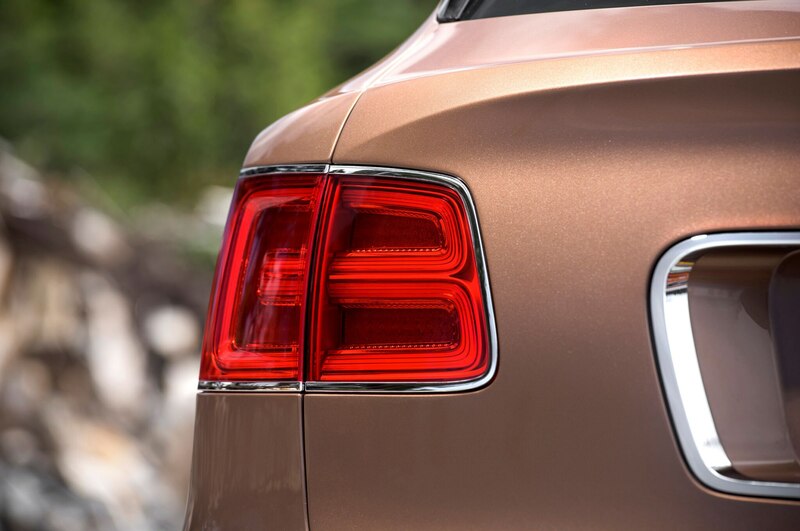 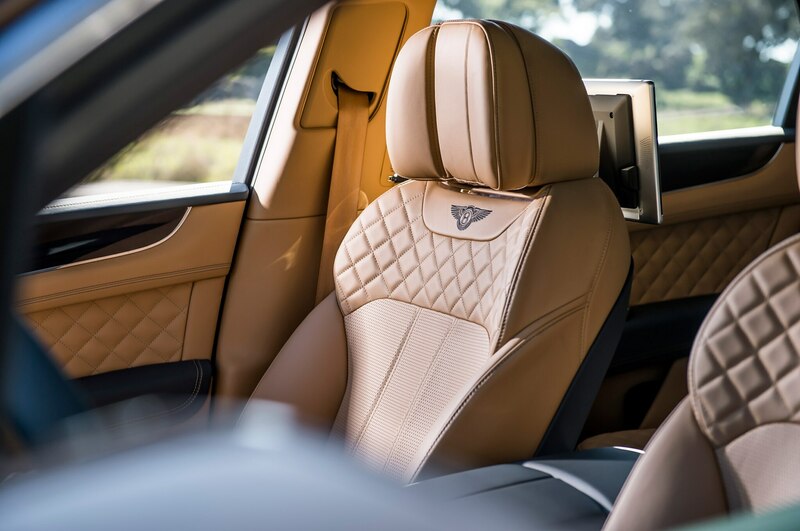 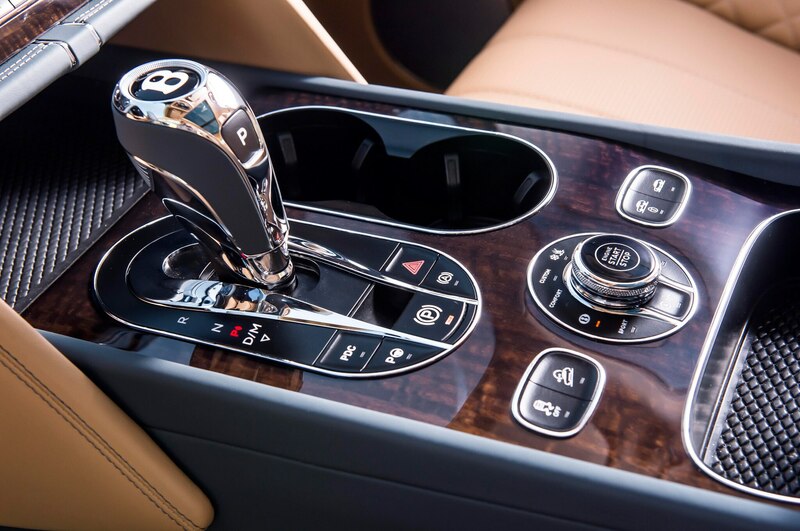 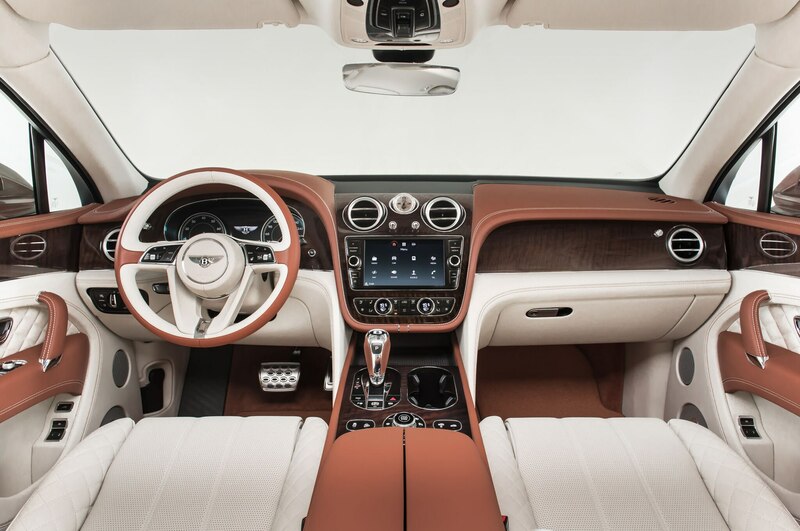 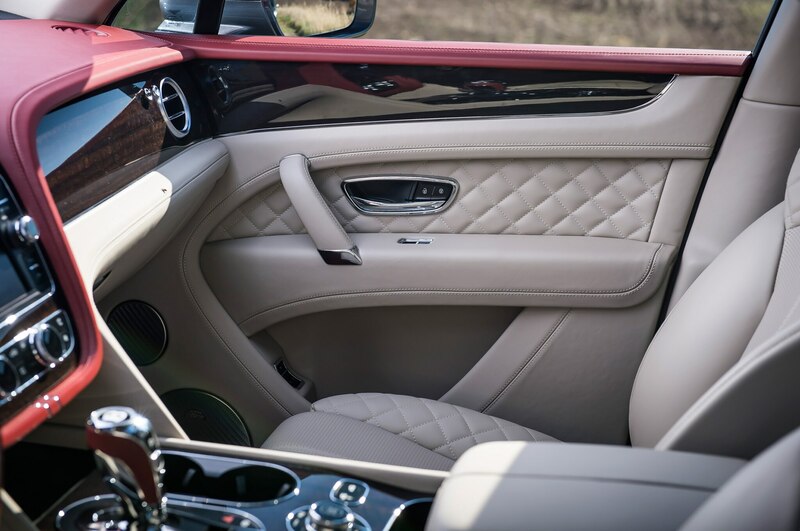 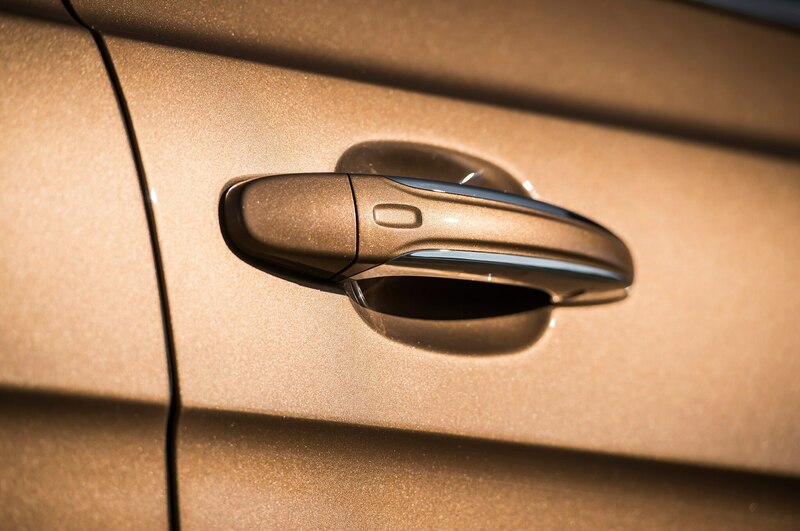 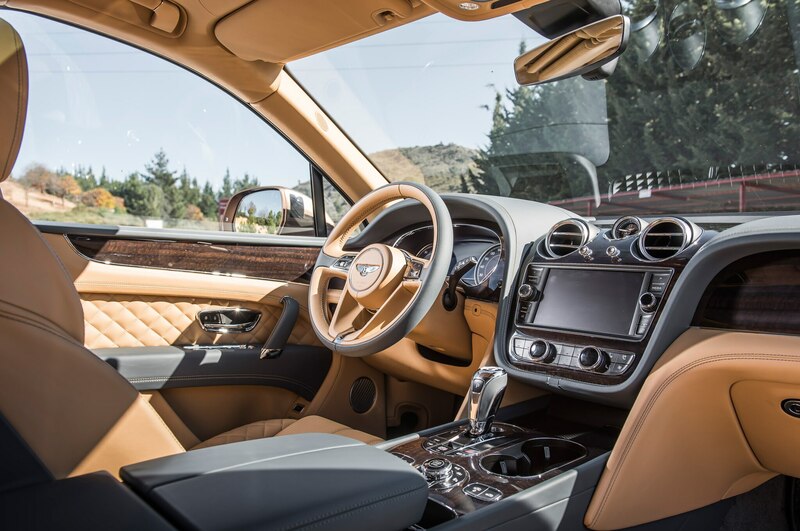 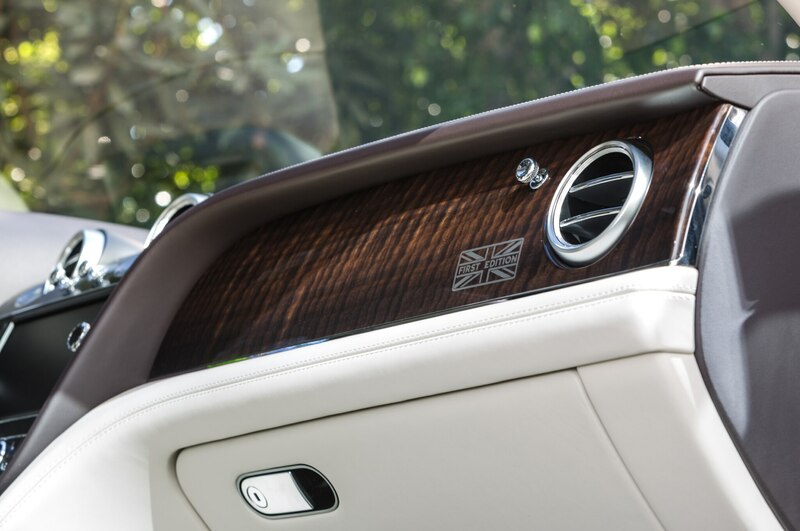 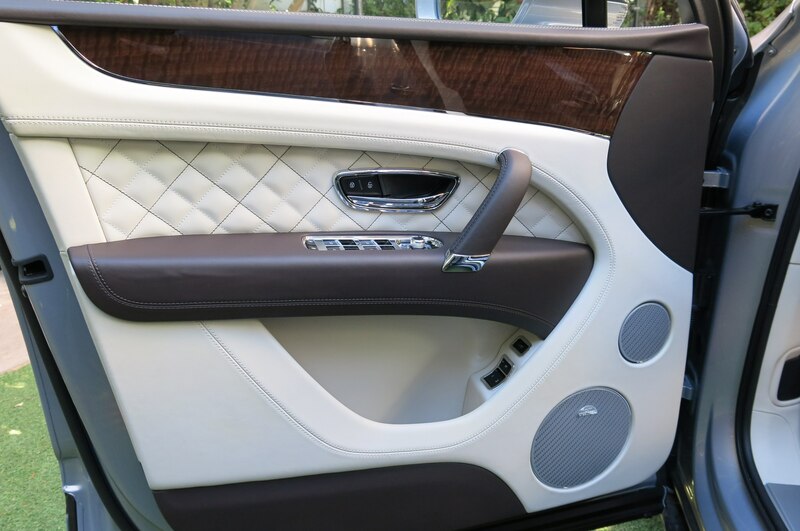 Although the olde world styling garnished with even more wood, leather, and chrome is said to grow on you, this conservative approach leaves the door wide open for a comparatively understated and elegant Rolls-Royce SUV. 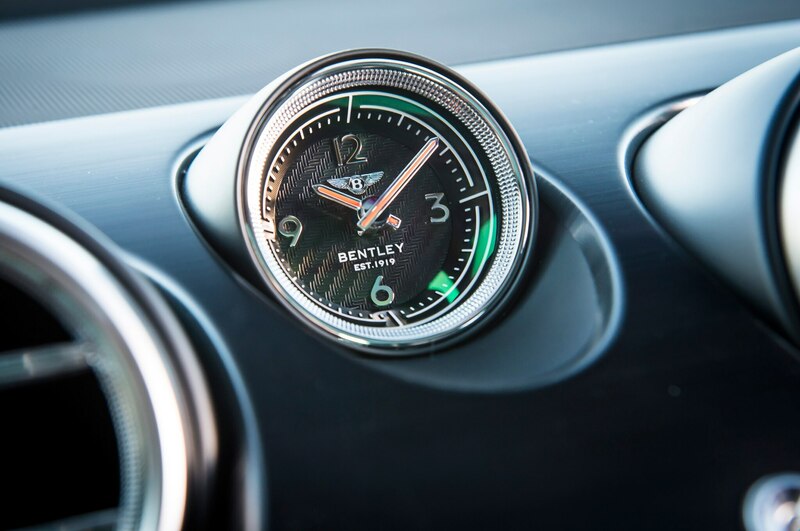 As usual, Bentley’s pricing is ambitious. 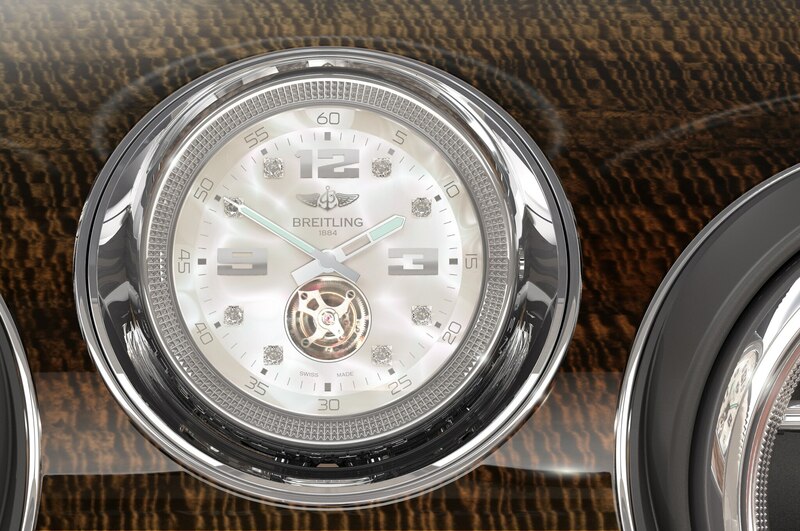 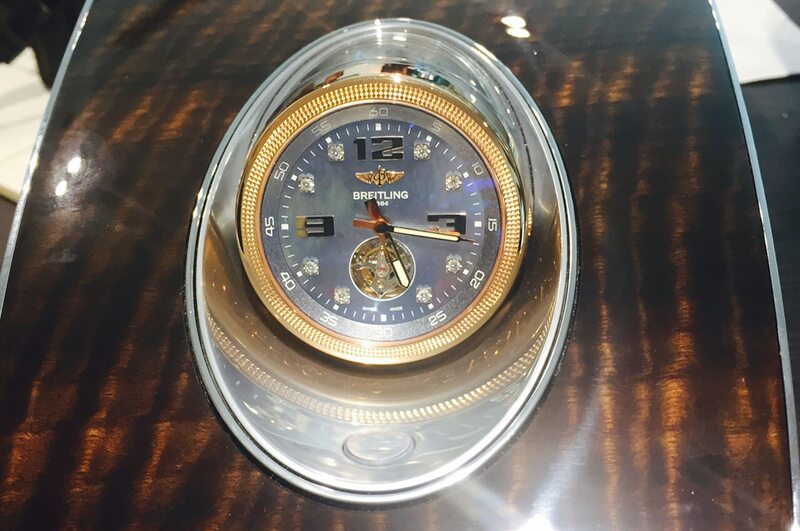 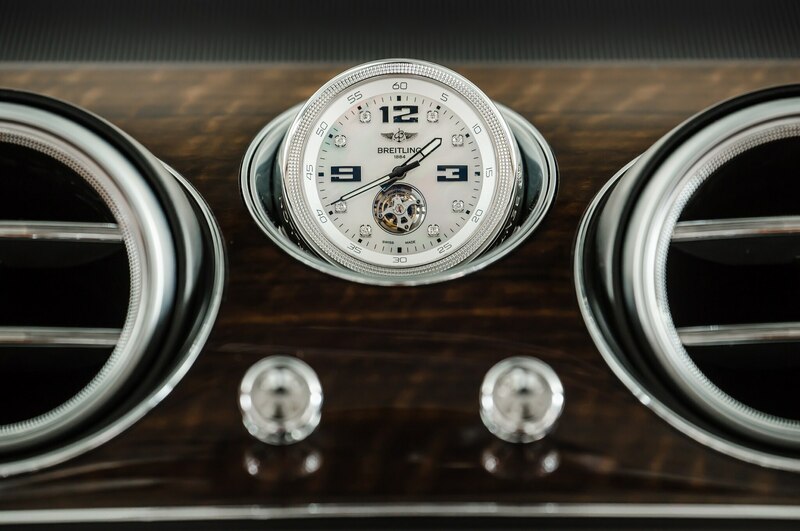 While two ashtrays and one cigar lighter are a, er, steal at $590, collectors are invited to pay 150,000 euros — U.S. prices will depend on the exchange rate — for a backlit Mulliner Tourbillon clock manufactured by Breitling. 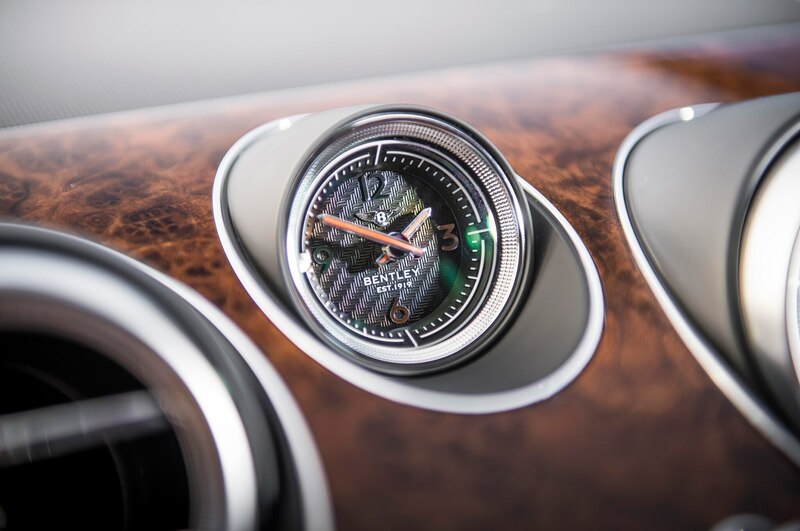 To obtain one of only 10 exclusive timepieces available per year, you must of course first buy a Bentayga — the production of which, some 5,500 units annually, is already spoken for until the end of 2016.